The human memory is a wonderful thing. Given enough time, one will remember all the positive moments, the epic events and personal victories one has encountered. I even think that somewhere in the back of the cranium there is a bit that embellishes the historical events to make them even more glorious than they may have actually been. If that is even possible on the official SI unit scale of glory. Even more significant is the fact that your memory will turn dark moments of pain and discomfort into some sort of internal badges of heroism. 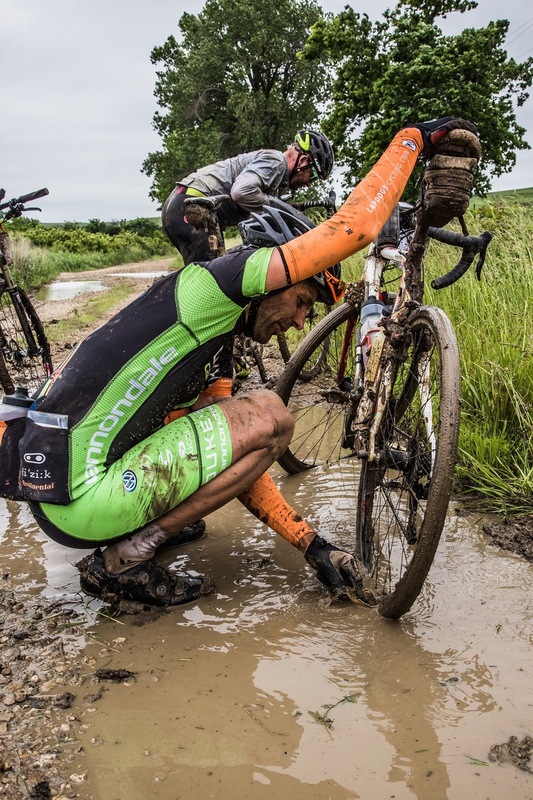 How could one forget the joy provided by the on-course bike cleaning stations of the 2015 DK200? Therefore January 14, 2017 8AM Central Time was a momentously important moment in my 2017 cycling calendar. I had to go scratch that Dirty Kanza itch again. It wasn’t just because I wanted to (hopefully) experience the Flint Hills with less mud than 2015, or because I wanted to improve my result. 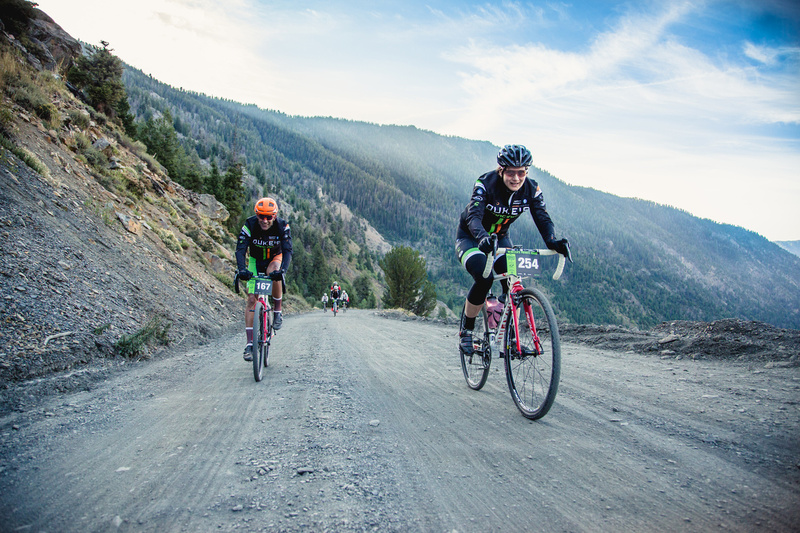 I wanted to go back to that dark cave of suffering, those moments that inevitably occur at some point during a race that lasts well north of ten hours. I wanted another internal hero badge. I had mentally committed to the 2017 race much earlier, and by the middle of January, my training was already well under way. 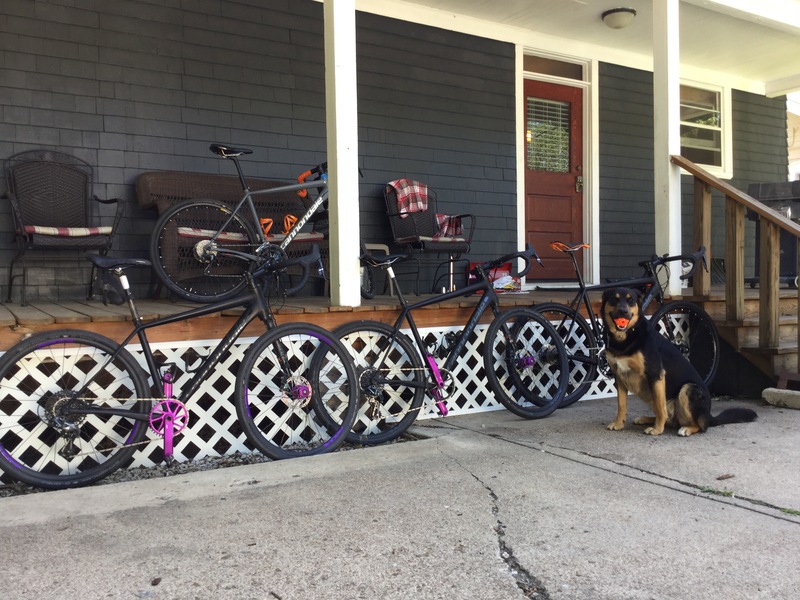 Bruno and the bikes, all ready for another adventure. So, there we were, at the start of our 17-hour drive to Emporia, Kansas. 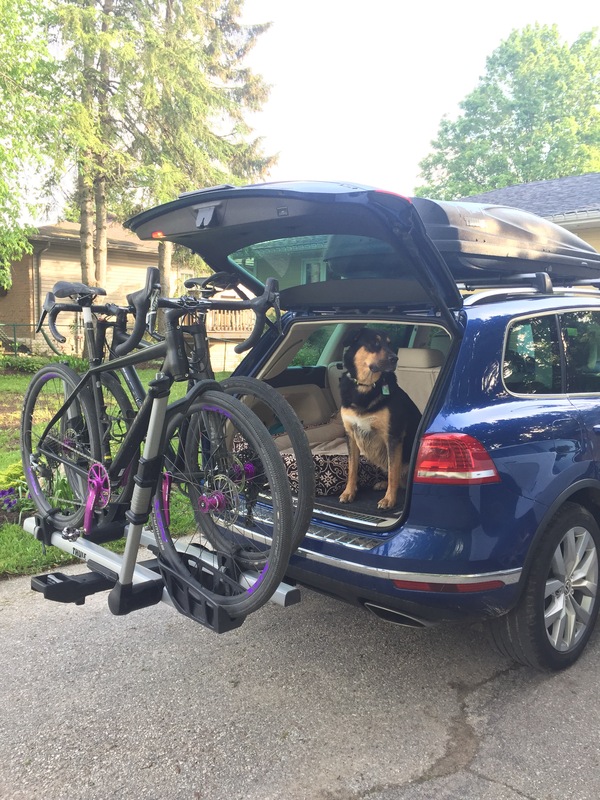 The Touareg was loaded up with the three of us (Robin, Bruno and me), two Cannondale Slates, a rooftop box full of our stuff and our spirits full of hope and excitement. 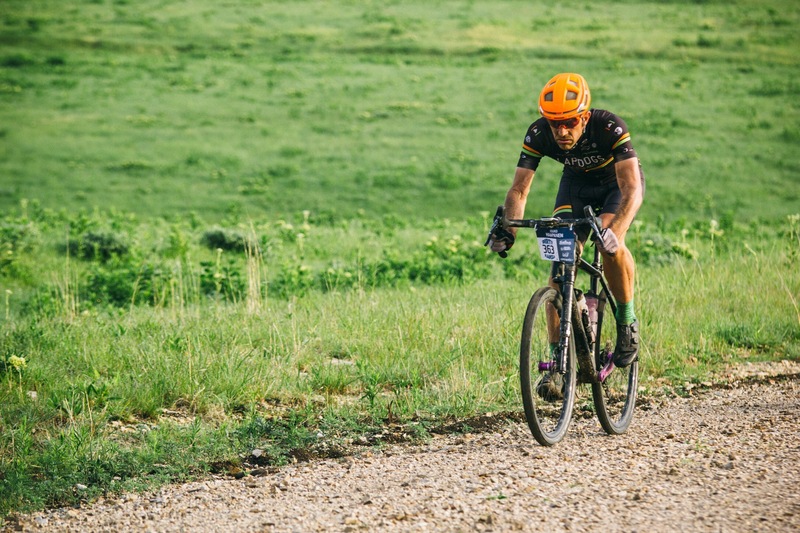 We had similar feelings of hope and excitement two years prior, when we made our very fist trip to the Dirty Kanza, but on that first occasion, we also shared some feelings of nervousness and anxiety of the unknown. This time, we know what I was getting myself into and my training had gone 99% to plan for the winter and spring. 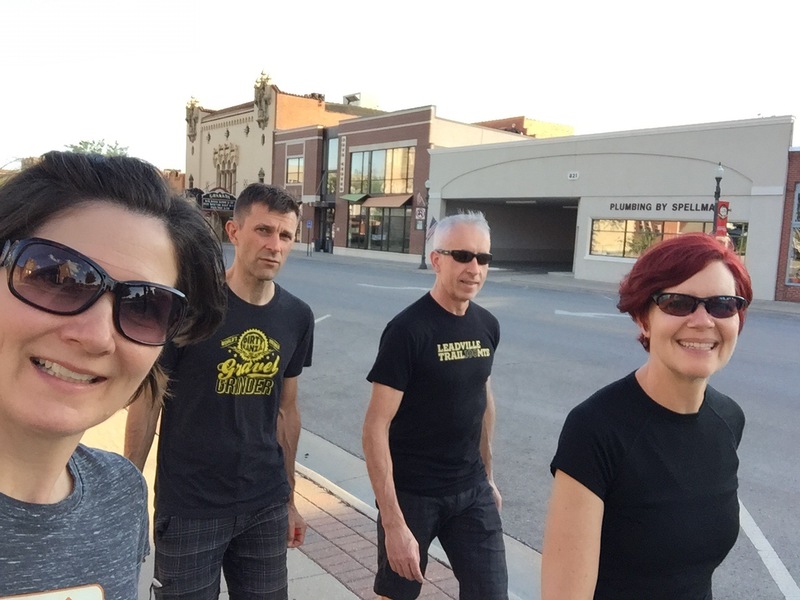 Our motley crew on a Monday evening walk in downtown Emporia. Robin, Bruno and I, Ian and Joanne had rented a house just two blocks from the start. We had arrived in Emporia on the Monday, giving us four full days of hanging out and relaxing before the race. It was a great week, watching the city slowly come alive as the race day grew nearer, relaxing, eating, even having the odd beer or two. I do think this was the most alcohol-free week of 2017, as I wanted to enjoy good quality sleep during this week. The good pattern of length/quality of the sleep was somewhat interrupted by our evening at the historic Granada Theatre on Thursday evening. Theatre you say? Yes, the cultural highlights were provided in three distinct acts; Flat Duo Jets, Agent Orange and Reverend Horton Heat. Most awesome, although crawling to bed pas midnight was not ideal. Oh well, I don’t thik this would have an impact on the financial payout the race on Saturday were to provide me. We were in Emporia to have fun and ride our bikes. We had fun. The riding part was to follow on Saturday. Bruno guarding the Slate fleet. Friday morning we headed out to the GU Stroopwafel ride. This was a relaxed group ride organized by the everyman’s DK200 hero, Yuri Hauswald. 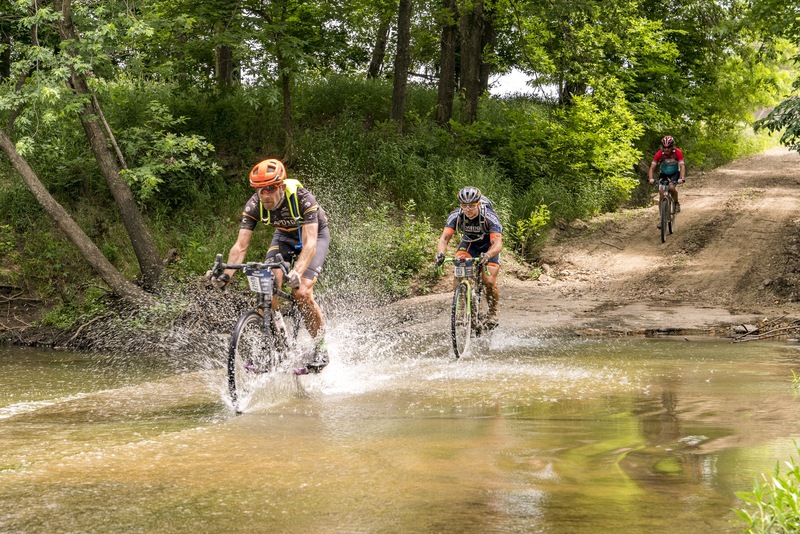 Yuri’s victory at the 2015 mudfest has permantly affixed him in the heroes of cycling column in my book, I wasn’t going to miss a ride he was organizing. 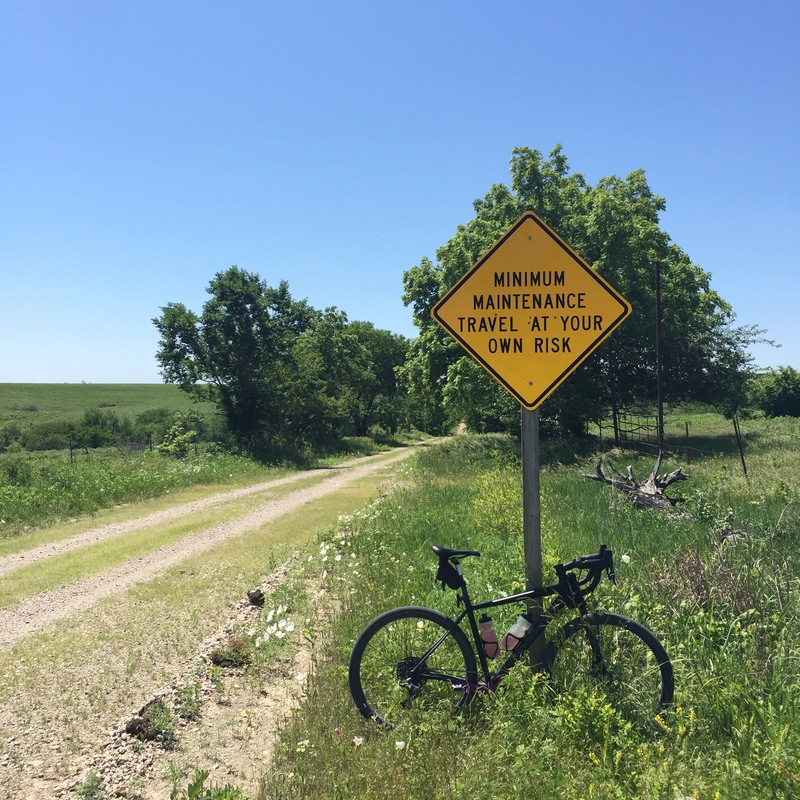 The ride was relaxed and meandered about the outskirts of Emporia, never leaving a paved surface. Easy peasy! After the ride, back to the house to start final preparations for the effort that was awaiting us on Saturday morning. Always happy to see Yuri! I felt great as the race started. It was as if my mind took the beginning of the race as the culmination of the training and wanted me to celebrate this occasion. I think that part of my mind was a bit premature in celebrating. Having said that, the start was pleasant. 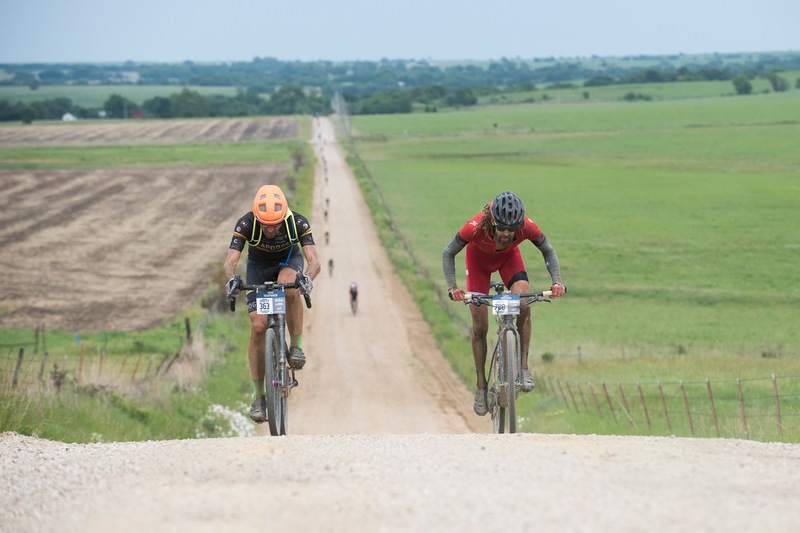 The pace was reasonable until the neutral start vehicle pulled away at the start of the gravel just outside of Emporia. At that time, the pace picked up noticeably. I felt comfortable pushing the pace a bit, wanting to stay in the main group as long as I could. As we approached the 20-mile mark, the leaders started pulling away from the main pack, but the pace remained high in the main group. The Slate was working flawlessly, the weather was fantastic. I’m sure birds were even singing. Then, pfft-pfft-pfft-pfft-pfft…I look around wondering whose tire that might be, and my 180-degree glance is no more than half done when I feel the back tire getting squishy. So much for the singing birds. I wave a quick goodbye to my teammate Ian, and pull off to have a look. The rest of the main group steams by at 20 mph, like a herd of bison on the grassland prairie. I see the 3-5mm cut in the sidewall of my Schwalbe G-One tire, sealant oozing out and do my best to see if the sealant will do its magic. Shake wheel, pump in some air, shake again, pump again, put the bike down and test. Or some other sequence of these actions – it’s all a bit hazy as some of these actions in hopes of sealing the cut may have been done during a short temper tantrum. No such luck, as soon as I try to increase the pressure, the air starts escaping again. Off comes the wheel, in goes a tube. Remain calm. Quick fill from CO2, wheel back on and get back on the bike. Nine minutes. Nine minutes is an eternity in the early part of the race when the large groups are still together. As I pedal away, I manage to find a positive state of mind, telling myself that there are almost 190 miles left to make up time. I get in the drops of my Easton AC70 AX bars, put my head down and start working. I bridge gaps between riders and small groups, taking small breaks every now and then before going for the next gap. This clawing back continued for the next 90 minutes/45km as I try to make the most of leg 1 before pulling into Madison for the first aid station. Sadly, I had made up positions, but my pace had not been any faster than that of those that I had originally been racing with. I arrived In Madison to be greeted by Robin and Joanne, with my team-mate Ian already long gone to leg 2. Do I look angry? I may have been angry. If one were to spend hours analyzing the data on the Strava Fly-by Analysis page, one could conclude that recovering from being nine minutes behind was tricky at best once working mostly alone. In fact, all I had managed to do was keep pace with the group that I had been riding with, arriving in Madison close to 10 minutes behind. Once in Madison, I received two full bottles and a full Camelbak, all filled with GU Roctane. These replaced the three bottles I had started with, now approximately half empty. The leg had been cool and relatively fast, nor had I felt hungry as I had not touched any of my GU gels or chews. Robin helped me change the rear wheel to a spare (actually off of Robin’s Slate) so I could resume the journey with two tubeless tires and full of hope. With the extra fussing involving the wheels swap, the stop took nearly 10 minutes. Yeah, we aren’t at F1 levels of efficiency yet. I pedalled off to leg two, knowing that I could really use a few other riders who were looking to make up a bit of time. Nada. Nothing. That’s what I found for the first half of this leg. This was continued payback for failing to remain in the faster groups at mile 20. At least my mental game was improved. I had made it to aid 1 with my tubed rear tire and now rolling tuneless was full of confidence and was determined to just keep on pedalling at a pace I felt I could sustain for the next ummm….ten hours or so. 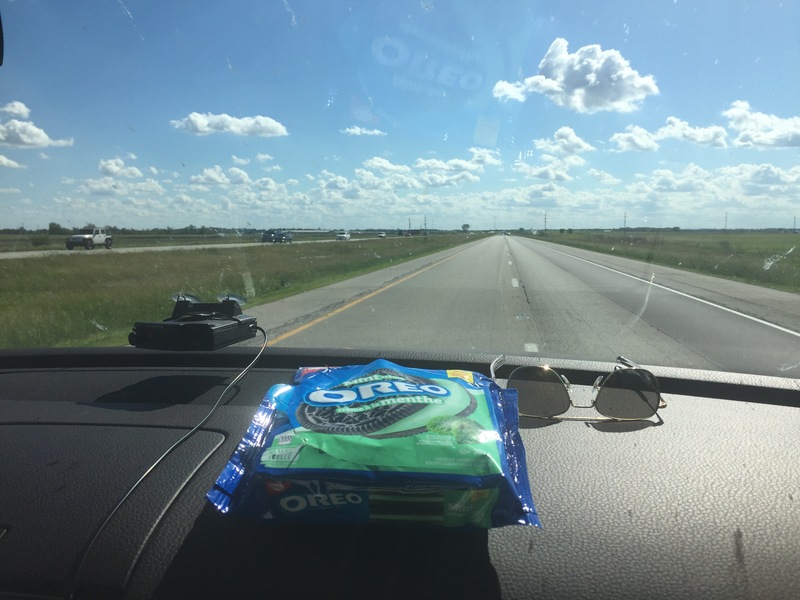 In 2015, on our first trip to Emporia, I had an objective of finishing before sunset. This just seemed like an appropriate objective for one’s first DK200. The conditions caused me to miss that objective, finishing in 15:10:45, good for 63rd overall and 10th in my age category. Naturally, for our return, I had trained smarter and harder, I knew what to expect (I really thought I did) and I had retired the beloved Ridley X-Fire in favour of a Cannondale Slate CX1. It had worked for Ted King, so it must work for me (it did, and my body thanked me for it). Not many water crossings this year, it really was dry. After the flat at mile 20, it had taken me the rest of leg one to really calm down. I hadn’t suffered a single flat in 2015, it seemed cruel and unusual punishment to have suffered on so early. But I now on leg 2, I was content to keep working away at gaps and by the second half of leg 2, I seemed to have found some pace again. 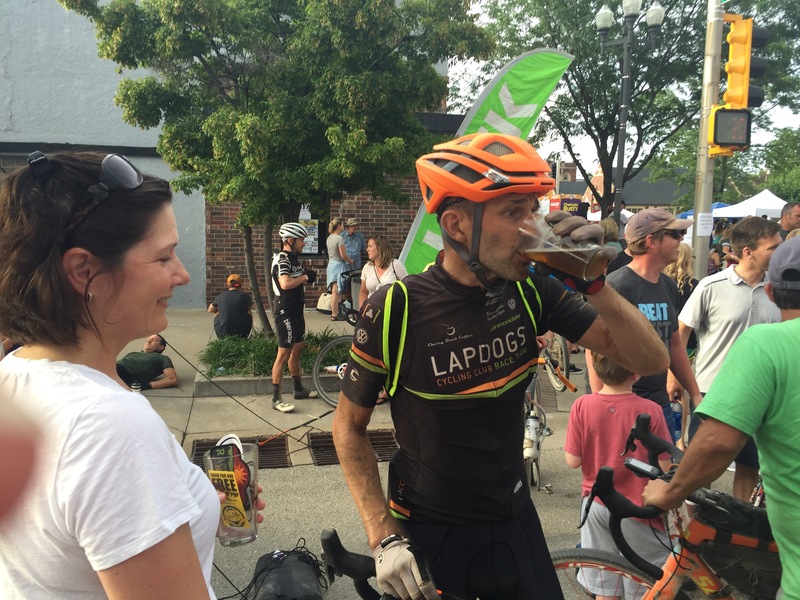 I had reached the first checkpoint in Madison 15 minutes behind the leader 20th in my category. 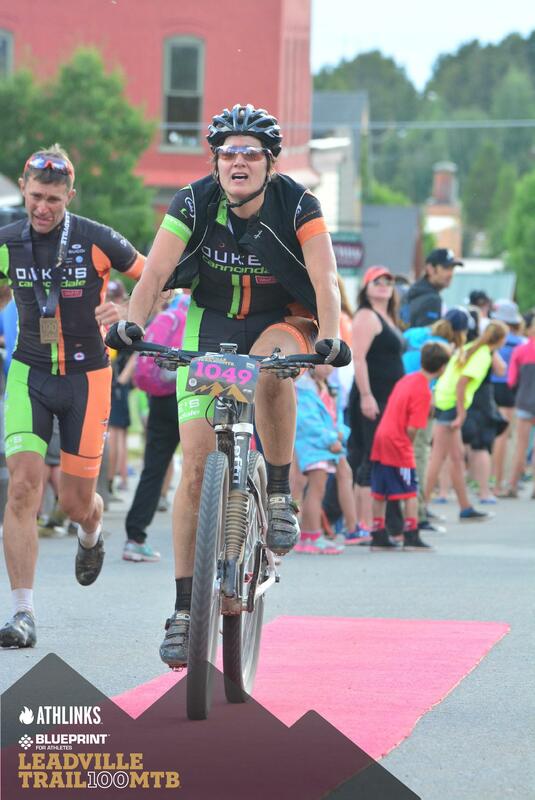 By the end of leg 2, as arrived in Eureka, the gap was 25 minutes and I was 11th in my category. And, I was starting to feel good. 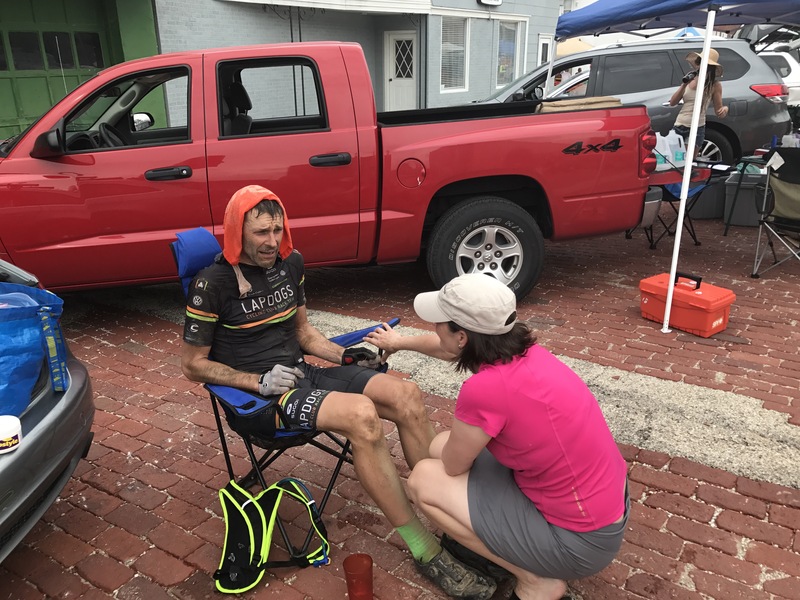 It was also my first sighting of Ian since that sidewall puncture at mile 20, as was rolling out of our aid station about the same time as I arrived. The stop at aid 2 was relatively quick. Replace Camelbak and two bottles with fees Roctane, and replenish my first food I’d eaten – one package of GU chews, and one GU gel. Not a big eater. Back out and feeling I can make some hay. As leg 3 got under way, the day was getting noticeably warmer. Now worries, I can deal with heat. I remember heat from the summer of 2016. I think. Spring of 2017 was a cold one in Ontario. Back in 2015, I recall doing much of my later DK training, in May, in hot weather, easily around 30C. This year, I hadn’t done an outdoor training ride without a vest, cold hands and toes, and the odd unscheduled stop at a coffee shop or gas station to warm up my hands in the bathroom hand dryer. But heat is heat – if you’ve dealt with it once, you’ve experienced it and know how to deal with it. Or not. I pushed on thorough the leg, hoping to make up some more ground by the time I would get to Madison. I was enjoying the roads and the terrain, my speed was good, but I was hot. Hot, but managing the heat and watching my hydration both for sufficient drinking and for managing the reserves. Then, around mile 125….pffft-pffft-pffft. How is possible? Again? I stopped in the bottom of a set of fast rollers, looked at the sealant oozing out of the sidewall and once again, attempted to shake and wiggle the wheel (still attached to the bike) to see if it would seal. It would seal momentarily, but as soon as I put the bike on the ground and applied either pressure with the pump or my weight on the bike, the leak would open up. Time for a tube. As I fussed with the tire, stationary, the ambient heat became much more noticeable, and I had to keep hydrating as I fixed the tire. Suddenly I was feeling a bit off, body was full of chills, and I sat down to work the tire repair. Tire on, filled with (my last) CO2, and roll away. Not feeling great. I’m sure I’ll feel better soon. Wait, what’s that sound? I don’t quit races. I don’t even think about quitting races. I don’t necessarily place well, but if I’ve started something, I’ll finish it. But suddenly, I found myself only a few scant metres from where I had just fixed a flat, with another flat. Demoralized, I watched riders go by at high speed as they descended one roller to carry speed to the next climb. I decided I would never race my bicycle after this day. In fact, I may just not ride a bicycle again. I had reached that point. I had one more tube left. What if that tube blows? Why had this tube failed? Had I missed something embedded in the tire? Back to sitting in the sun, working on a tire, getting hot, and drinking away at my Roctane. For the first time, I found myself thinking about quitting. Whatever time I may had clawed back since the flat on leg 1, was once again gone. And more. I spent nearly 20 minutes with this double tire debacle, in my heat fatigued state, not working smart or efficient, before I was rolling again. The body was shivering with chills, and only the remoteness of that part of the race course and the distance remaining to aid 3 kept me from quitting. I rode gingerly towards aid 3. How does one ride “gingerly” in the Flint Hills? I don’t know, but I could not suffer any more tire troubles before Madison, for I had no more tubes. 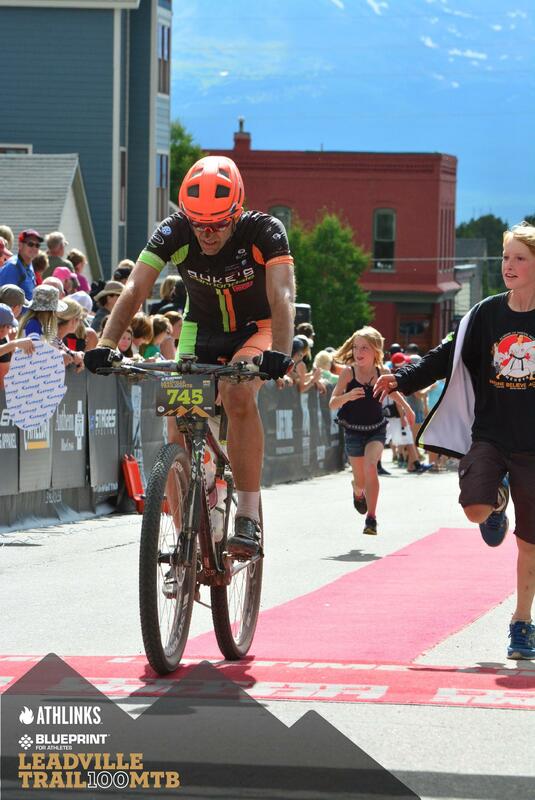 After a few minutes had passed and I was again more focused on my race than the drama of tires and goosebumps, I started doing the math on the distance and time remaining before aid 3 in Madison. Suddenly, I was concerned about my Roctane reserves. I had consumed much more than expected, and keeping the Camelbak hose in my mouth as I worked on those tires had clearly been a bad idea. From the tire debacle around mile 125 to around mile 145, I was feeling somewhat confident of my supply situation. I even ate a package of GU chews as I pedalled in the afternoon heat, continuously doing mental arithmetic. Although I was (by some strange miracle) accepted into, and even graduated from an engineering program, math was never my strong suit. I probably should have started endurance racing at a much earlier age, for all those hours on the bike seem to get eaten up by doing mental arithmetic. There are many variables at play; elapsed time, time of day, current speed, average speed, total distance, distance from last aid, distance to next aid, volume of fluid reservoirs, volume consumed, volume left until next aid, and so on. Add to that the excitement of unit conversions – how many mL are in fluid ounce, what exactly is 42 miles * 1.6309 miles/km? Is that a lot or a little? Did I carry the three? Repeat the calculation to confirm. With about 20 miles left in leg three, the longest by distance and by time, I had confirmed through multiple equations, that my fluid supply was running really low. In fact, I know my 1.5L Camelbak was as dry as the desert where Camels come from, one of my bottles was completely empty, and the second bottle may have had about 20% of its 26 fluid ounces (or is it 750mL, which isn’t actually the same at all!) left. The remaining Roctane, aptly of the Tropical Punch kind, sloshed around the bottom, as if it was teasing me to just gulp it down. At this time, I had caught up to Garth Prosser, who was not having a great day either. We commiserated about our depleting fluid reserves, and by the time there were ten miles left in leg 3, we were both running alarmingly low. Ten miles seems like such a short distance. Seriously, 16.309km is just a hop away, who needs to drink? We did. After nearly eleven hours of racing at a good clip, some of it at what my Finnish-Canadian body would refer to as high heat, constant topping up of the system required. I started thinking about asking other racers for fluid assistance, but alas, there weren’t a whole lot of others around us. We kept pedaling, taking turns pulling at what had suddenly become a diminishing pace, barely averaging over 20km/h in these miles of thirst. 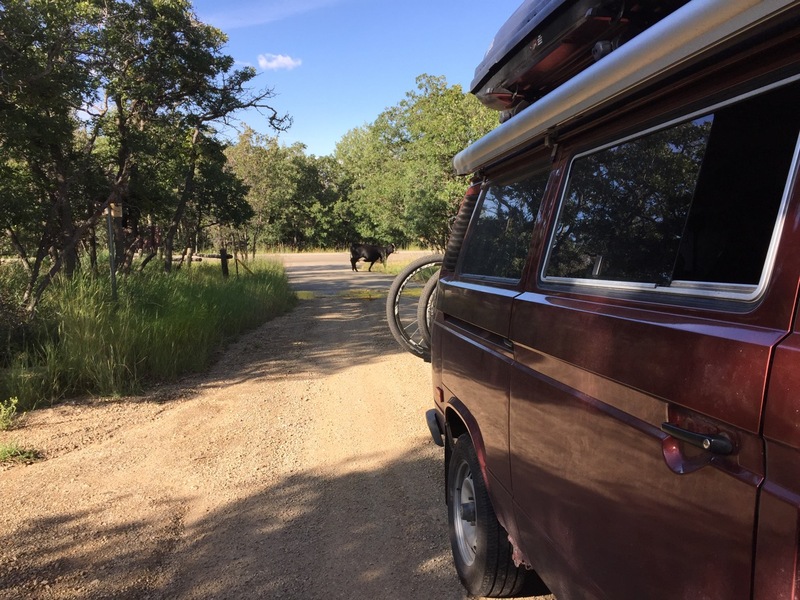 Suddenly, as we descended a hill on Township Road 232 towards a t-intersection with Township Road 213 (I had no idea of the names, had to look up on Strava), we saw a rancher and his family, camped out at the intersection with a cooler of water. It was the closest thing to Christmas I had seen since Christmas. We stopped, happy, relieved and thankful, had a quick drink and refilled one bottle for the remaining six miles to aid 3. Our spirits were lifted and we pressed on. Arriving at aid 3, I beelined for the chair, for the first time. I was no longer concerned about my time, or my placing, I needed to cool down and re-hydrate for the last leg. 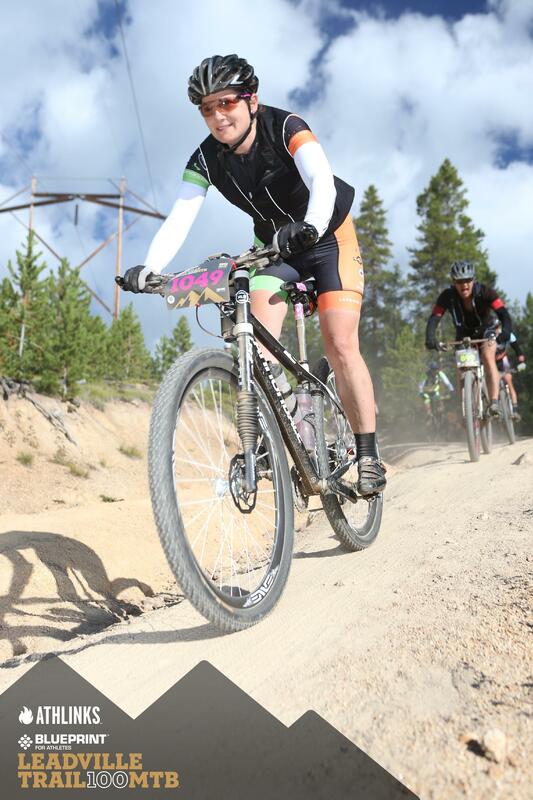 I was now just over an hour behind the leader in my category, and dropped down to 17th position. My team-mate Ian was still at the aid station, it was clear he was feeling the effects of the heat as well, but he rolled on as I sat down for my well-deserved rest. I wanted to go into those last 50 miles feeling good (relatively speaking) and enjoy the feeling of nearing the end of a long, memorable day on the bike. Robin stuffed the back of my jersey with a pantyhose full of ice, and covered my now un-helmeted head with ice-cold towels. I drank some water, ate some watermelon, and collected my psyche in preparation of getting on the bike. Robin offered to replace my rear wheel with my now newly-tubeless-tire-equipped wheel that had been pulled at aid one. I declined, after taking a little while processing the decision in my head. With only 50 miles to go, I no longer wanted to fuss with the bike, I just wanted to pedal to Emporia. I had spent ten minutes at aid 3 cooling down, and although it was much longer a stop than I had hoped to stop for, but I had needed some cooling assistance. It was now past 5pm, and the radiant heat from the big ball of fire in the sky was diminishing. The temperature remained high, but I no longer felt like I was stuck in an oven under the broiler. I rolled out, feeling like a new man. It is hard to explain how much better I felt after hydrating, ice packs, cold towels and now, a full Camelbak and two bottles full of Roctane on board. I did much math and confirmed that I should be able to finish somewhere around 13.5 hours or less, assuming no more troubles with tires or other hiccups. I worked mostly alone for the first 20 miles of this last leg, making up some ground in my refreshed state. I hoped to be caught by a faster group to work with, but I couldn’t wait to see if it was going to materialize. Around the half-way point of the leg, a group caught up to me, and I latched on. My speed picked up a bit now that I was working in a group, and I managed to get a little rest. With only about 25 miles to go, my mood was positive and I no longer worried about my bad luck with tires throughout the day, nor was the heat of just a few hours ago much more than just a fading memory. The mind had flipped over to victory mode. Everyone who toes the start line at the Dirty Kanza is a winner in my book. Just to commit to the effort and roll out of Emporia at 6am makes you a winner. Beyond that, the day is full of little victories of minor battles (and sometimes, little defeats), but once the end is near enough that one can sense it, the impending sense of victory in the war is palpable. For most of the racers out there, it isn’t about podiums and hardware, but it is about testing your body and your mind to its limits, about chasing those demons off your shoulder when they are egging you to quit. 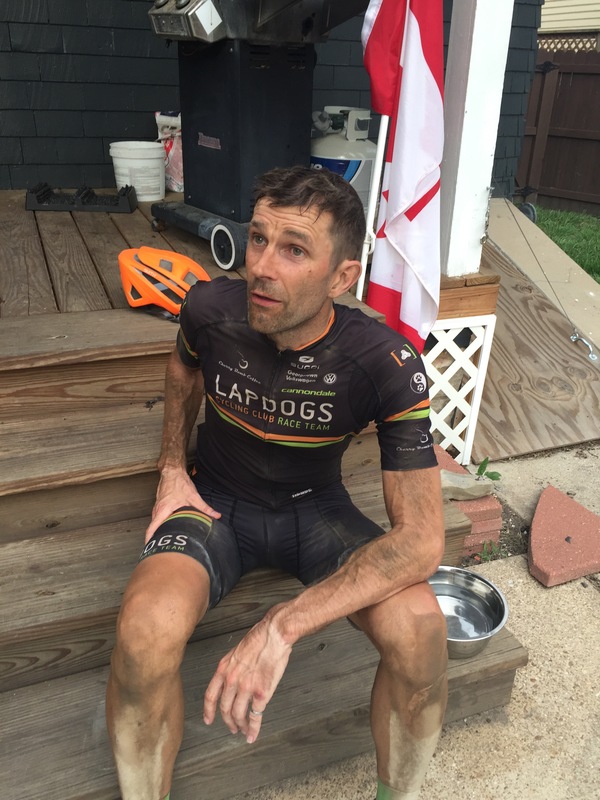 Dirty Kanza racers don’t come to Emporia to quit. Sometimes, stuff happens and one is left with a DNF, but no one starts the day with the thought of quitting, if the going gets tough. As we approached Emporia, the course took some turns away from the city, but knowing the course length of 206 miles, I kept focused on that. I counted down the miles, converted them to kilometres, though about how far that would be at home “hey, that’s just like riding from home to work – just a commute left!”. This from the guy who has commuted to work on his bike maybe five times in the last five years. 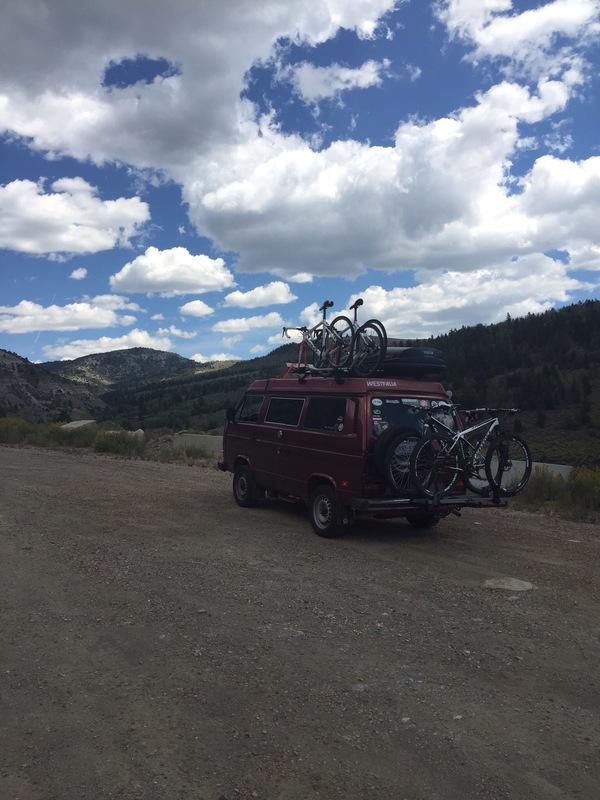 As we entered the last three or four miles and the road became permanently paved, I quietly started to believe that I would have no more tire trouble on that day. Thirteen hours, fifteen minutes after rolling across the start line, I was back on Commercial Street, now eyeing the course lined by cones and spectators. I put in my best effort of a sprint finish and crossed the line, to be greeted by Lelan Dains and Jim Cummins. 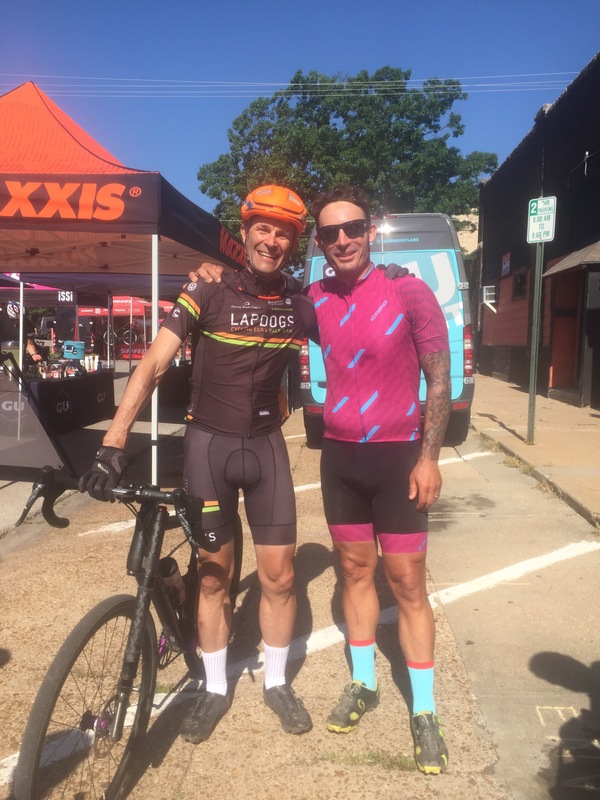 This the Dirty Kanza – the race directors congratulate all finishers at the line, whether your personal victory happens 11 hours or 21 hours (there has to be some cut-off!) into the race. It really is a special event. Once I had my finishers pint glass, 200 mile sticker, and race the sun badge in hand, I hobbled out of the finish corral to find Robin for some special hugs and kisses. She was the woman behind the man. She had committed to my training over the winter and spring as much as I had. 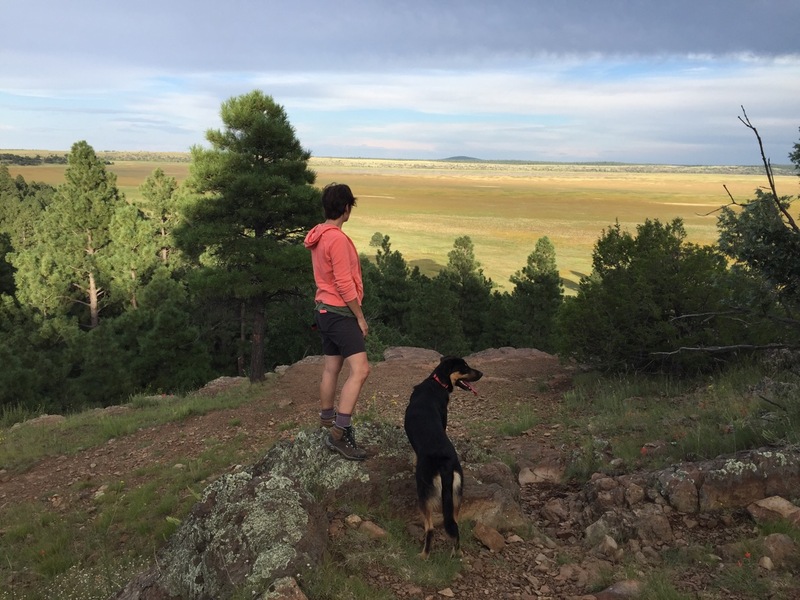 She had engaged our coach, Peter Glassford, to formulate a training plan for me as a birthday present back in November and she had taken care of the household chores and hiked with Bruno, when I was in the basement on the stationary trainer, or outdoors putting in spring miles. Even our winter/spring bike traveling vacations became all about my training plans. Robin really deserved the finishers swag as much as I did. My finish time was almost two hours faster than my 2015 effort in the mud. This time, the challenges had been different. I was very happy with my effort, I had left everything out there, gone to my dark cave on leg 3 and climbed out of it for the last leg. That is how it should be. My placing wasn’t what I had hoped it might be, but the DK200 isn’t really about placings for 90%+ of the people. It’s about going out there, leaving it all out there and, hopefully, coming out of there to cross the finish line in Emporia 200 miles later. Or 206 miles later. So, there it was, in the books, my return to the DK200. Done and dusted. No need to do that again. Nothing to prove to myself. Time to rest. 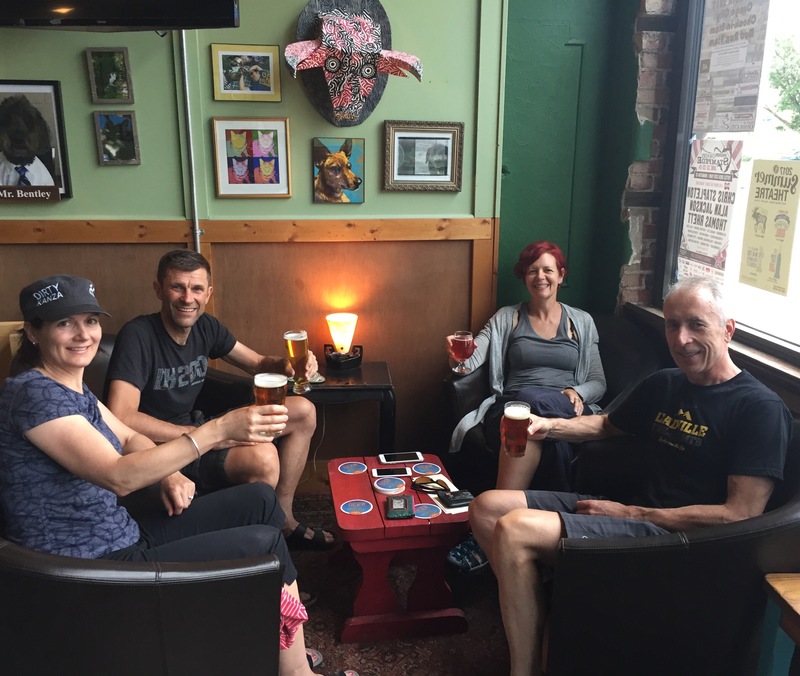 It was maybe the next day, as we sat around our beers at Mulready’s pub, when Robin indicated that she just may have some small desire to add the DK200 to her list of completed races. I even learned a new acronym, FOMO. I don’t think she is afflicted by FOMO, but having competed with me and on her own in so many events and now having supported me for two DK200 events, I think it may be time for her to add this to her bucket list of personal victories. 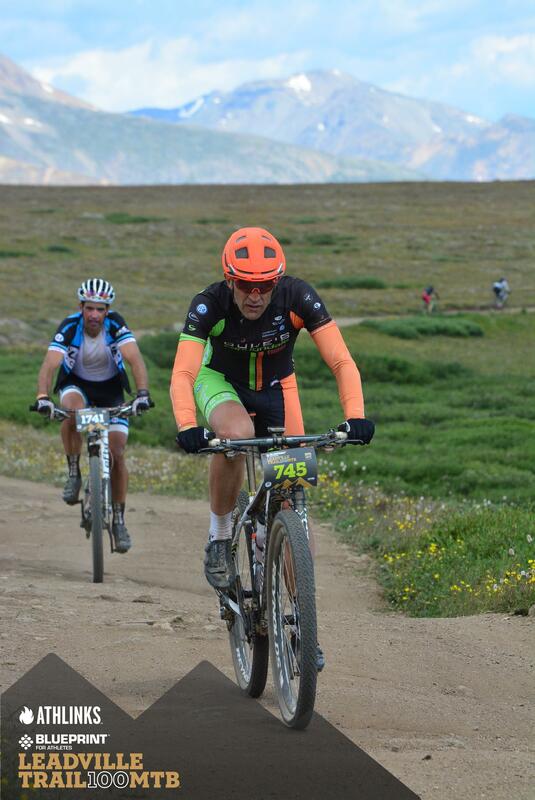 Maybe we could race together, like that well-oiled (but not well-trained) machine that we took to Breck Epic in 2014? I even joked of a tandem, but even I think that is far from any reality. I’m hazardous enough to myself on my bike, there is no need to risk your loved one’s health. A final thank you to the DK200 organizers, the wonderful people of the City of Emporia, all of the race participants and their supporters and our good friend and coach, Peter Glassford www.smartathlete.ca for keeping me motivated and accountable – I kept turning the pedals! Now, it’s time to commit some time to being a productive part of the household. Apparently there are tasks that do not involve bicycles that need to be completed on a regular basis. Wink. Minimum maintenance – my training plan for the next few months. I will preface this blog post with an apology for all of you who have been sitting on the edge of your seats for the last six months waiting for this entry. Once back at home, my blogging priorities were pushed aside by more mundane things like work, walking with Bruno and spending time on the sofa. We had projected the 3500km return commute from Ketchum, Idaho to Erin, Ontario to be approximately four Clifford-days. Even though this was the return leg of our six weeks and change journey, we were excited for this part of the trip. 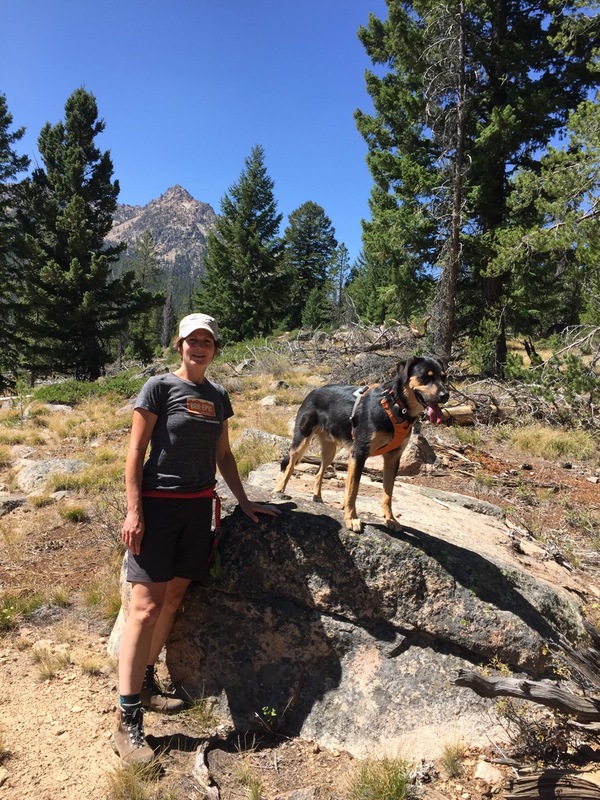 Although we hadn’t exactly been training hard or had any-pre-race jitters for Rebecca’s Private Idaho, there is always some strange relief when the race season comes to an end. No more thinking about the training ride you were about to embark on, or regrets about the one you missed. 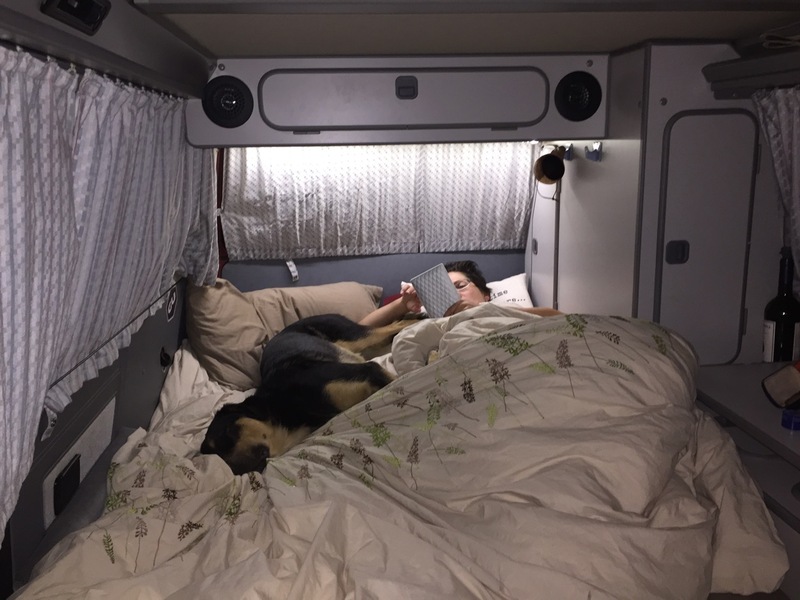 Just the comfort and safety of Clifford, cruising across the continent. We left Ketchum and headed east on US26 towards Wyoming. The day was non-eventful, we enjoyed the changes in scenery throughout the day. Early in the day, we were bewildered by the lava rock formations as we drove by the Craters of the Moon National Monument and Preserve. But, with much ground to cover, there was little time to hang around. Bruno had a quick #1 and #2 and we snapped a pretty picture. 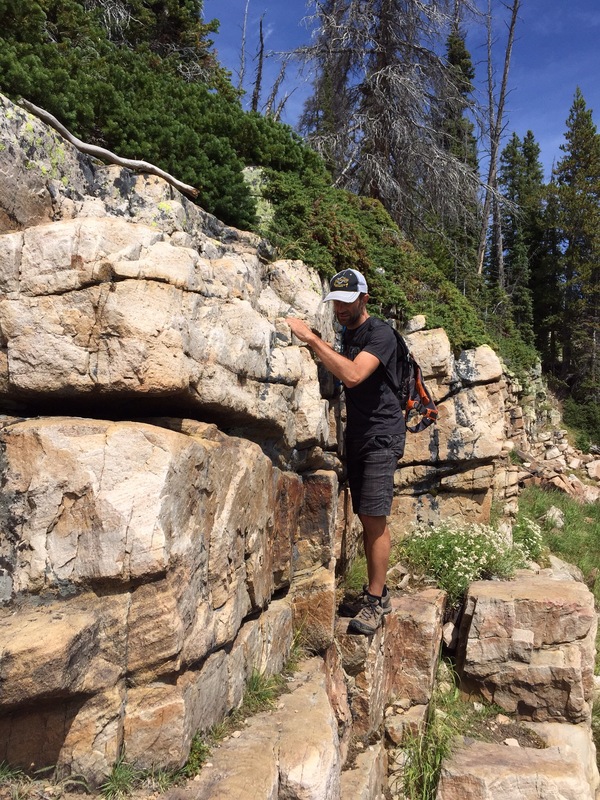 The drive over the Teton Pass crosses from Idaho to Wyoming and is “only” 8500 feet at its highest elevation, but the long stretches of 10+% grade were especially tricky on the descent. We were quite comfortable with the 2nd gear ~25mph climbing by now, but we hadn’t encountered such long/continuous descents without a chance to cool the brakes on our trip. Oh well, what’s an adventure without a soft brake pedal once in a while?!?! 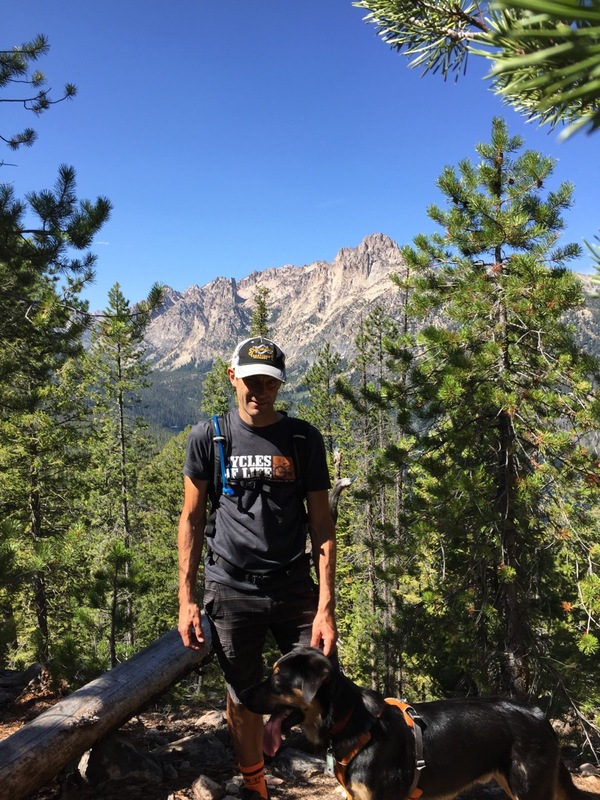 After our last mountain pass of this wonderful journey, we drove through Jackson along US191, nestled between the National Elk Refuge and the Grand Teton National Park. The scenery was most epic, but you’ll just have to take my word for it. We pressed on to Dubois, Wyoming for the night. As this was a “transit day”, we were quite content in selecting the local KOA for our accommodations. Before arriving in Dubois, we found a nice mountain plateau for a little outing with Bruno. Warm, windy and full of prickly growth – but so much fun for the little man after spending most of the day in Clifford. Sadly, we did miss the Wyoming State Chariot Racing Championship by ten years or so. The KOA was relatively nice, and mostly empty. 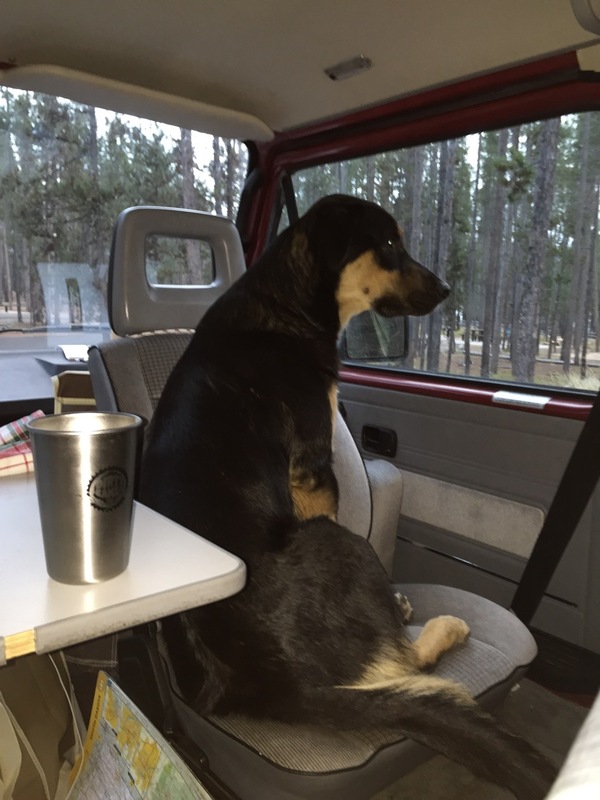 The hosts were getting ready to shut things down for the season and head to Arizona for the winter.Robin and Bruno enjoyed the company of the larger four-legged creatures at the campsite. The next morning, we pointed Clifford toward the much-underrated state of Nebraska. 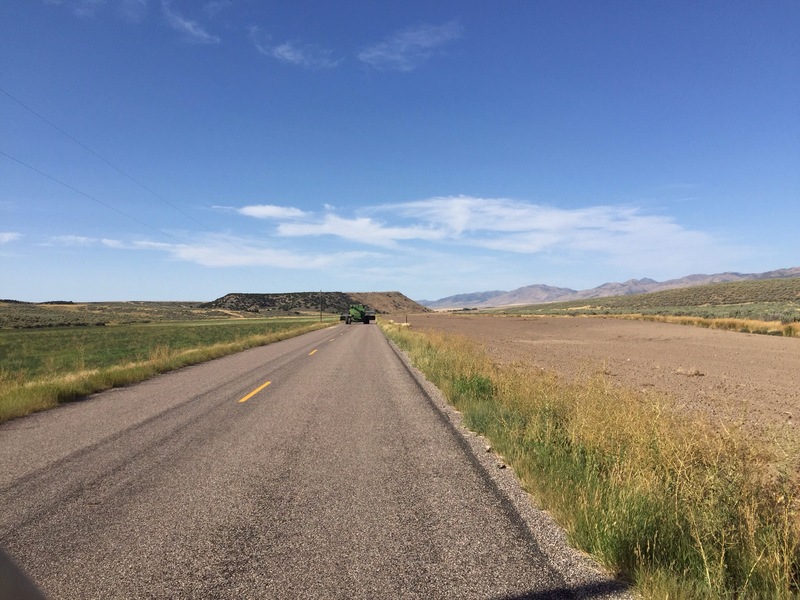 The drive through the eastern portion of Wyoming was made more exciting for us by what appeared to be Clifford’s first mechanical fault in the six weeks we had been on the road. About an hour into the drive, the fuel pump would cut out intermittently, causing a momentary lack of forward thrust from the trusty 2.1L Wasserboxer. I pressed on, deciding that I was not going to replace the pump until it quit. The condition lasted a few minutes and wasn’t bad enough for us to come to a stop. This symptom would repeat itself a few times on this day, but I had little interest in getting under the van for arm and facefulls of fuel to replace something that was kind of working. I’m sure Robin and Bruno didn’t want to travel with anyone covered in Eau de Unleaded either. Although the drive across eastern Wyoming and western Nebraska wasn’t bad, the plateaus of the great plains just weren’t as magnificent as the mountains we had become accustomed to. We drove through the sparsely populated northeastern Nebraska along the historic US20, also known as Bridges to Buttes Byway. The towns were somewhat frequent, but many of them were almost completely deserted, with population signs reading numbers as low as 20 or below. It was a hot day and it was tricky to find any shad for a daytime walk with Bruno. We stopped along US20 and did a short walk on the Cowboy Trail, a rail trail built along the old Chicago & Northwestern Rail line. Apparently cattle are not welcome on the trail. We made it as far as the Cottonwood Lake recreation area for the night. The recreation area was nearly completely deserted, so we commandeered a nice spot by the lake and settled in for a little frisbee fun. We had spent ten rather hot (at least it was a dry heat!) hours in Clifford, and the setting sun brought along nicely cooling temperatures for a little R&R. In the morning, we packed up quickly and pointed ourselves east once again, towards the more congested parts of this great continent. This day’s drive took us across eastern Nebraska and into Iowa. We had reached the part of our journey where we had no choice but to travel on the Interstate to get us home and avoid the congestion in populated areas. The fire roads and small rural highways quickly became a distant memory as we coaxed Clifford to speeds of 70-75mph for extended periods. Thankfully we could split the driving duties, for once the monotony of the bigger roads sets in, travel isn’t quite as fun in Clifford. 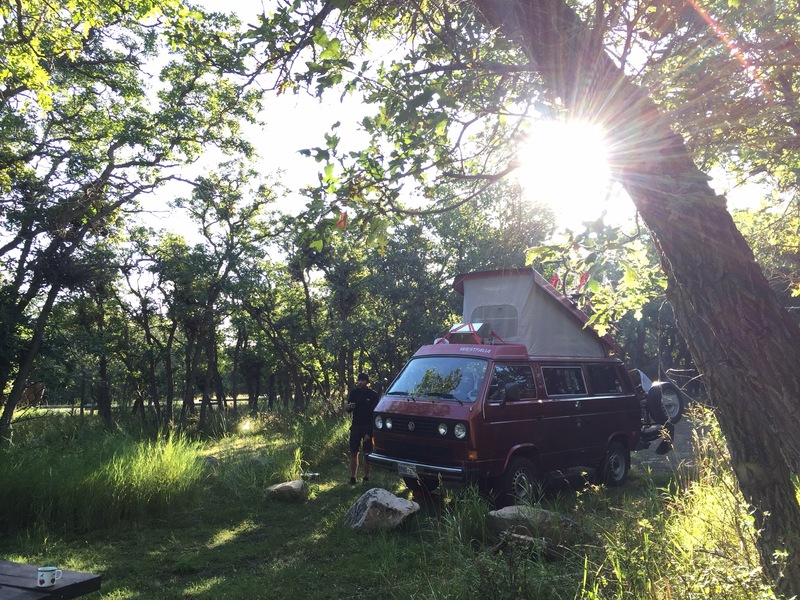 We drove another long day, and decided to simplify our stay for the night by staying at the Des Moines KOA, the very same campground we had stayed on the second night of our outbound journey six weeks earlier. We did a quick/light setup, went for a little hike with Bruno and settled in for a decent night of sleep. We left the Des Moines KOA at 8:30AM in the morning with a plan to drive to a campground in Michigan for our last night of the trip. As we approached the Greater Chicago area, we entered a large system of precipitation which, as our luck would have it, was moving east just as we were. All weather predictions pointed towards a wet evening after ten hours of driving. Simultaneously, we were somewhat suddenly anxious to get home, the congestion and the noise of the interstates was not something we had encountered for a very long time. I was quietly doing the math in my head – what if we did non-Clifford thing and pushed all the way home on this day? I figured we could be home by 2AM, assuming no hiccups en route. Driving into the evening and the night would also give us relief from the suddenly more humid heat as well as the benefit of reduced traffic volumes. I built up my courage and suggested the idea to Robin, and it was almost like she had been thinking the same thing. Driving 1400km in one go is far from a strange thing to us, but normally those types of days are completed with equipment somewhat different from Clifford. We decided to press on, making adjustments to our plan to include nice, but abbreviated, rest stops for a few minutes of leg stretching, frisbeeing and switching drivers. Sadly, in hindsight, we didn’t really take any pictures after we left the Des Moines campground. But, we did make it home, arriving at 2:30AM totally exhausted, but excited to be home. The trip had been absolutely epic, Clifford had performed nearly flawlessly through the punishing mountain passes and at times technical fire roads. Bruno had enjoyed almost every moment of the trip (just don’t mention the last day of driving…) and we had nothing but brains overflowing with positive memories from the journey. The next day, well, it was back to work for me. I did manage to put together this snazzy summary of Clifford’s fuel consumption for the trip. Now, onto planning for future adventures! 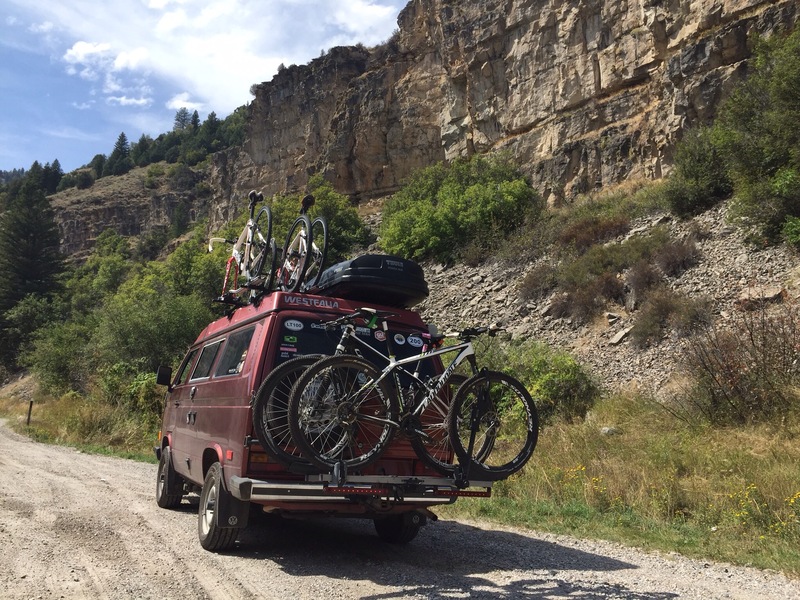 This race, no, ride report is a little late in coming, but hey, we’ve been busy driving Clifford across the continent! 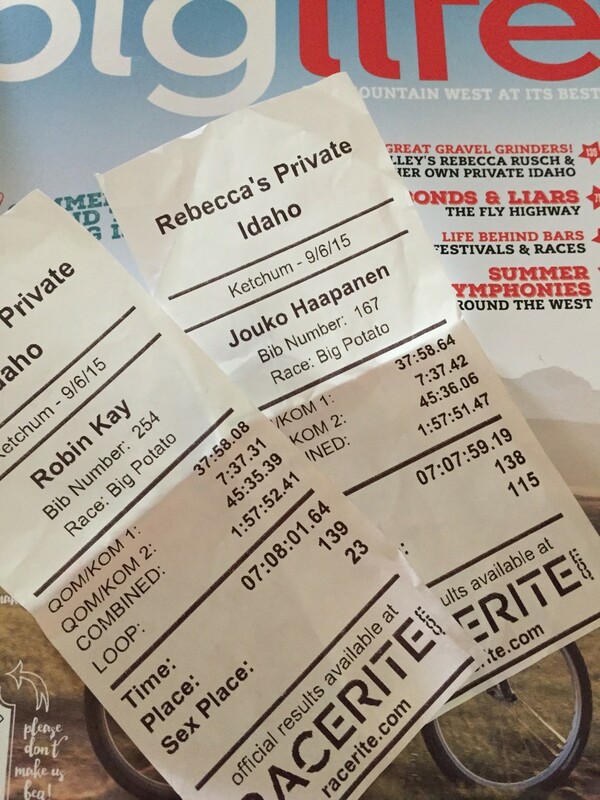 Rebecca’s Private Idaho ride (see, this isn’t officially a race, but the reasons for that would require another blog post and possibly a legal team to write the text) had a start time of 8am. We felt pretty relaxed about the event and had decided to ride this one together. Our morning preparation reflected the non-raciness of our plans. Alarm went off at six o’clock, and we proceeded to get ready. Breakfast was a relaxed, albeit quick, event and after there didn’t seem to be any of the usual pre-race jitters Robin and I would usually feel to varying degrees depending on the event and our perceived preparedness. Bruno got picked up at seven for his day of play and being such a happy-go-lucky guy, he seemed happy to head off to another adventure. He may have wondered why Robin and I weren’t joining him for hhis play date, but nevertheless, his tail was wagging as he headed out. The weather forecast for the day was reasonably good, but on the cool side. According to the weather app on the phone, it was -1C in the morning and the day would bring highs of +15C and sunshine. The cold temperature at the start meant the need to wear some extra layers. We decided on wearing our jackets on top of what we felt would be appropriate for the most of the day. This equated to a combination of bib shorts, short sleeve upper base layer, short sleeve jersey, arm warmers and a vest. Robin chose to add knee warmers to her list, I had no such decision to make for I had not brought any knee warmers or leg warmers on this journey. It is summer, after all. We also decided to wear warmer gloves to start and put our summer weight gloves in our jersey pockets. Speaking of jersey pockets, they seemed fairly empty. There were six aid stations on the course and as we had decided to enjoy the day and the event without focusing on a finishing time, we didn’t carry a third bottle in our jerseys, nor did we have any magic nutrition plan for the day. We carried two bottles of Roctane on our bikes to start, with a couple of Roctane gel packs each in our pockets. 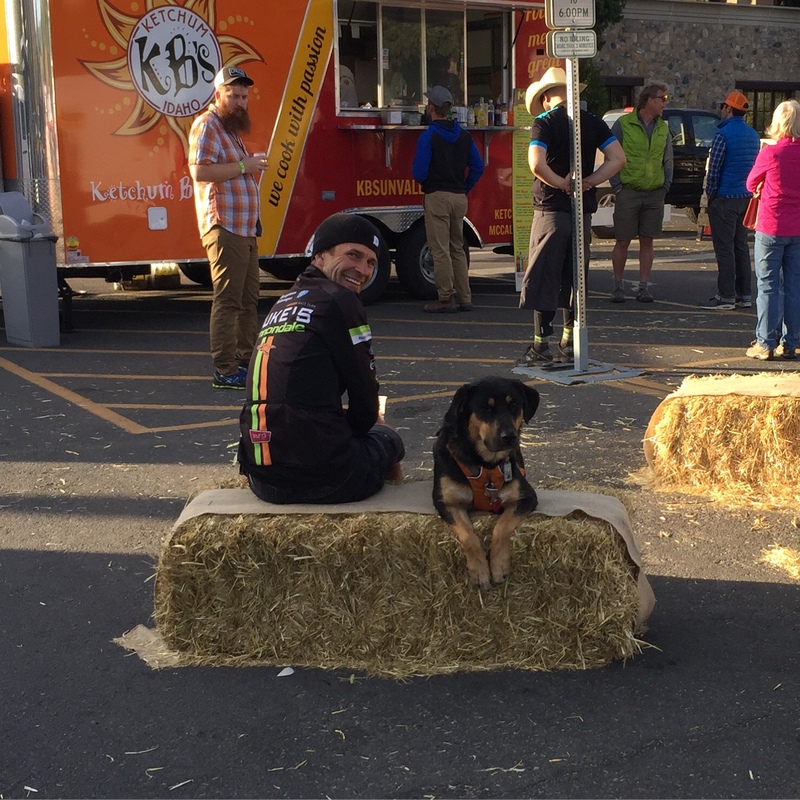 Our friends from Gu Energy were providing ample nutrition for the aid stations and, not to miss, there were delicious roasted sea salt & rosemary potatoes at the aid stations. 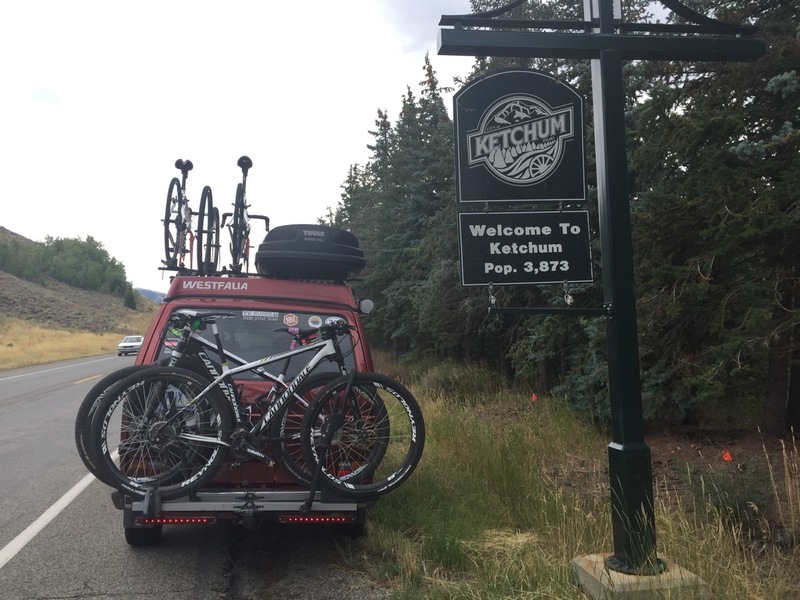 We loaded the bikes on Clfford and drove to downtown Ketchum , departing the house at 7:15. Although the distance to. The start was only about 4km, we had decided to drive downtown for the start. This gave us an opportunity to stay warm as long as possible in the morning, and also allowed us to not have to do the 4km gentle climb back to the house after finishing. Once downtown, we proceeded to sign in and receive our timing transponders. At that time, we noticed that we had mixed up the number plates on our bikes. Yes, that was the level of our preparedness. We switched the plates, got our transponders and headed inside Starbucks to stay warm. With close to 500 participants and a non-structured mass start, starting positions inside the corral matter, but many of the participants, including ourselves, were content to allow the corral to get filled at the front, and the middle, in order to stay indoors until it was close to start time. With about five minutes left before the start, Robin and I lined up and accepted our fate of riding in the cold. At least the sun was rising from behind the mountains. Once started, our slight chilliness quickly turned to a deep freeze. Riding at ~30km/h at sub-freezing temperatures is cold. The first ten or so kilometres out of downtown was a gentle climb on a paved surface. With the rising sun providing mostly/only light at this point, we didn’t start getting warm until the steeper, gravel climb started around 12km and continued until about 20km to the top of Trail Creek Summit. The photo below (thanks for the photos, Linda Guerrette!) clearly shows us smiling. By the top of this climb, we had both warmed up, maybe with the exception of our feet, to a point of some comfort. The top of this climb brought on the first aid station where we stopped for a luxurious and relaxing seven (!!!) minutes. This included some time huddling around a fire, some feeding, some socializing and a quick trip to the bathroom. From here we continued on a gentle gravel descent for the next 15-16km. 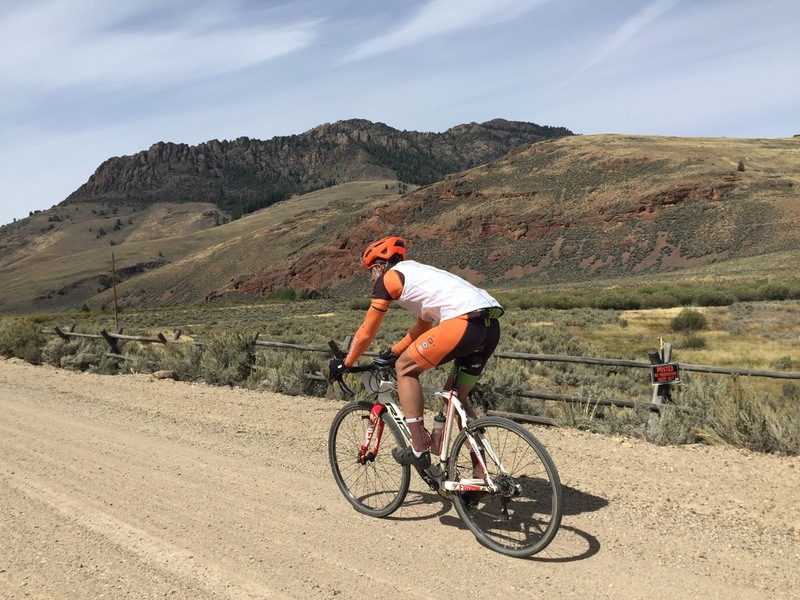 The heat we had built up in our bodies quickly faded as the speeds hovered around 35-50km/h down the beautiful rolling gravel road descending from the summit. The descent took about 20-25 minutes at our brisk, but not-quite-race-pace effort. Thankfully it also brought us into direct sunshine and some hope for warmth. We stopped at our second aid station around the 3h point, now about 57km into the event. At this point, we decided to leave our jackets at the aid station as the temperatures were starting to warm up, ever so slightly. The aid station stop itself? Yep – again, relaxed, fun, food, bathroom break and about eight minutes. Did I mention we weren’t in any hurry? The Copper Basin loop took us over 1h40min to complete. At this point, the effort had become race-like, and the focus was on finishing as soon as possible, for why delay the relaxation that awaited? Our desire to finish was reflected on the length of our next aid station stop. It took only six minutes. Ok, maybe our desire to get the finish quickly was not quite race -like. From here, the course followed the same route that had brough us to Copper basin from the start. Rolling gravel, mostly gently climbing, for about 15km, followed by a 15km gentle climb with a final pitch up at the end to take us back to Trail Creek Summit. As an added bonus, the headwind was stiff and for some reason, the participants seemed to have little interest in working together to minimize the wind impact. 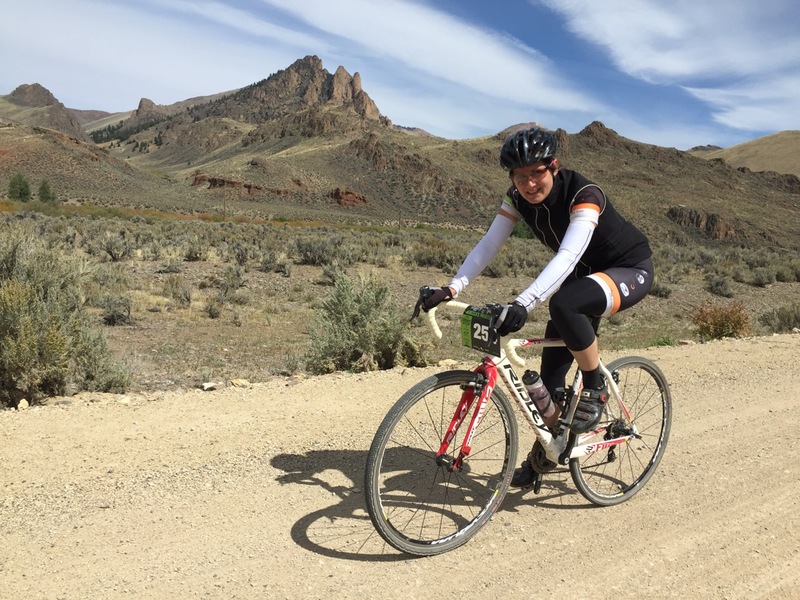 As a result, Robin and I worked together, as a group of two, and pedalled our way back to the summit. The aid station at Trail Creek Summit (this was aid station 1 on our way out in the morning) was the last aid station on course. We did something unusual here – we did not stop. We had worked hard on the long climb back to the summit, in fact, I had pushed as hard as my vacation-conditioned body would allow me to push, to make some decent headway during our return toward the summit. with less than 20km to the finish, all downhill, we assessed our bottles and rode right past the aid station. The descent from Trail Creek Summit was a little tricky at times. It provides the exciting combination of exposure/steep drop offs, lots of loose gravel in various sizes and shapes and more turns than one remembered from climbing it up in the morning. We made decent time own the hill, passing a handful of other riders. Descending on a cyclocross bike is more exciting than if one were to descend on a mountain bike. You, the rider, have to take a more active role in guiding the bike down the hill, for at times the bike seems to want to go down the wrong line. You dont want the wrong line. You really don’t. 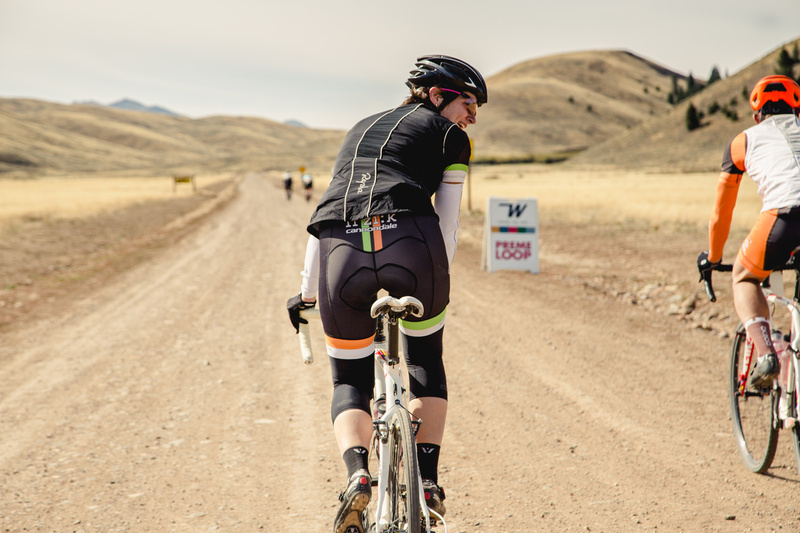 As we approached the end of the gravel descent, we suffered the only setback of our day – Robin suffered a a flat rear tire. Thankfully, she managed to bring herself and her bike to a stop without any additional drama. Quickly, in almost race-like fashion, we had a fresh tube in and filled and we were back to descending the last bits of the gravel. From there, another ten or so km of paved descending and we were going to be all done! We pushed hard through the final descent, at this point the desire to get off the bike ASAP overcame any desire to soft pedal, or even coast down that final descent. Robin and I finished the event in 7h8min, with approximately 6h30min of that spent riding, the rest at our five aid station stops or the one flat repair. Considering our desire to not be “racing” and our lack of training, we were more than happy with the result. Yes, we had started off the day at a casual, fun pace but somehow, as the day went further, our effort levels had become higher and higher. At the end, I felt like I had just raced a hundred miles. Old habits die hard. Most of all, it was exciting to put an end to any scheduled and/or planned “racing” type activities. It was time for our annual “we’re done with racing, for good” moment. Maybe, just maybe, this year it will stick. 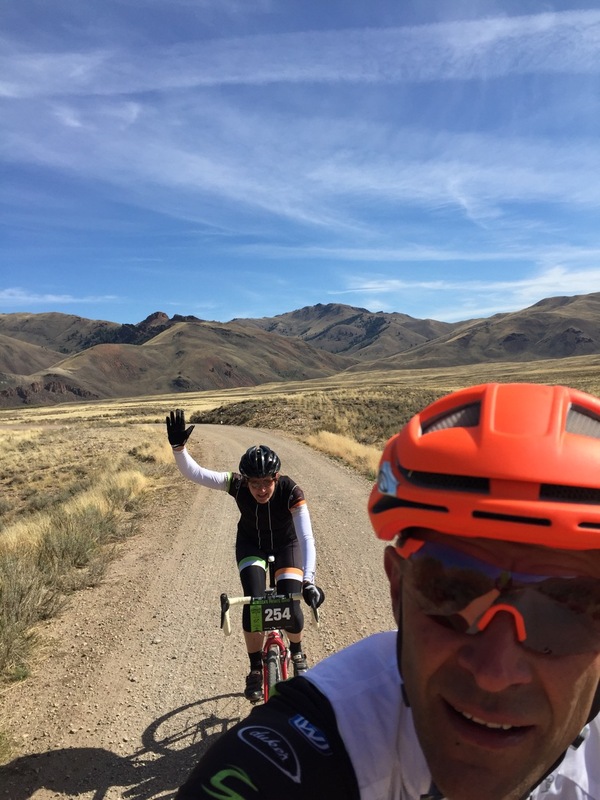 For the data junkies – here’s the link to my ride: Rebecca’s Private Idaho 2015 – epic scenery and wind! At the finish, we walked our bikes back to Clifford, got them on the rack and drove back to the house to enjoy some well earned beer, peanuts and showers. Not to mention, Bruno was going to be returning from his playdate and we were eager to have him join us! 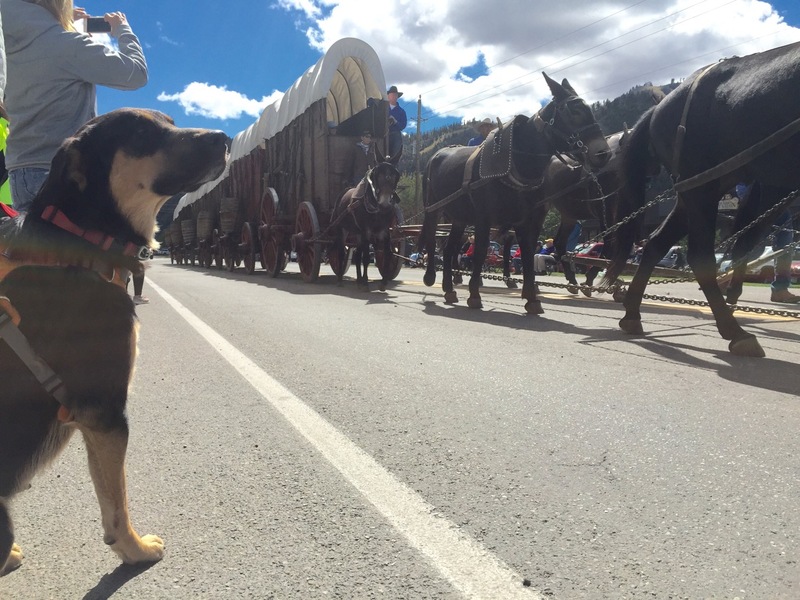 After Bruno’s return and our clean-up, we returned to downtown Ketchum to enjoy some of the post-event festivities. Although there was no shortage of festivities, our fatigue levels were high enough that it didn’t take long or much food and beer for us to realize that we need to be relaxing on a sofa. Thus, we returned back to our house and did just that. The evening relaxation was high in quality but low in quantity, for fatigue and the anticipation of the long drive home for us to bed early. A 3500km drive home awaited us. Next time – home, Clifford, home! 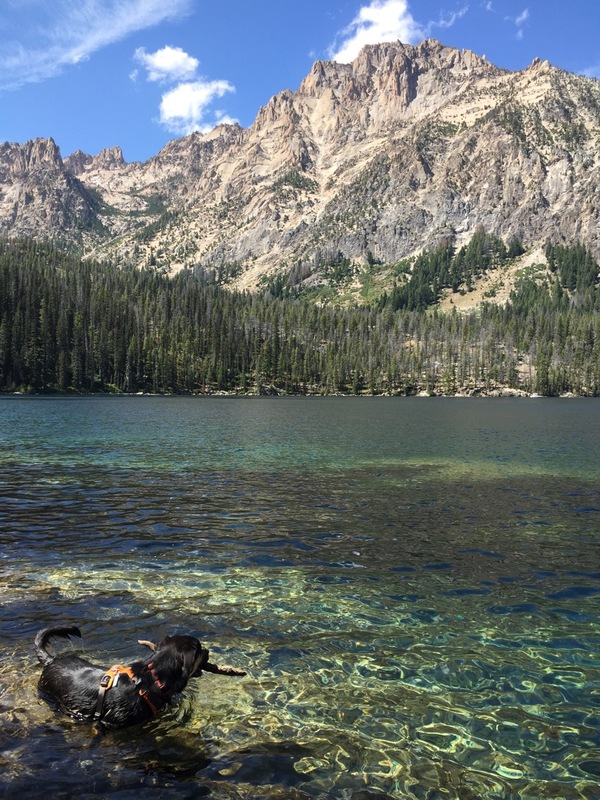 We had planned to arrive in the Ketchum area early, in order for us to do some camping in the Sawtooth Mountains, north of Ketchum. On our way through Ketchum we stopped at an outdoor store to buy a trail map and a warmer jacket for me. The weather for the week was forecast unseasonably cold with lows below freezing and highs around 15-20C. Southern Idaho hadn’t exact been visually memorable, but the area around Ketchum/Sun Valley was beautiful. Since we were coming back for the weekend and our “race”, Rebecca’s Private Idaho, we headed north to the mountains. The drive north of Ketchum was beautiful. The road climbed up to the Galena Summit and descended back down through the mountains and I wanted to keep stopping for more pictures. We had decided to stay at a National Forest campsite in order to have the convenience of vault toilets and garbage bins for our planned four night stay. 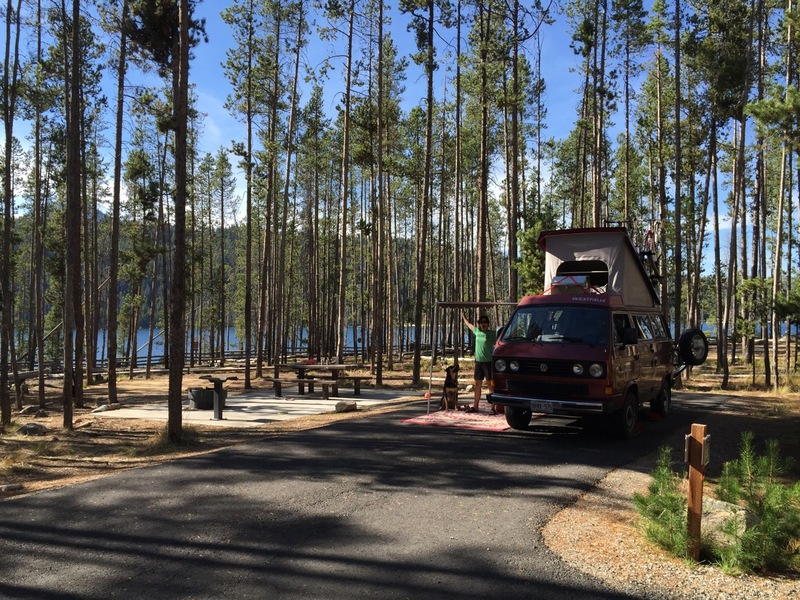 We found a quiet, beautiful campsite at the far end on Redfish Lake and set up camp. 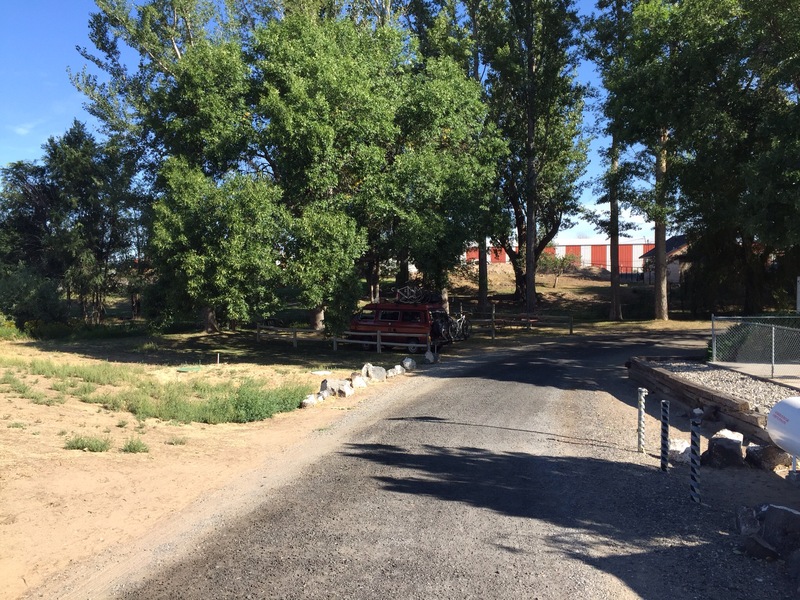 The campsite was adjacent to the lake and swimming was only a short walk away. 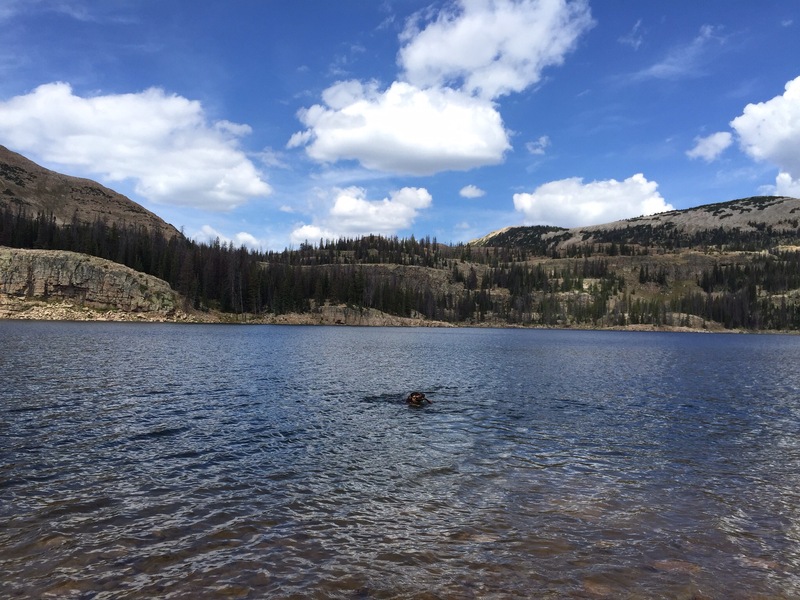 Bruno was super excited to have a chance for lots of swimming in cool mountain lake water. On our second day, we hiked around the lake. Robin, being in charge of planning these types of activities, led the way and Bruno and I followed. The trailhead was within a minute or two walk from our campsite and from there we started a long and winding climb up to a mountain ridge. Approximately halfway through the hike, the trail descended off the ridge to the lake, only to climb again to a ridge on the other side of the lake. And to descend again. Yeah, awesome hike, but long! Like something in the range of 22-24km of varying terrain, climbing and descending. The exact distance is unknown as my Garmin battery ran out at the 20km mark. The next couple of days were spent relaxing, throwing frisbees, playing in the water and fiddling with the bikes in preparation of the upcoming race. Robin, being the keener of the two of us, did go and ride her mountain bike for two hours one day. I chose to rest my legs. Or to just eat more cookies. The weather was mostly fantastic – sunny days with comfortable temperatures and cool crisp nights. 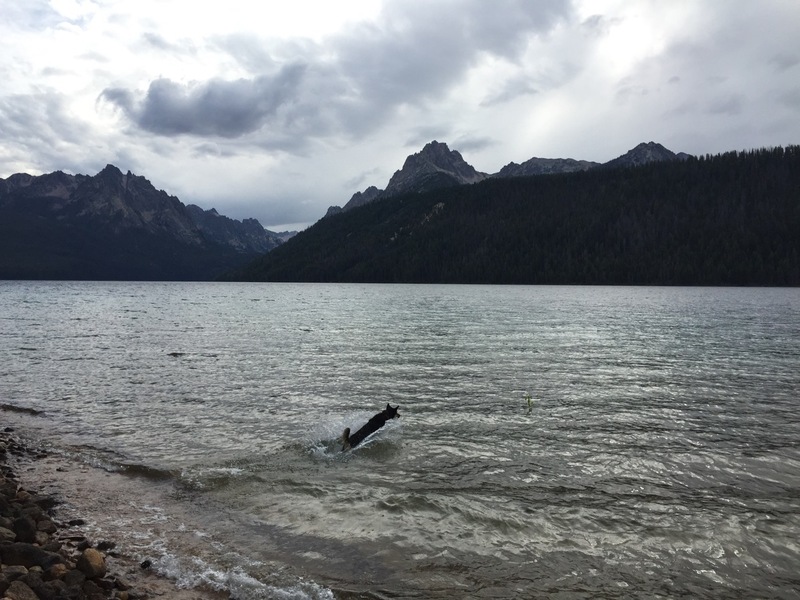 Our last day of four was a little cloudy and at times rainy, but it did not dampen our love for Redfish lake. On Friday morning, we packed up Clifford and headed to our house rental for the next three nights. It was a somewhat typical ski area condo, with ample space and, most importantly, a king size bed and running hot water. We also drove down to Bellevue to meet with Bruno’s daycare people for race day Sunday. Sara and Ned, who we found through DogVacay were super (as was their little pug, Roscoe) and we knew our little guy was going to be in good hands. Saturday was a busy day. We had a nice civilized breakfast, prepped a few things for the race and Robin started unraveling the laundry. Afterwards we headed out to watch the Wagon Days Parade. This is the largest non-motorized in the U.S. The only non-walking participants were Rebecca Rusch and one of her charities, World Bicycle Relief, who help people in Africa achieve mobility through bicycles . The parade was fun, but after a couple of hours in the cold, sunny weather and a couple of good margaritas (did I mention Patron Tequila is a Rebecca’s Private Idaho sponsor?) we headed home for a little rest. Late Saturday afternoon, we headed downtown one more time to pick up our race packets and to wander the expo area for a bit. It also gave Bruno a chance to play a bit more outdoors and meet some celebrities like Rebecca’s dog Diesel, 205 DK200 champion Yuri Hauswald and photographer Linda Guerrette and her dog Levi. After this event, we went home and had a big meal, watched a bit of television and relaxed with a bottle of wine until it was time to get to sleep. No pre-race jitters this time, we were going to ride together and enjoy the day as a “ride” with no pressure of results. Next time – race day? Is this a race? 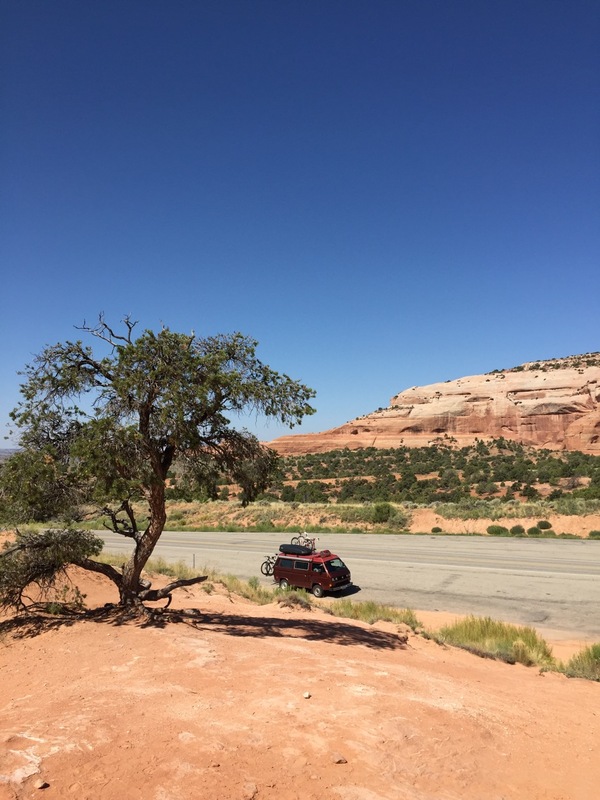 After driving through the harsh desert of southern Utah and a somewhat disappointing stay outside of Monticello, we were intent on finding a nice place to stay and hike for a few days. 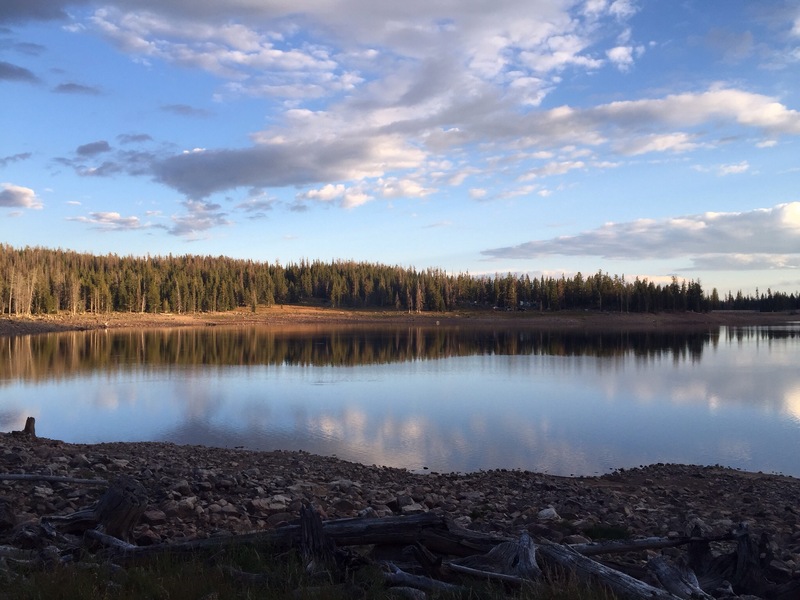 With limited connectivity (and pricy data plans even when coverage is available), Robin did much research and we headed to the Uinta Mountains and the Uinta Wasatch Cache National Forest, located about 100km east of Salt Lake City. We once again avoided the interstates as much as possible, taking secondary highways or even small gravel roads to get to our destination. The day’s drive was scenic and included everything from arid desert to thick coniferous forests and mountain lakes. 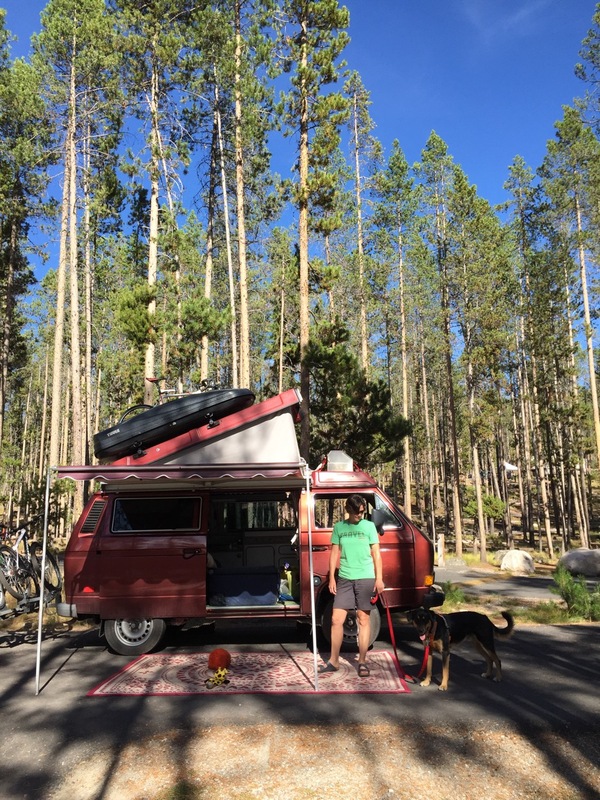 We arrived at Trial Lake campground, elevation ~10,000 feet and were welcomed by fresh mountain air and beautiful forests, making the desert drives of the past couple of days a distant memory. 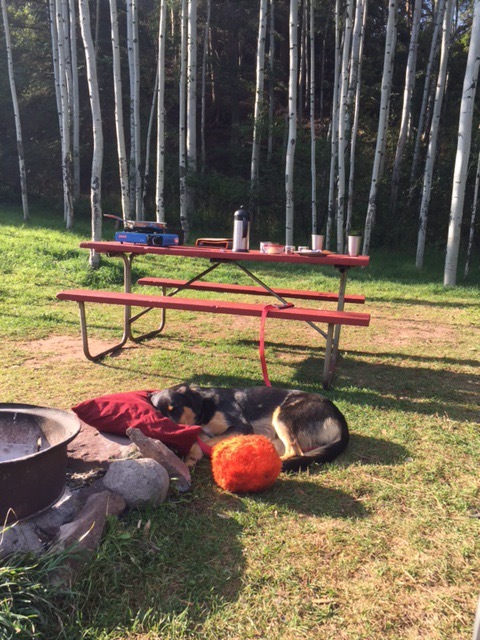 Our campsite was large and allowed Bruno ample space for playing. Although the campground was almost full, there was no noise and one could enjoy the silence of the mountains and relax. I did say “almost” full…for later in the evening, a group of people arrived at an adjacent campsite. They were a little bit louder than most campers and one couldn’t help but listen in on on their conversations. The son, in particular, was rather loud and reminded me of a male version of Honey Boo Boo (yes, I’ve seen an episode or two). Thankfully, as the entertainment value of their show grew more fatiguing,t hey also fatigued and retired to their tents for the night. 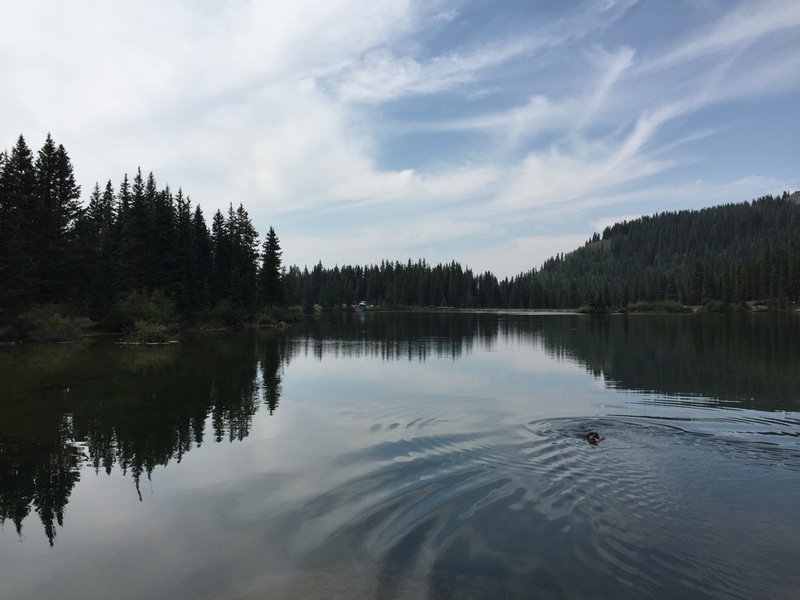 We had chosen this location for its lakes and mountains, and took advantage of this by doing a nice day hike from our lake to another lake and around it. 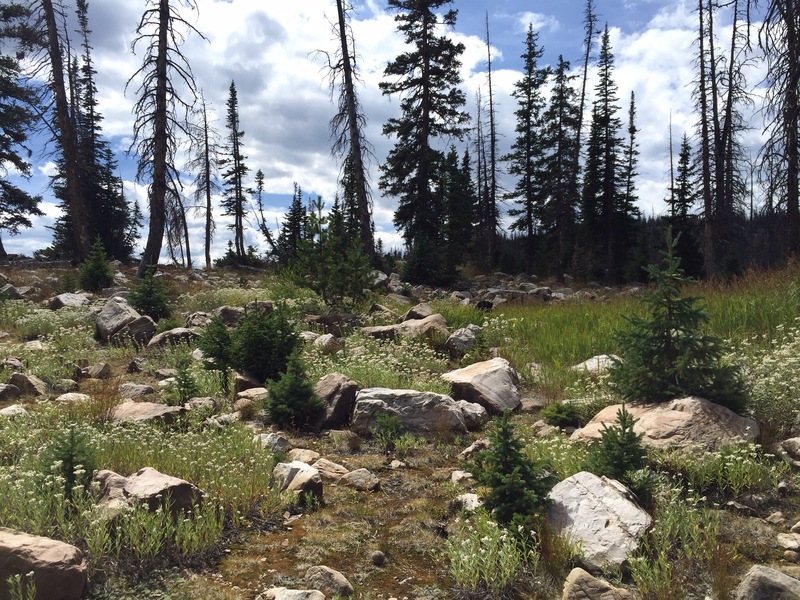 The terrain was varied, from forest trail to rocky shores of the mountain lakes. As always Bruno had a great time. 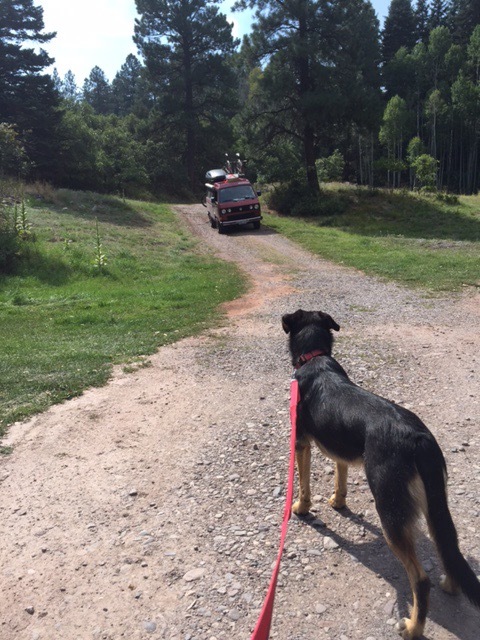 He met a couple of new friends along the route, including Odin, a Lab Husky mix (whom Bruno met again later in the evening at the campground and played with until dark) and a 12 week old Kaya, a mystery mix who looked like almost like baby Bruno! Our hike had its downside – at some point, Bruno’s leash had fallen out of my backpack and as we approached our return to the campground we doing bad ourselves unable to leash up Bruno. He was ok with it, but we lamented having to buy yet another leash. 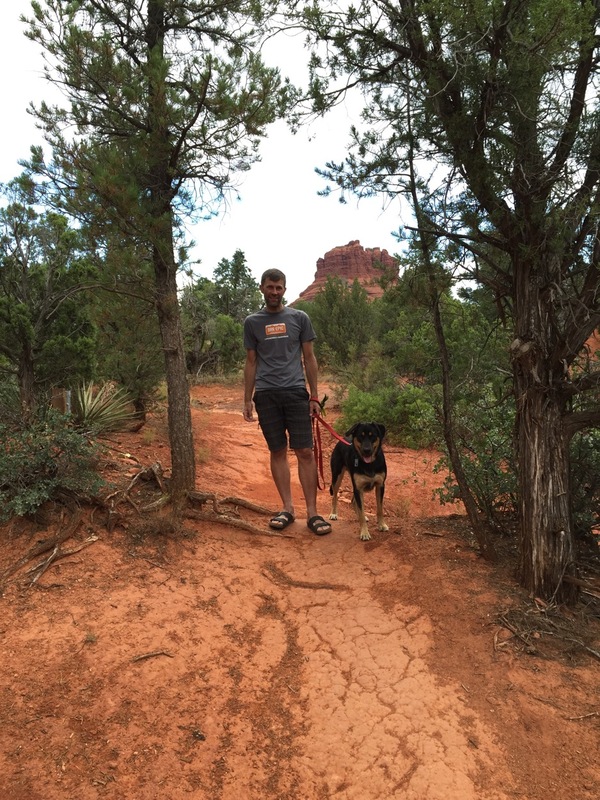 We had previously lost a leash in April on a hike in North Carolina – this habit is getting pricey! After a couple of enjoyable and relaxing days and nights, we planned out next move on our journey toward Ketchum, Idaho. The drive to the Ketchum area was going to take more than one Clifford day, so we made plans for a quick stay somewhere in southern Idaho. 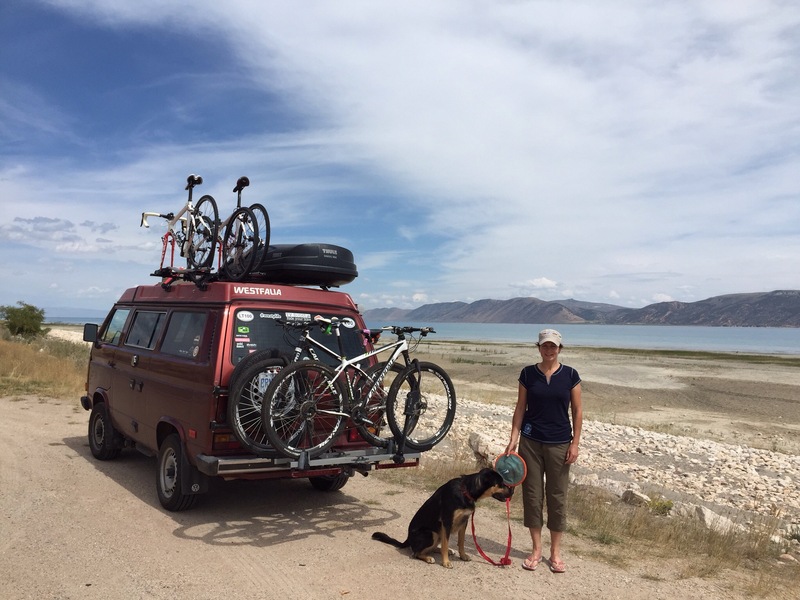 We left our mountain campsite and descended from the Uinta mountains to Wyoming and then back to Utah for a bit to reach Idaho (taking the roads less travelled is rarely the straightest route). 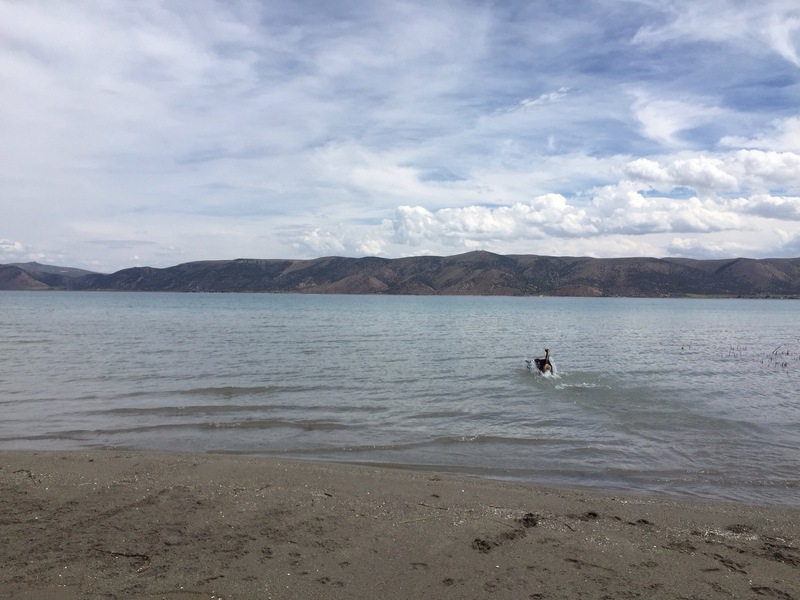 Just before leaving Utah, we stopped at Bear Lake on the Utah-Idaho border for a quick Bruno swim. 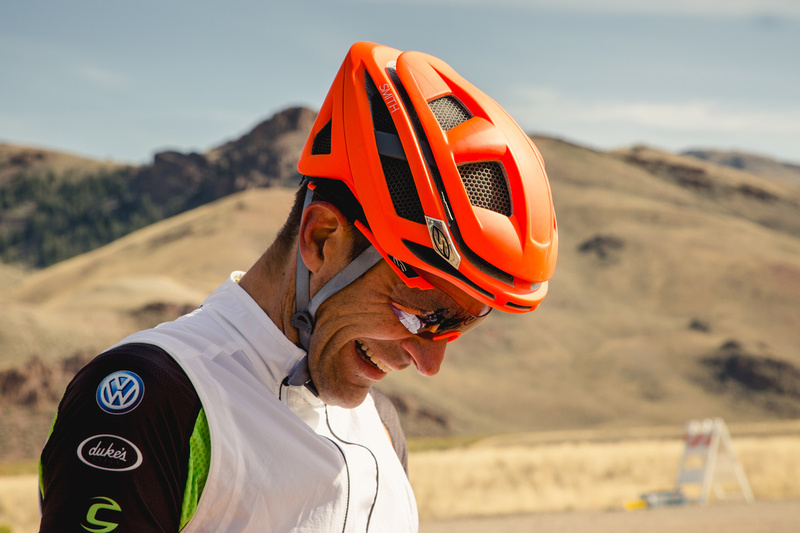 Our initial hours in Idaho offered us more high feet vistas and wicked headwinds for Clifford. We finished our first day in Idaho in Jerome and found refuge at a KOA. Once again, a KOA offered two redeeming features; hot showers and WiFi. Beyond this, it also offers dust, noise from adjacent truck traffic, the smallest dog play area ever and many many rules. Oh well, we enjoyed the showers and the WiFi. 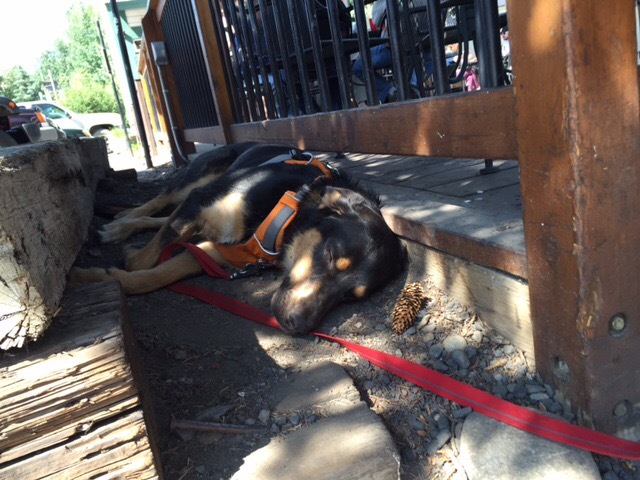 We left the Jerome KOA early (early to us) the next morning and headed north toward Ketchum. We could see the mountains looming ahead, but the smokey haze from western forest fires limited our long distance visibility. According to those who know,we would find something other than high desert and lava rock fields. Next time – Giddy up! 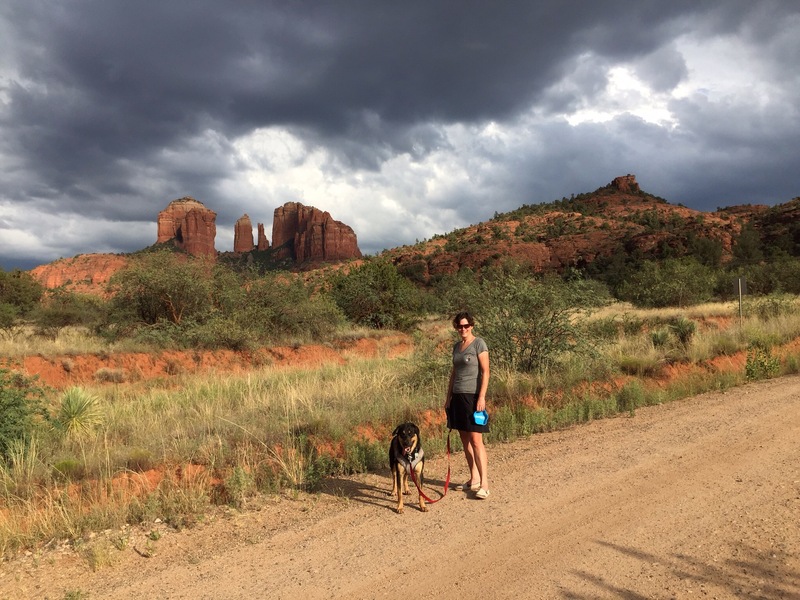 Once Robin and I decided to stop in Sedona for a short stay, we had immediately agreed on three nights stay at the Red Agave. 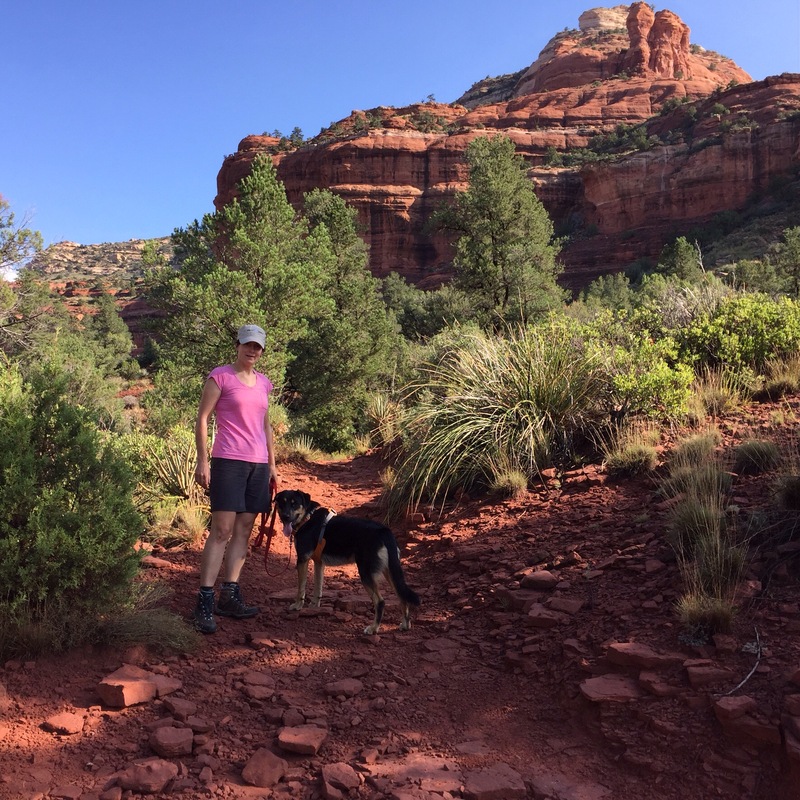 The price was super affordable (August is low season in Sedona) and the two full days bookended by half days would give us ample opportunity to ride some of the red rock trails, do some early morning (pre-desert heat) hikes with Bruno and, most of all, get all of our laundry done. We were also excited about what suddenly seemed like a luxury item: air conditioning! We accomplished all of our planned tasks. 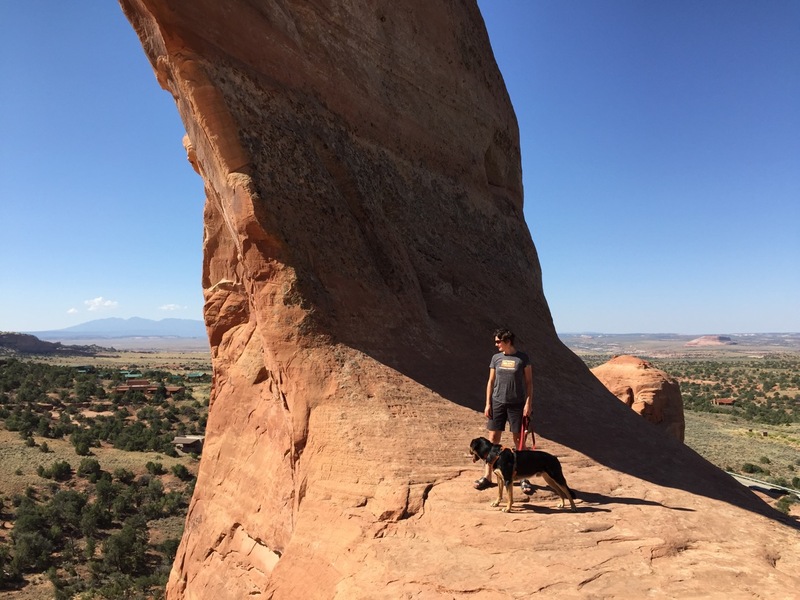 We did a few rides, some hikes with Bruno, including an awesome morning hike of Boynton Canyon. The weather was cooler than our day of arrival, with highs (only) around 30C. For those of us accustomed to Souther Ontario humidity can seem muggy and uncomfortable, but trust me, the whole “but it’s a dry heat” thing is for real. Just remember, the radiation from the sun will melt you, so seek shade! 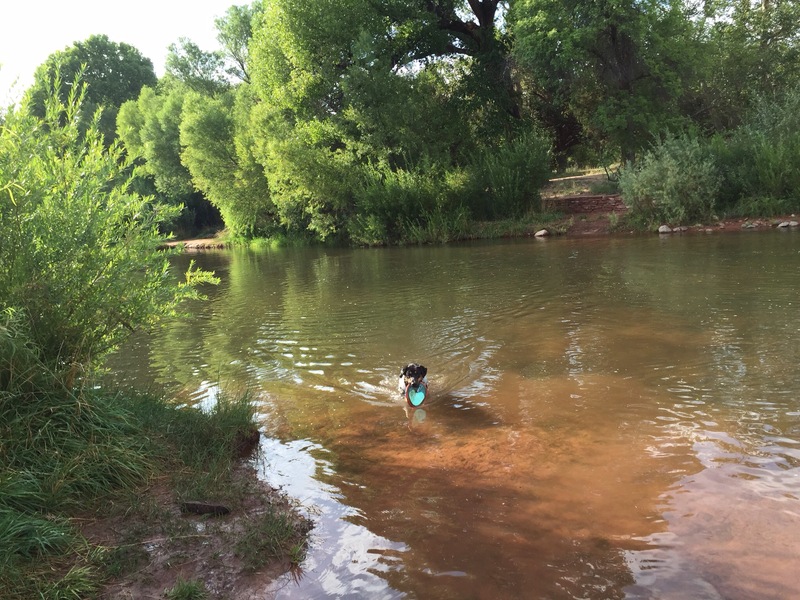 Since the Red Agave is located in the Village of Oak Creek, we drove down to the water one late afternoon for Bruno to do some fetching in the water. 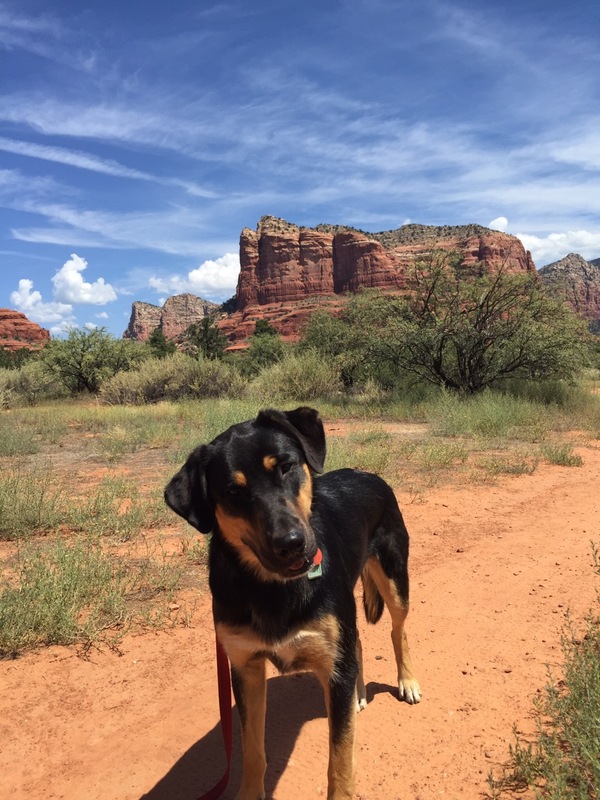 He had become quite good and careful on our trail hikes in the desert, avoiding the various prickly vegetation, but we had completely avoided any fetching and free roaming in fear of a USD 500 vet visit to remove cactus thorns from his muzzle. Robin and I both enjoyed the luxury of a couple of days in air conditioning, a second tap from which comes warm (yes, who knew!!) water, and a television. Yet, we both felt somehow not completely relaxed I’m the evenings the way we do when we settle in for a quiet evening in Clifford, Robin reading her book, me staring at maps and Bruno napping away beside Robin on the bed. 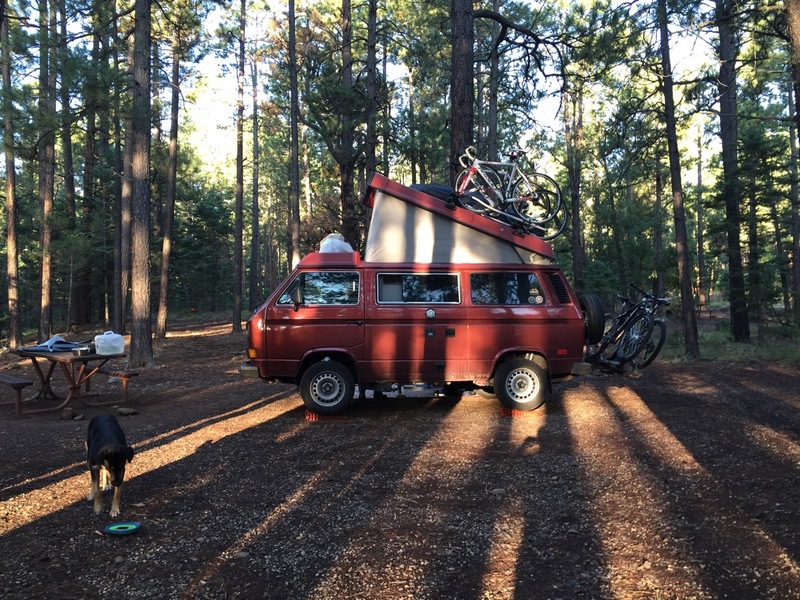 On the morning of our departure from Sedona, it was clear that the three of us had, in some strange way, missed our life in Clifford while he was parked at the hotel parking lot. 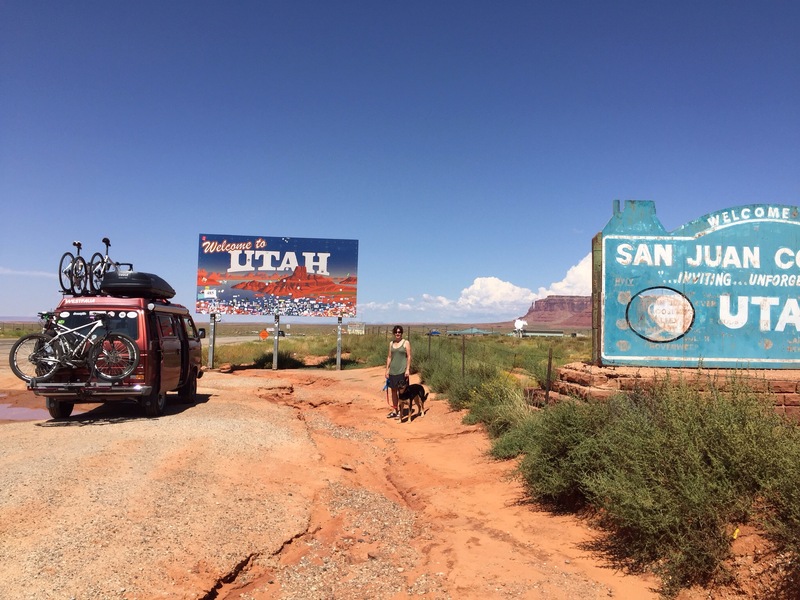 Bruno immediately claimed his spot on the rear seat as we drove away from Sedona, back toward Flagstaff and once again across the desolate and harsh landscape that is northern Arizona and now onto Utah. 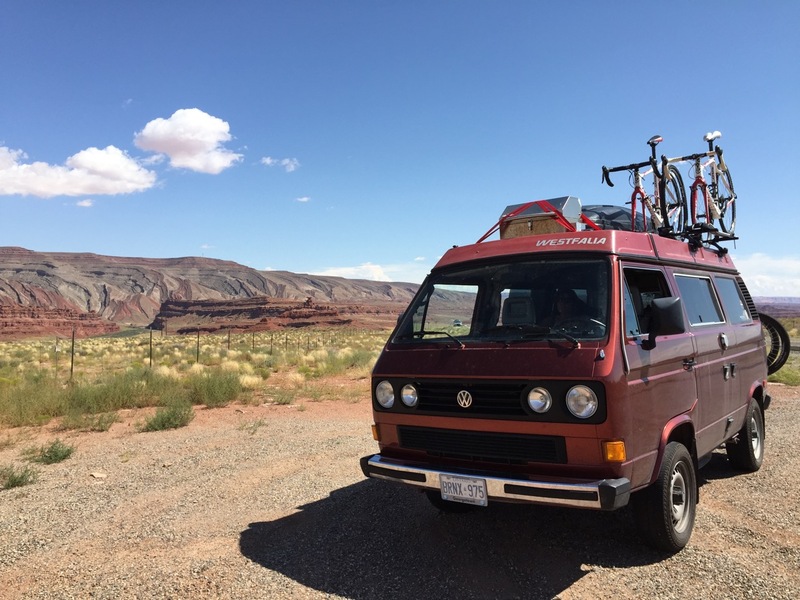 We had planned our route to take us north from Flagstaff, through Monument Valley to some place with sufficient elevation to allow us to sleep in reasonable temperatures. Monument Valley was everything I had hoped, my expectation having been set high by John Ford directed westerns. The drive across southern Utah was more than just Monument Valley, for it seemed that after each climb (usually ending in second gear, Clifford being Clifford), the following descent offered yet another variation on desert landscapes. I would highly recommend everyone visit this area once. The second time, probably not necessary. Robin had found a National Forest area just outside the town of Monticello for us to seek refuge for the night. Monticello was already at enough elevation that the temperatures seemed almost bearable, and once we climbed to our planned campsite at elevation 8,400 feet, not only were we out of the desert and there were plentiful trees and green vegetation, but the air once again seemed crisp and cool. We were suddenly confident that the we were not going to perish in the desert. Of the many USFS campsite we have visited, this one was again on the less populated side. The only campers at this campsite were us, the campsite host, and one other trailer, populated by some local type peeps who were out for a few days of bow hunting. Yeah, it is bow hunting season in Utah. We didn’t ask what they were hunting, but decided to lay low and stay close to our campground. We did attempt to look for a hiking trail close the campground, but had very little luck and the open range cattle had us a little bewildered at times. Thus, we returned to our campsite and proceeded to throw Bruno’s frisbee for a few hours in the safety of our campsite. 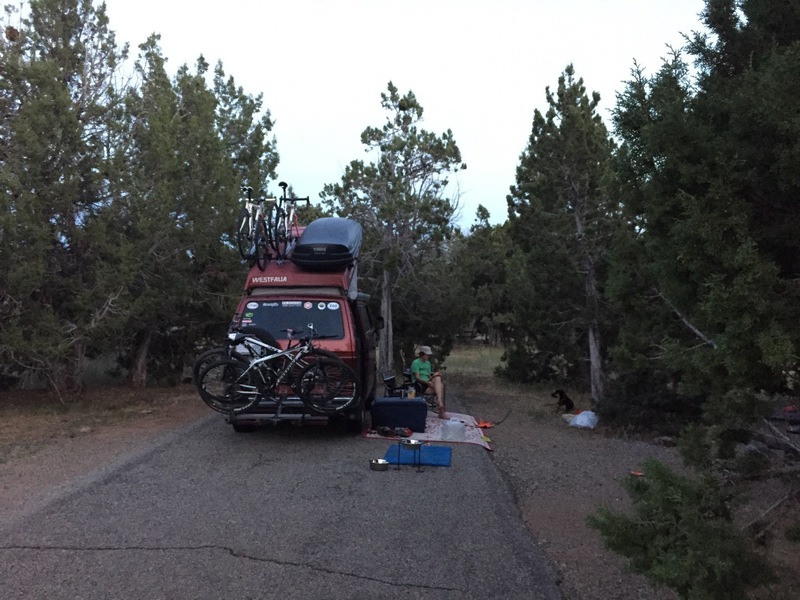 We left our campsite outside of Monticello after just one night and headed north, hoping for a more hospitable environment in some other part of Utah. 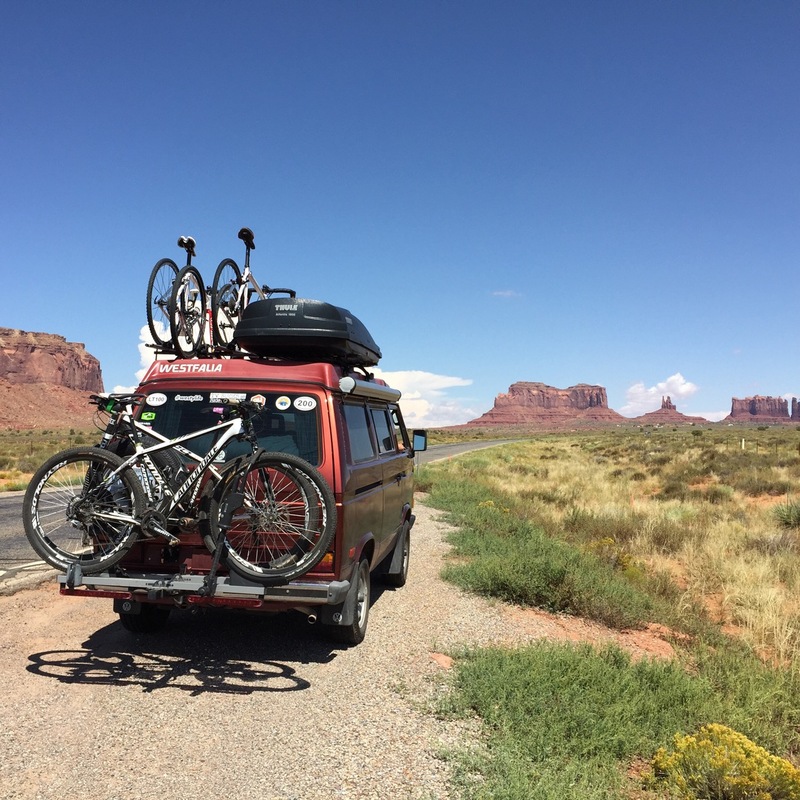 We drove through Moab without either of us desiring to stay for a day or two to ride the trails, for we had had enough of the desert for now. 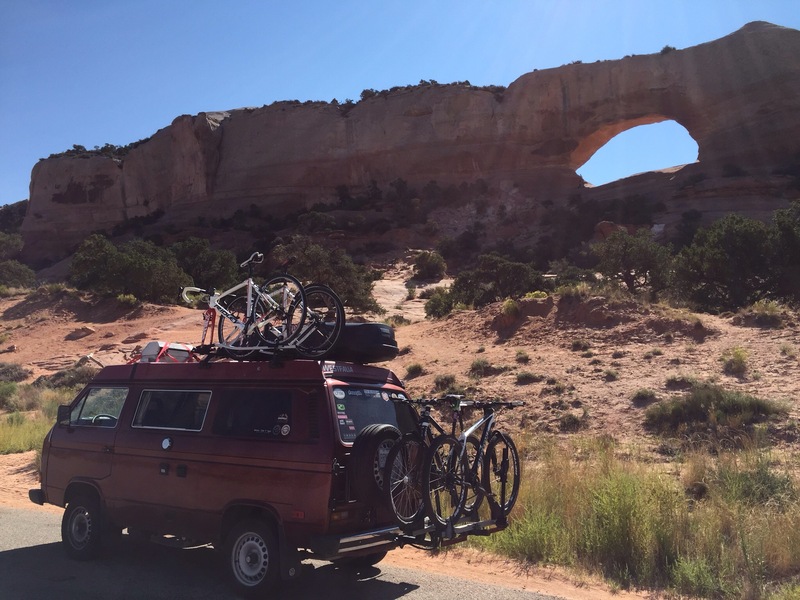 During our drive through Moab, we didn’t really see anything that would pique our interest to come back one day. It seemed like just another town in the desert with a selection mediocre-to-bad lodging and food. Maybe there is some other magic side of Moab that is far away from the main road and someone will convince us otherwise. We continued north, until hwy 191 met up with my least favourite interstate, I-90, and turned west on I-90. Thankfully for this short section, we had the pleasure of a gentle downhill. Clifford settled in at a comfortable 65mph and we watched traffic go by us at 80+mph. Soon we headed off the interstate, back on 191. Eventually the road became smaller and very quiet, as it climbed through some steep switchbacks (yeah, sub 20mph speeds for Clifford) and the road took a us through a long mountain canyon, first up and then down. A beautiful and quiet drive. We did pull off the road at some point during the climb to give way to a school bus full of children, thinking the kids likely wanted get home and 55mph would get them there sooner than our 20-25mph. 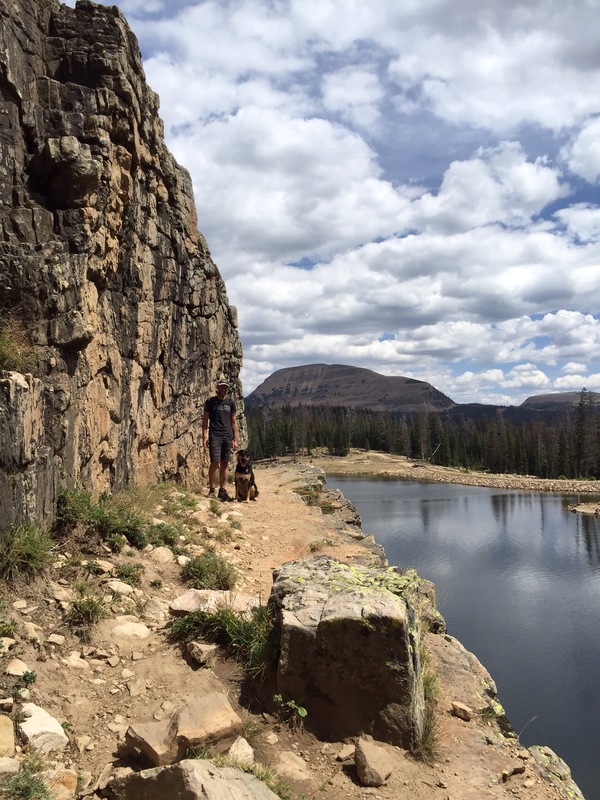 We aimed for the Uinta Mountains, with a plan to stay a couple of nights and get some decent mountain air hikes in to us and Bruno. Mirror Lake Road climbs out of Heber City into the Uinta Wasatch-Cache National Forest. 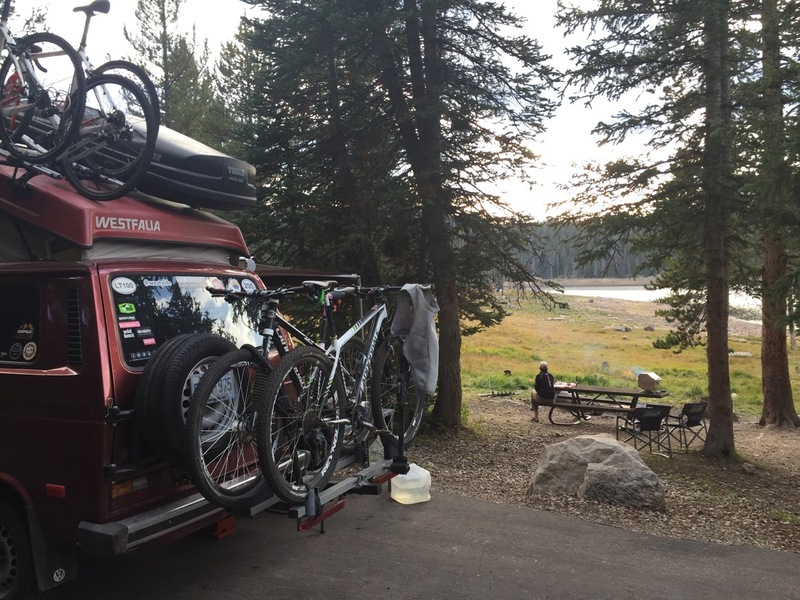 We climbed (yes, slowly) up to past 10,000feet of elevation once again and found a nice spot at the Trial Lake Campground. We were somewhat concerned about availability of space as it was a Friday and we had no reservation, but luckily found one of the few remaining spots to be good for us. We set up quickly, once again enjoying thin mountain air and settled for a relaxing couple of days. Next time: More mountain hikes and is there a male version of honey boo-boo? 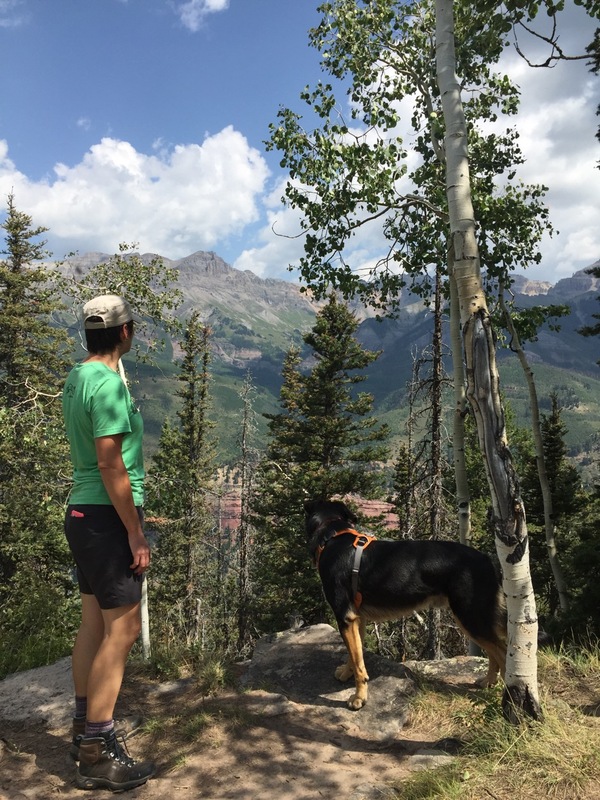 After a few days of dispersed camping at the ghost town of Alta, we packed up our campsite and pointed Clifford down the mountain, towards Telluride. The descent on the forestry road was a certainly lot easier on Clifford than the climb had been a few days earlier. 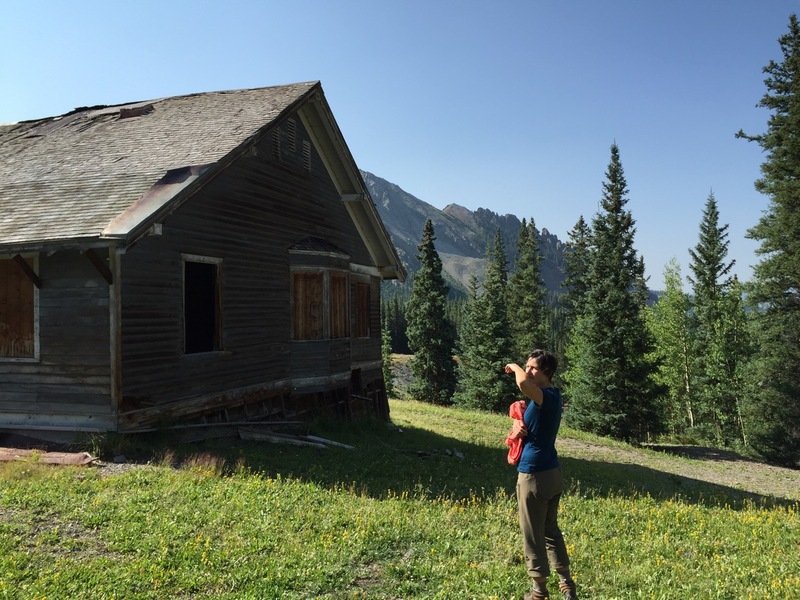 Once we had descended the four miles or so to the paved road, the town of Telluride was only about ten minutes drive away. Our plan for the day was to use the free Telluride gondolas to get us to the start of our hike and take a combination of gondolas to get us back to our starting point after our hike. This free public transportation system seemed almost too good to be true, connecting the town of Telluride with Mountain Village on the other side of the mountain. The passengers seemed to be about on even mix of hikers and mountain bikers with their bikes. In the winter, the gondola bike racks are replaced by ski and snowboard racks. 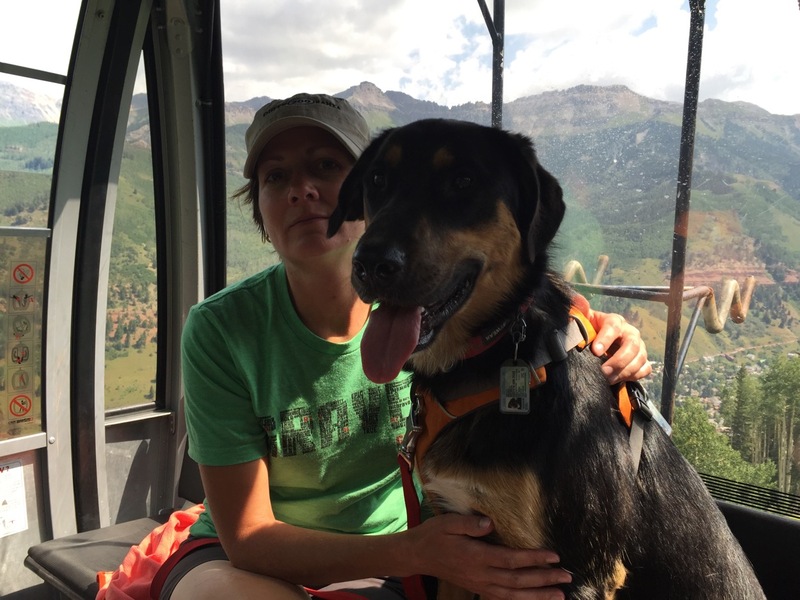 Bruno was a little bewildered by his first gondola ride, but settled down to watch the scenery change as we ascended the mountain. 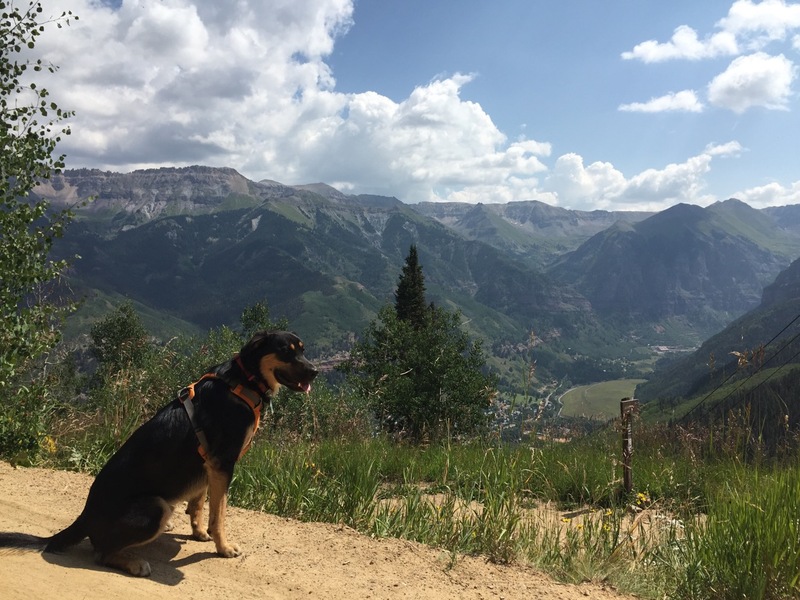 Once at the top, he enjoyed a drink from the complimentary water bowl (Telluride seemed super dog friendly!) and we were ready for our little hike. 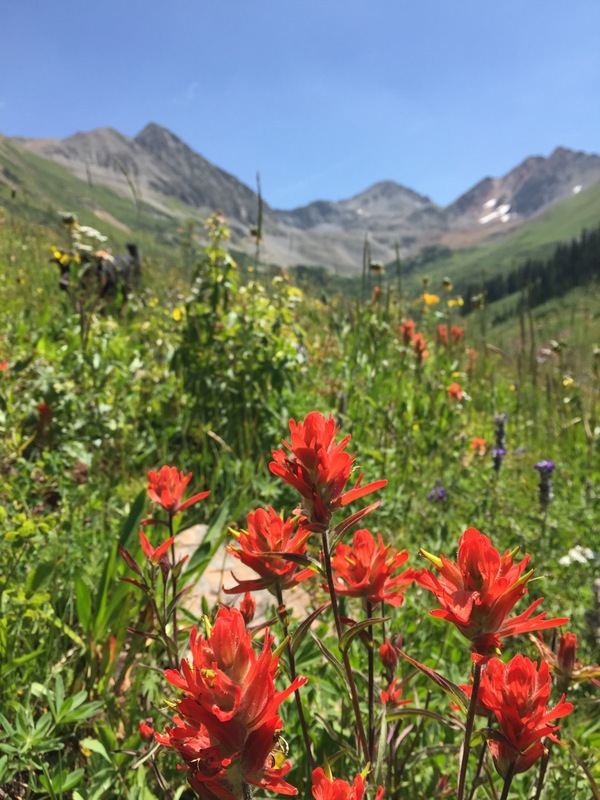 This hike was shorter and easier than our long hike in Crested Butte, but offered some beautiful vistas of the surrounding area. 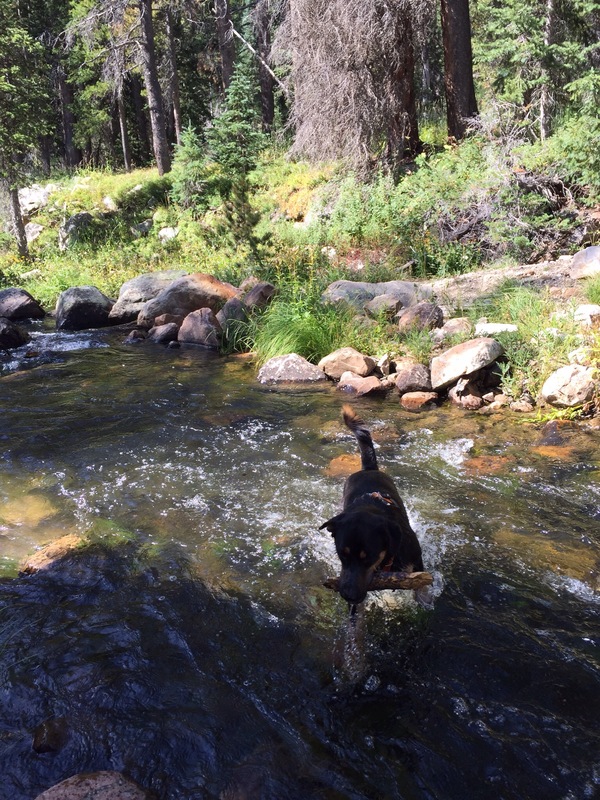 After our hike, Bruno enjoyed a little dip in the stream at the base of the mountain. He may have enjoyed the dip more than the hike! 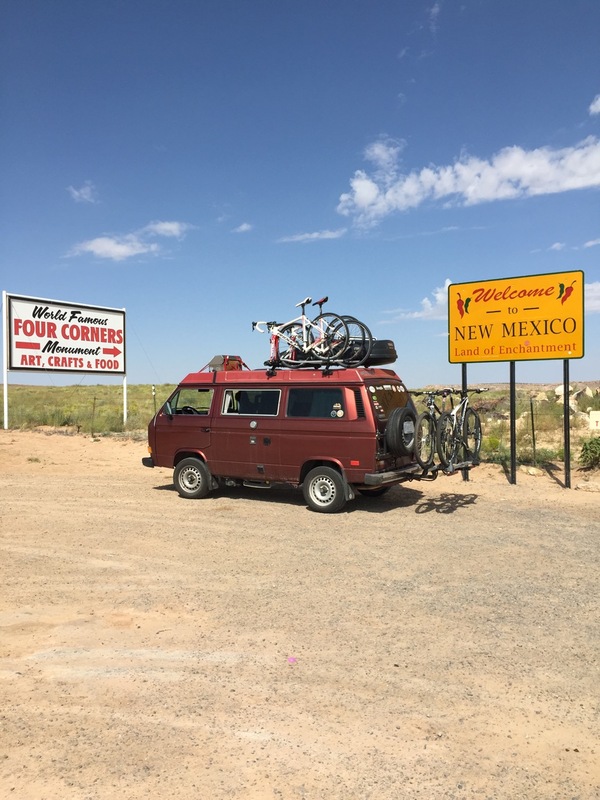 From Telluride, we headed south, towards the Four Corners area, where the borders of Colorado, Utah, New Mexico and Arizona meet at a common point. 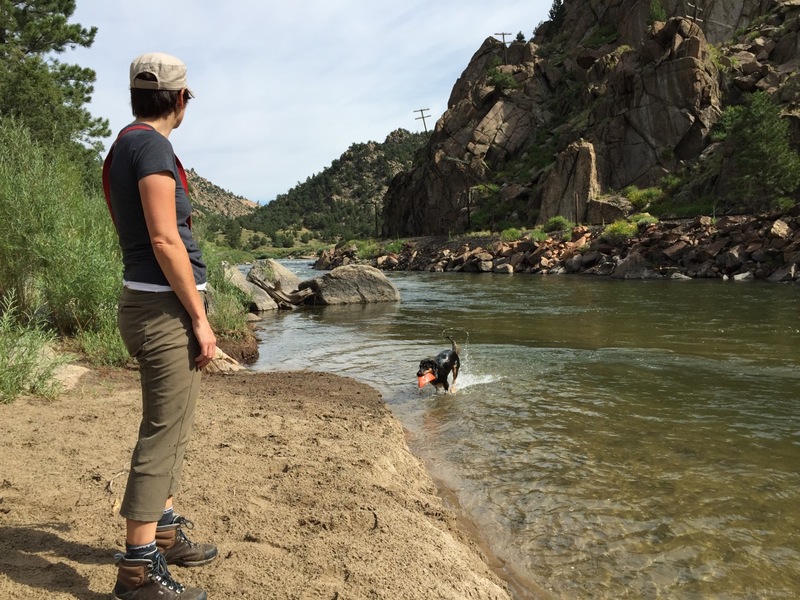 As the day was hot and we were getting a little tired of sitting in the heat (at least Bruno was), we did a little on the fly research and chose the McPhee Recreation Area (on the McPhee Reservoir) in Dolores, CO as our stopover for the night. The campground was quiet and although not exactly dispersed camping, we couldn’t see a single other camper from our campground. Typical of the National Forest sites, it was clean and well maintained. Once settled, we were anxious to get down to the reservoir for a swim. As we had done our planning on the fly, we didn’t realize that the trek from the campground to the reservoir was about 2km long through a nice enough trail through the almost desert like terrain. 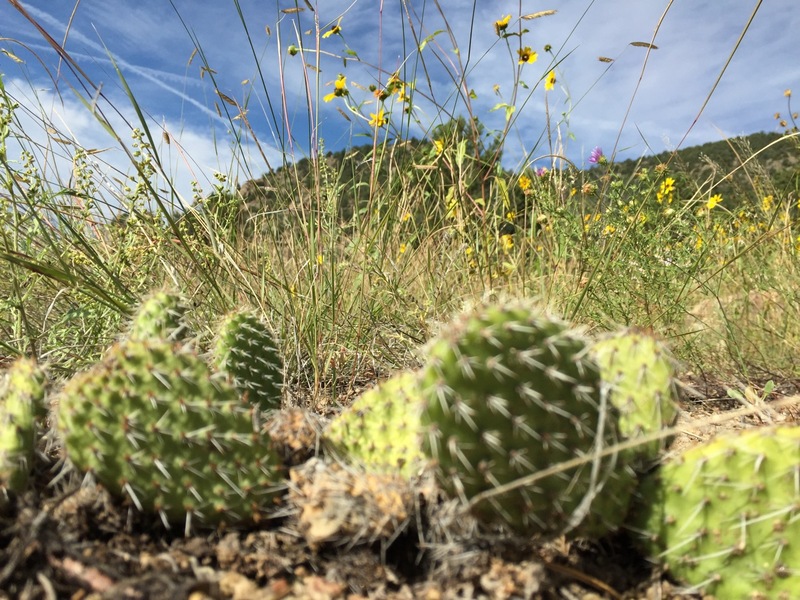 This hike introduced Bruno to cacti and other desert vegetation. We had to keep him on the short leash to ensure that we wouldn’t need to visit the local vet any time soon. 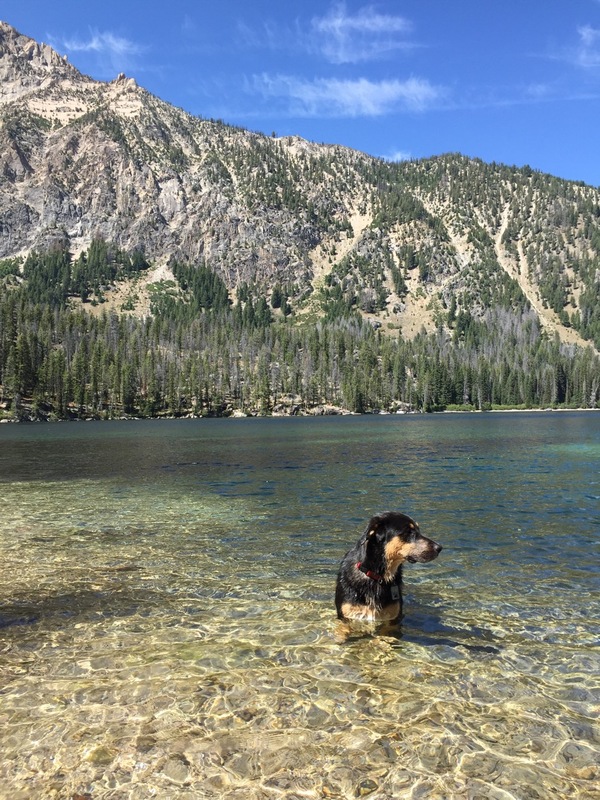 After the rocky descent to the lake, to our disappointment, we discovered that everything was built and geared towards boaters – no beach, no real good place for even Bruno to fetch his frisbee from the water. We scrambled a couple of hundred metres along the rocky shore to get us to a spot where Bruno could at least get a little swimming done and then headed back up to the campsite, disappointed and still hot. No pictures of this event exist, for it may be the best way to forget the “swimming” attempt. Back at our campsite, we relaxed for a bit and as the sun set, the temperatures finally started dropping to a more comfortable range. We kept Bruno on his long lead all night as there was continuous traffic of wildlife, mostly deer and rabbits, through the vicinity. Once darkness set in, I tested our new Nemo Helio camp shower, washing away the dust and sweat of the first really hot day of our journey. If I had paws, I’d give the Nemo Helio two paws up! The next morning, we did our best impression of a quick start as we knew that the temperatures would go from hot to hotter as we drove south, into the desert. Our plan was to drive to Four Corners and from there a short drive in Arizona to visit Monument Valley before heading north to Utah, in search of some elevation and cool(er?) nights. 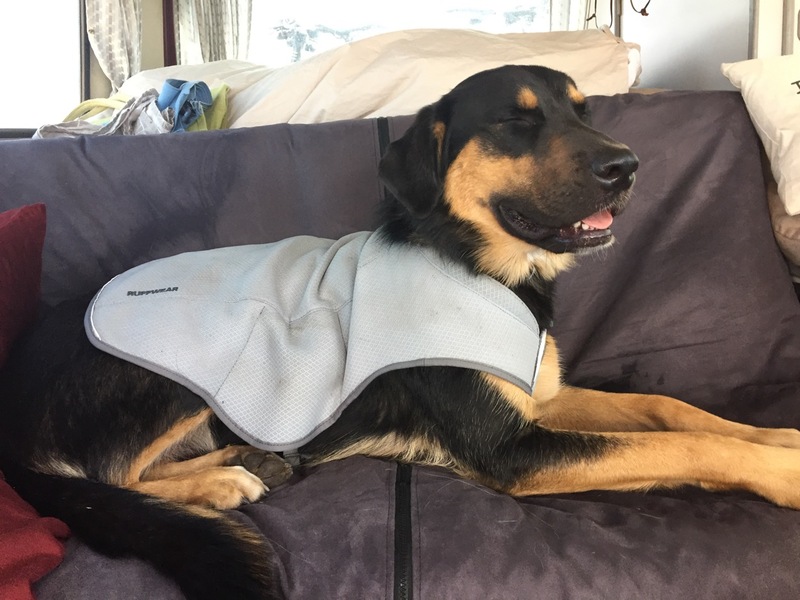 During the heat of the day, Bruno made good use of his Ruffwear Swamp Cooler jacket. The evaporative cooling really works in the dry heat! 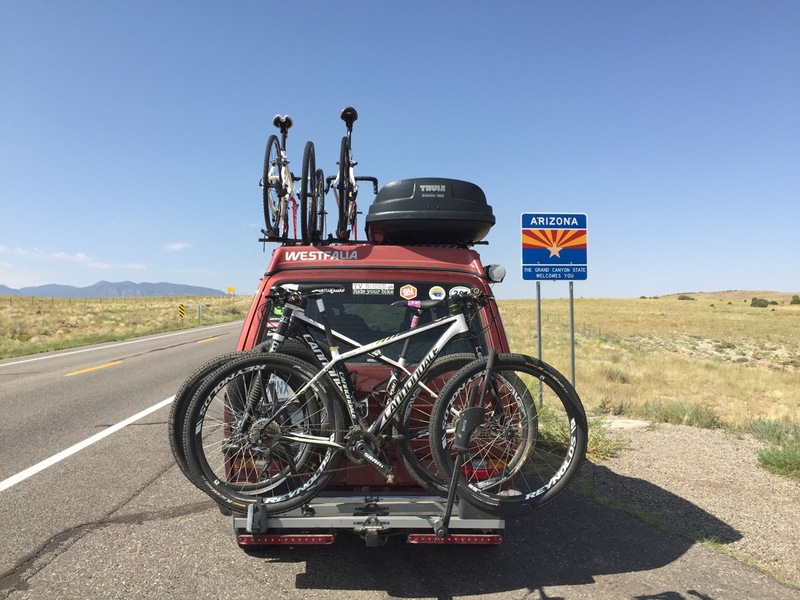 As we crossed state lines and arrived in Arizona, a voice in my head kept saying – “you’re close to Sedona, go ride the rails in Sedona!”, and we made yet another impromptu change in our plans. 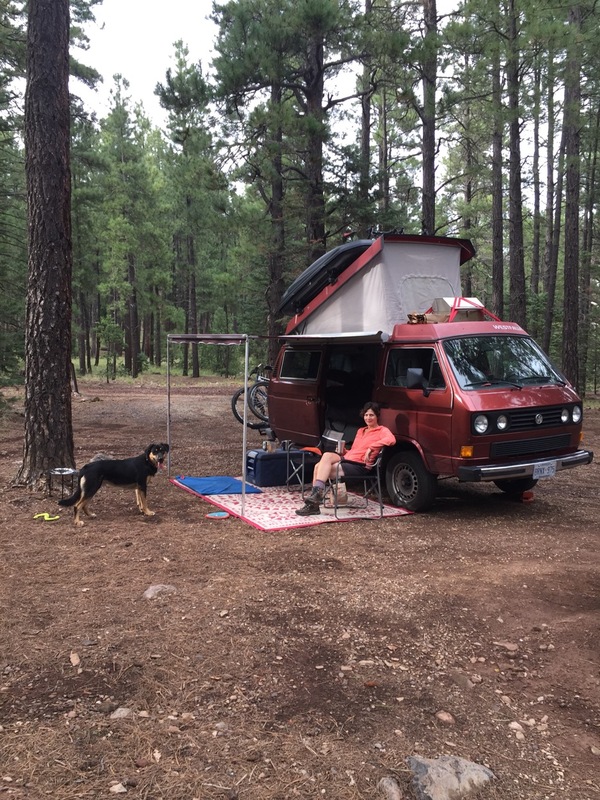 We chose to make the hot hot hot drive across the desert and ascend into Flagstaff for the night, where the arid desert of northern Arizona is replaced by beautiful Ponderosa Pine forests and mountain air. We choose to camp in the National Forest outside of Mormon Lake, at yet another nearly deserted NFS campsite. The lake, ironically, is currently completely devoid of water. Thankfully, Bruno accepted dry land frisbee action once again. Only two of the approximately 30 sites were occupied, including us. The $18 fee gave us toilets and fresh water fill up for Clifford, where as dispersed camping within the forest would have been free. 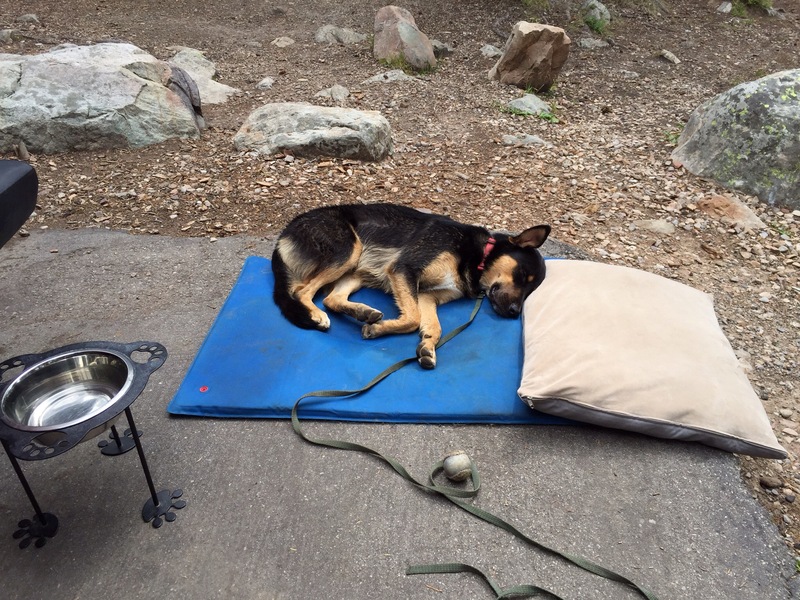 We felt the $18 was a small price for the few conveniences, especially since again, we could not see the other campers from our campsite and Bruno had free reign with his four frisbees and two balls for the entire stay. A definite two paws up from Bruno! 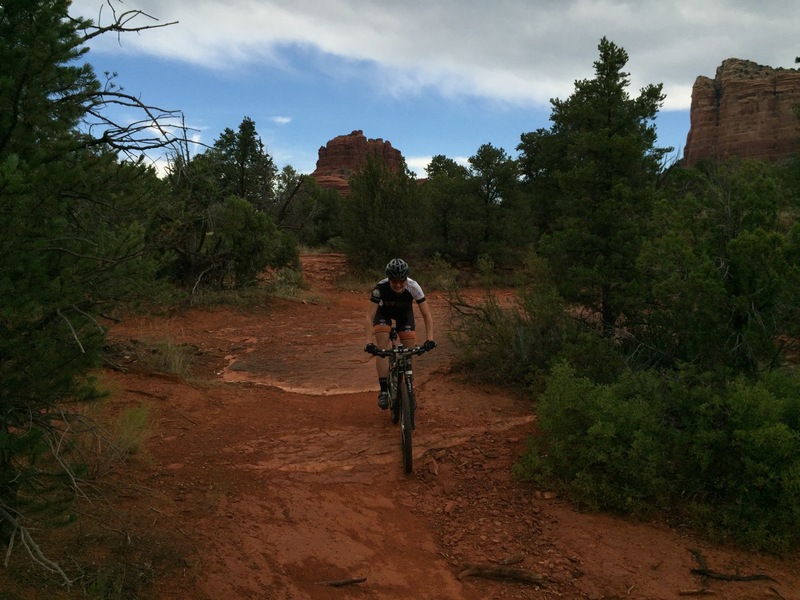 In the morning, we aimed Clifford toward Sedona and started searching for camping or other accommodations. The cost of house rentals in the area did not really fit our current travel budget, yet we were keen to find som accommodations that would offer all three of us air conditioning. 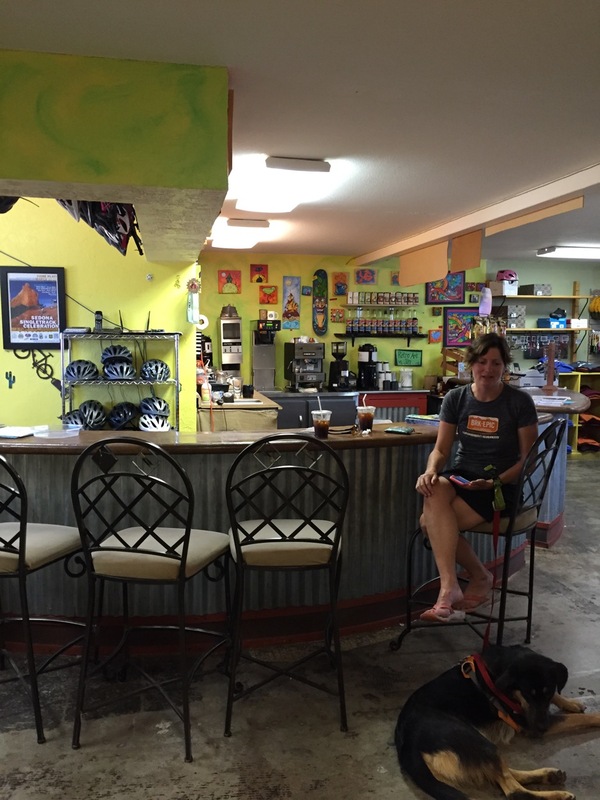 In the village of Oak Creek (kind of like Sedona suburbia), we stopped in at everyone’s favourite bike shop, the Bike and Bean, to pick up a couple of small necessities and to enjoy a nice ice coffee. 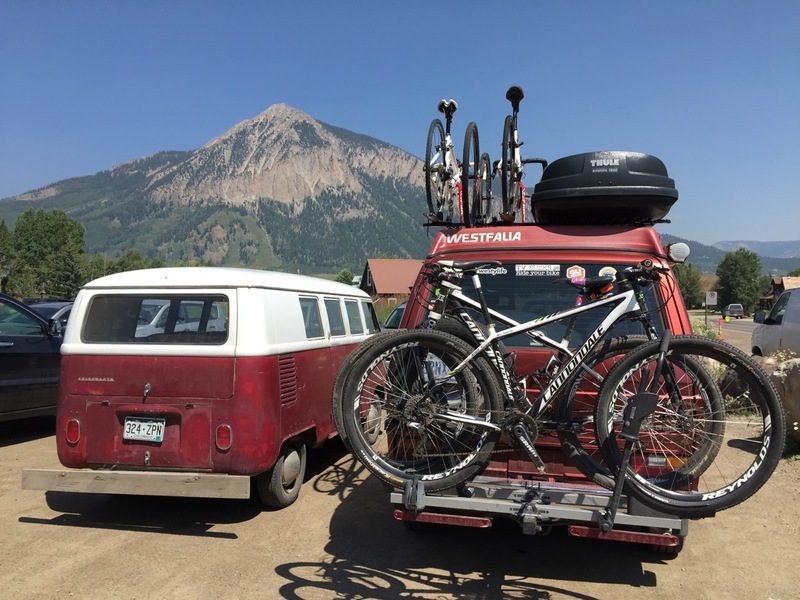 We mentioned our desire for non-Clifford accommodations due to the heat and they mentioned that they co-own Red Agave, an old resort that is almost adjacent to the bike shop as well as the trailhead. We decided to check it out. Success! The studio rooms provided sufficient space for us, there was WiFi, A/C, a pool and a pet friendly atmosphere. 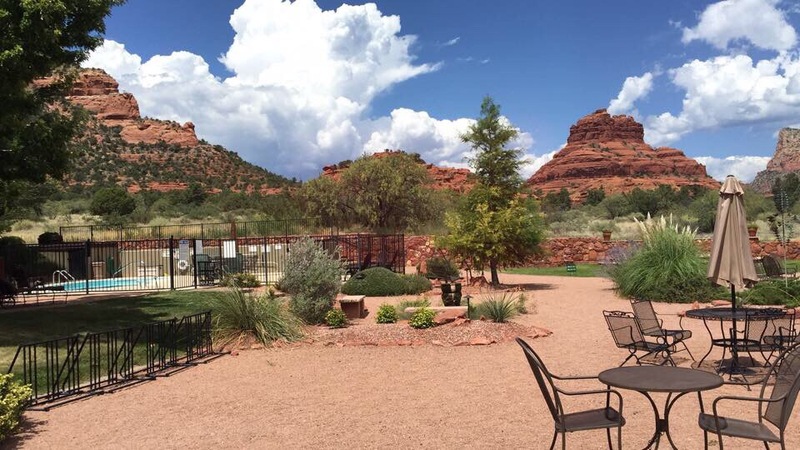 As August is the hottest month of the year in Sedona, the rates are at their lowest, and on a whim we booked ourselves in for three nights! This would give Robin and I a chance to get a few rides in and maybe even get Bruno accustomed to desert walks. The latter may be trickier, for the desert just doesn’t seem dog friendly. The view from our room was alone worth the price of admission. 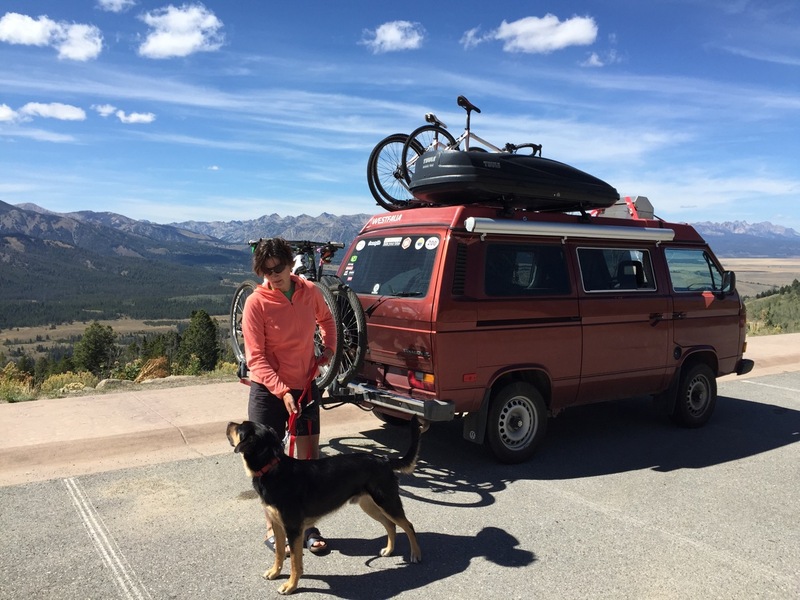 After checking in, we unpacked Clifford, Bruno and I settled into the comfort of air conditioning and Robin headed out for a little ride to the adjacent network of trails. 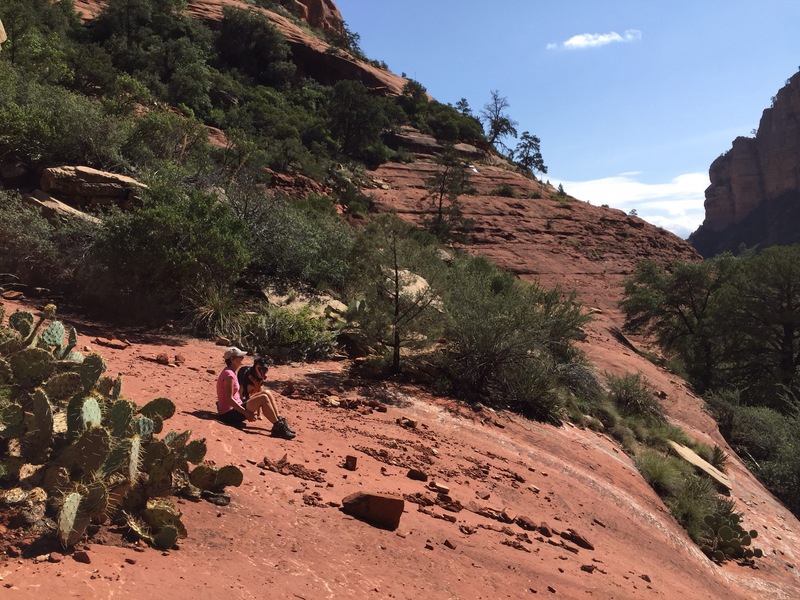 Next time – it’s a dry heat! 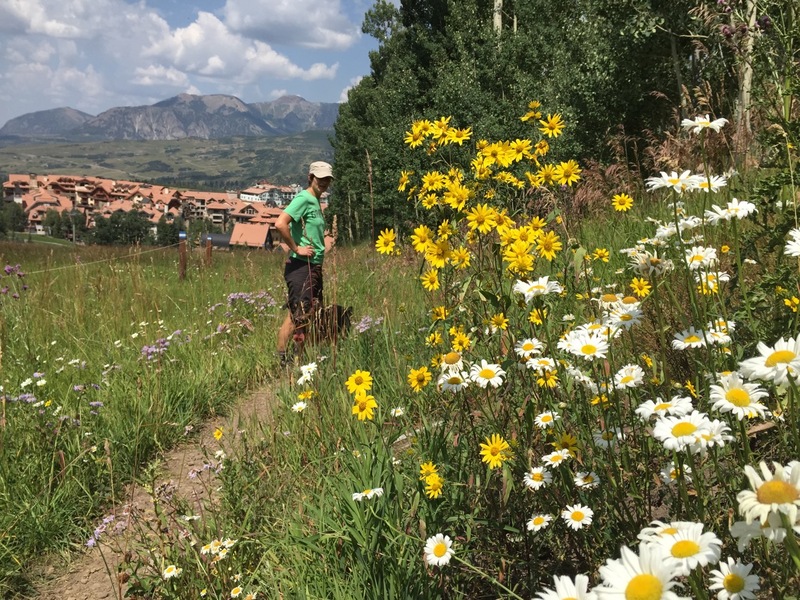 The area north of Crested Butte is famous for its beautiful vistas, wildflowers and amazing trails. After a stormy arrival on Monday night, we arrived to a beautiful sunrise (Bruno provides us with a complimentary sunrise alarm clock) and some cold weather. The frost was evident everywhere, so we bundled up, enjoyed our morning coffee and waited for the sun to start warming things up before venturing too far outdoors. Our site provided Bruno with ample play space, and we took advantage of this as we prepared for the hike that Robin had planned for us. 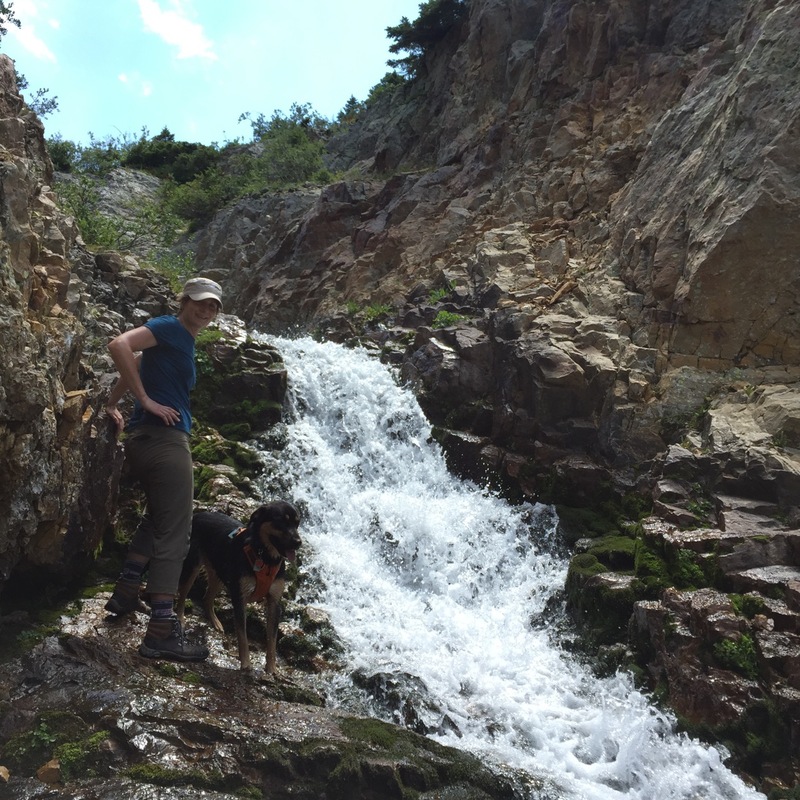 This hike took us down (up, then down, actually) Rustler’s Gulch Trail toward an old abandoned mining site and some waterfalls. After this five hour adventure, we enjoyed some relax time, although Bruno still wanted to play more, as usual. The second evening was much nicer than the first and we had a chance to sit outside and enjoy the diminishing daylight before moving into Clifford for the night. 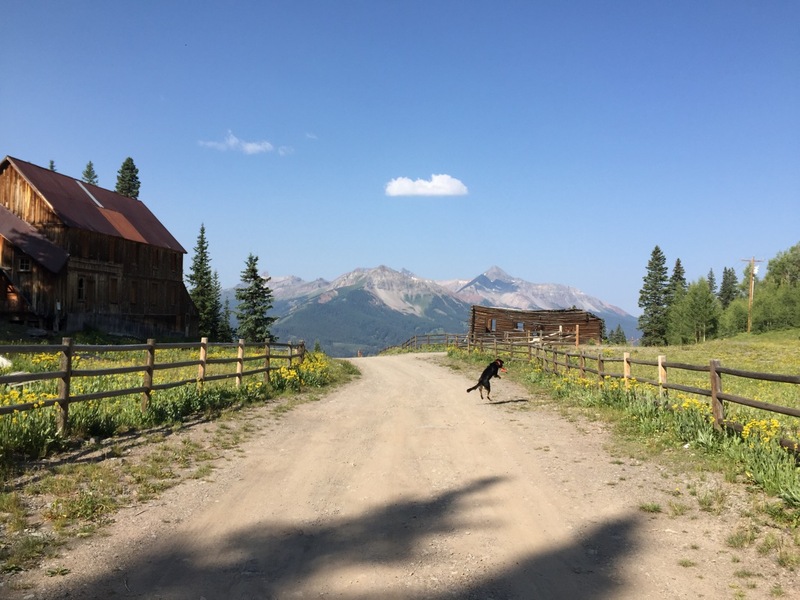 We had decided to head out toward Telluride on Wednesday, but before packing up and saying goodbye to Crested Butte, Robin went and rode the famous 401 trail while I had a nice relaxing morning playing with Bruno and getting Clifford ready for another move. 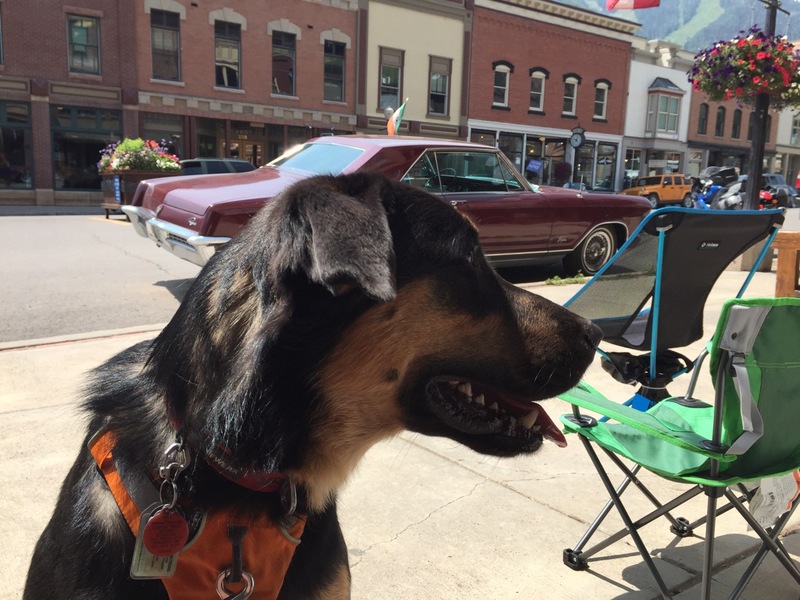 We stopped in the town of Crested Butte for a little tourist walk, searched for food for Bruno and even had lunch at a restaurant. How civilized! 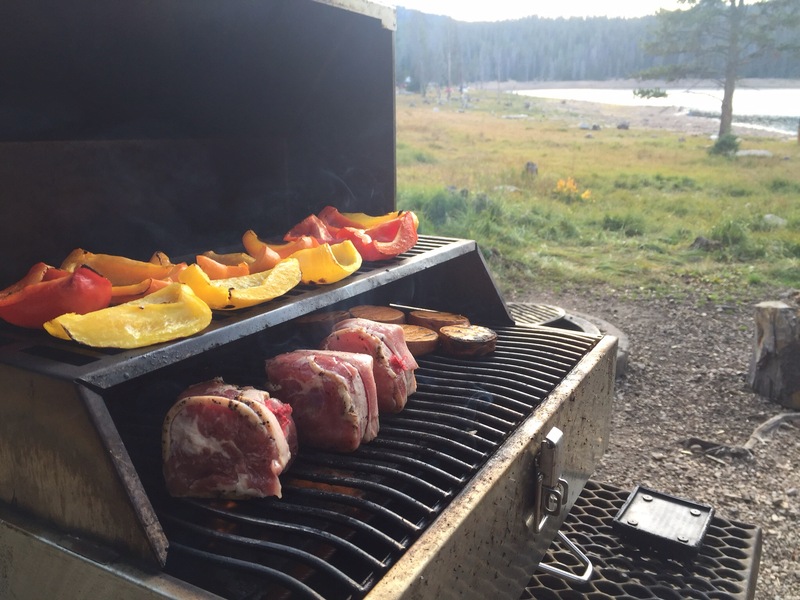 After dispersed camping where you really have no boundaries and very few rules, being at the KOA felt restrictive. 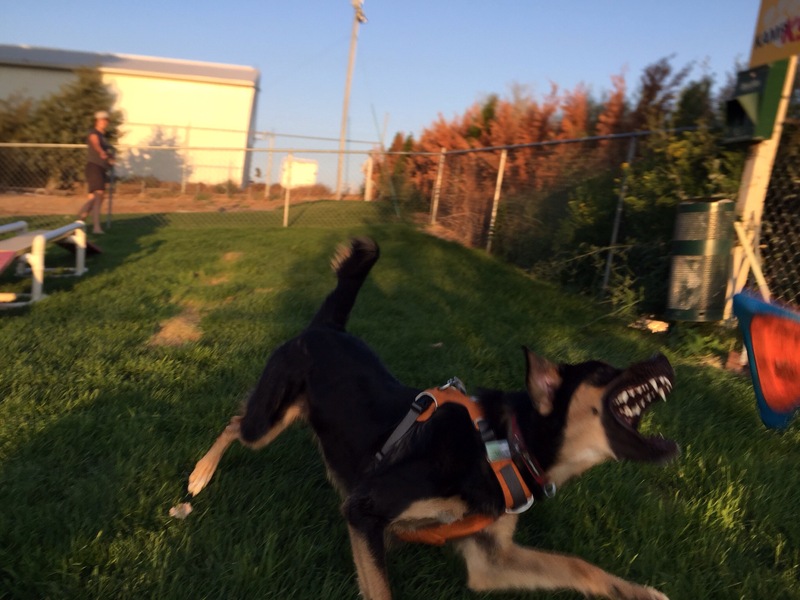 Bruno was not super excited about spending time on his leash, nor was he happy to have no free roam exploration rights. However, once nighttime set and we all got indoors in the cozy comfort of Clifford, it all felt right again. 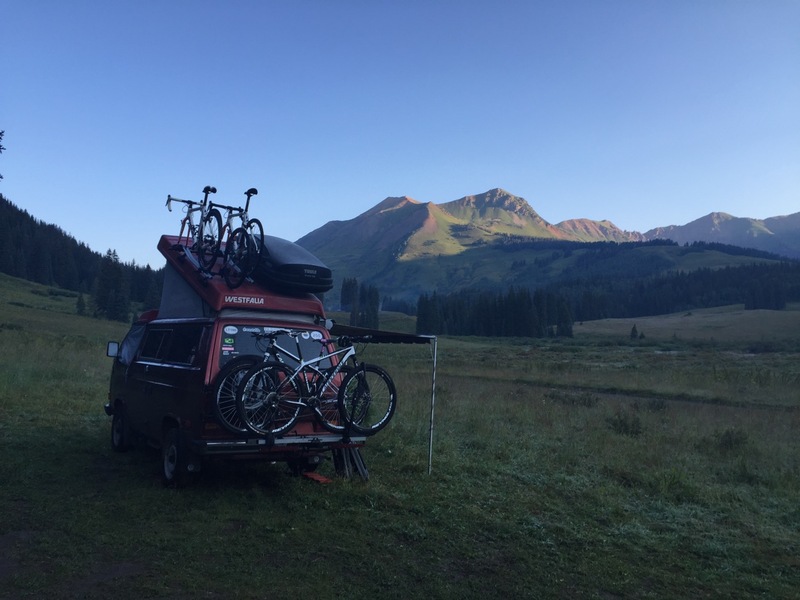 In the morning, we packed up quickly and headed to Telluride. Another beautiful drive and some sub 20mph climbing, we arrived in Telluride. The view through the town was postcard picturesque and we spent a little time walking in town to stretch out legs and play tourist. 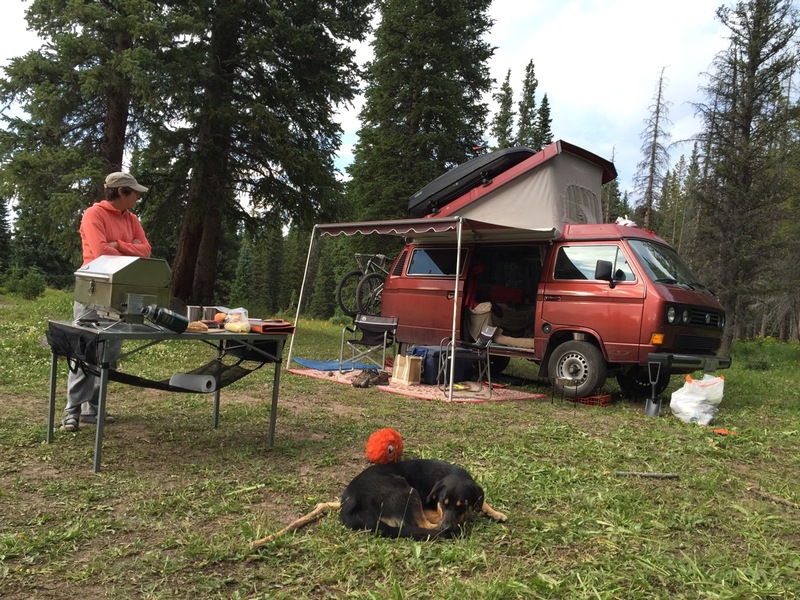 Our camping destination was the area of Alta Lakes, only a short drive from Telluride, Robin and done some research and the site looked promising. 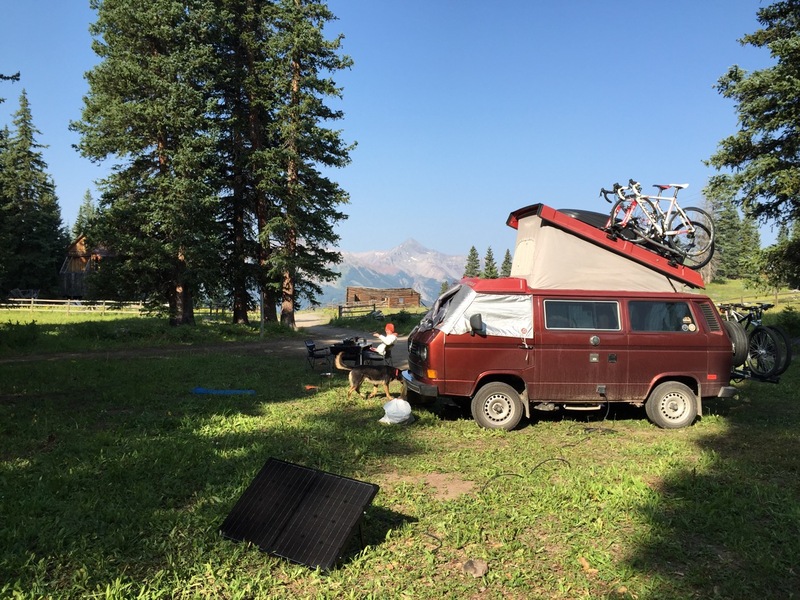 Remote, high altitude lakes, a ghost town and lots of camping opportunities. The last part of the drive was a 4 mile climb on a steep switchback littered forestry road. Clifford chose to do most of the climb in first gear, until the last section where first gear wasn’t low enough (or Clifford’s power wasn’t quite sufficient) and we had to retreat very slowly backwards to the previous plateau and rethink our strategy. We ended up not attempting this last bit of the climb again and chose to camp about 500m away from the lakes in the midst of the ghost town of Alta. 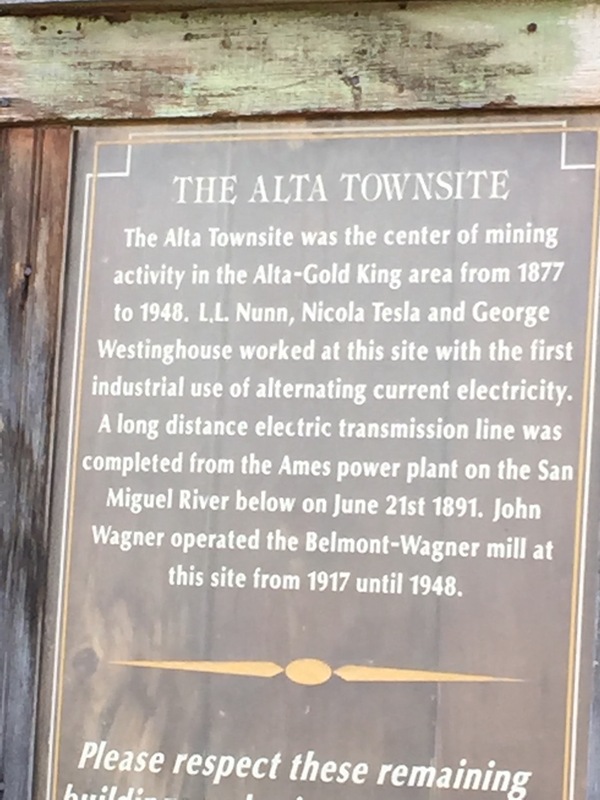 Alta is historically significant as this is where George Westinghouse and Nikola Tesla first experimented with the use of alternating current in a commercial operation. More trails and beautiful scenery, albeit very different from the open vistas of Crested Butte. Bruno gave the lakes two paws up! 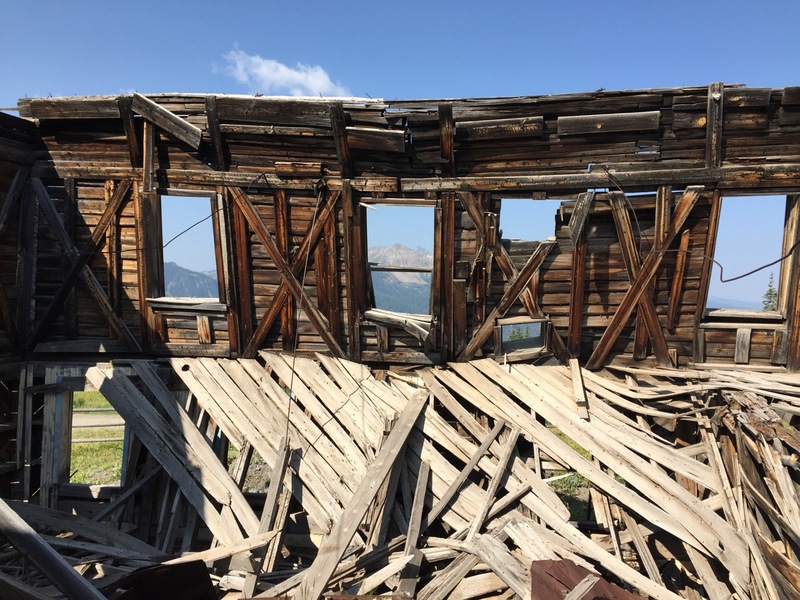 We explored around the ghost town, but stayed clear of going indoors to the few buildings that are still standing fully intact. 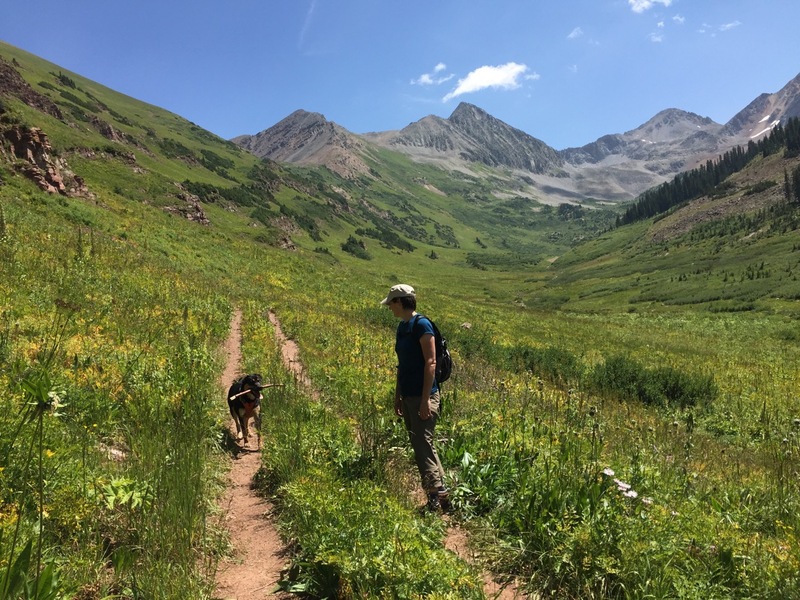 Next time – Telluride hiking and more! 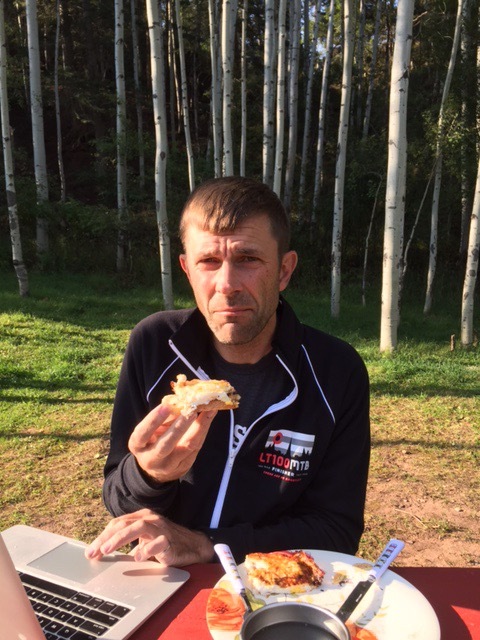 The award ceremonies for the LT100 are on the Sunday morning after the race, starting at 7:30am. We set our alarm for 6am to have a chance for breakfast and start re-packing Clifford. We joined our teammates and our most wonderful crew members at the award ceremony and after receiving our buckles we had one more chance to record a team moment before everyone headed off in their various directions. 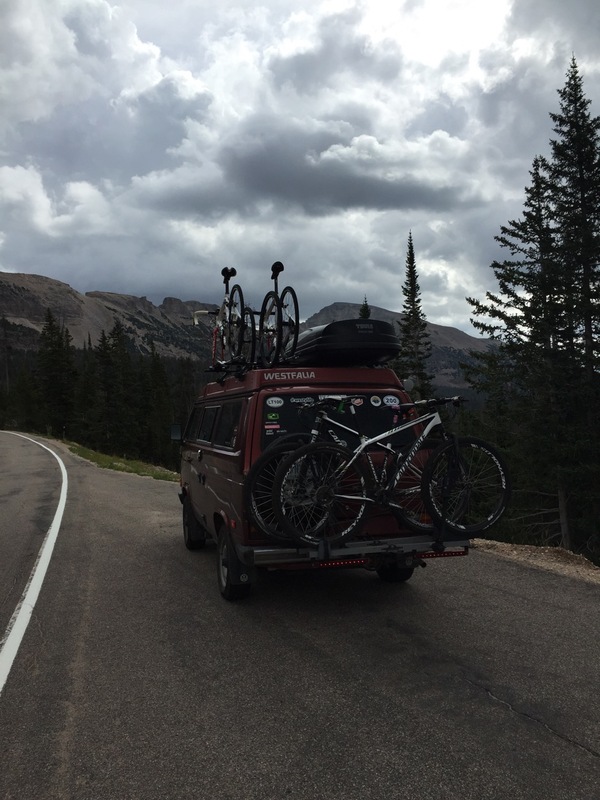 Our plan for the day was to pick up Bruno from Breckenridge adventure camp and then head over Hoosier Pass one more time to camp in the Salida area on Sunday night. Picking up Bruno was exciting for us, spending three days away from him had seemed like an eternity! 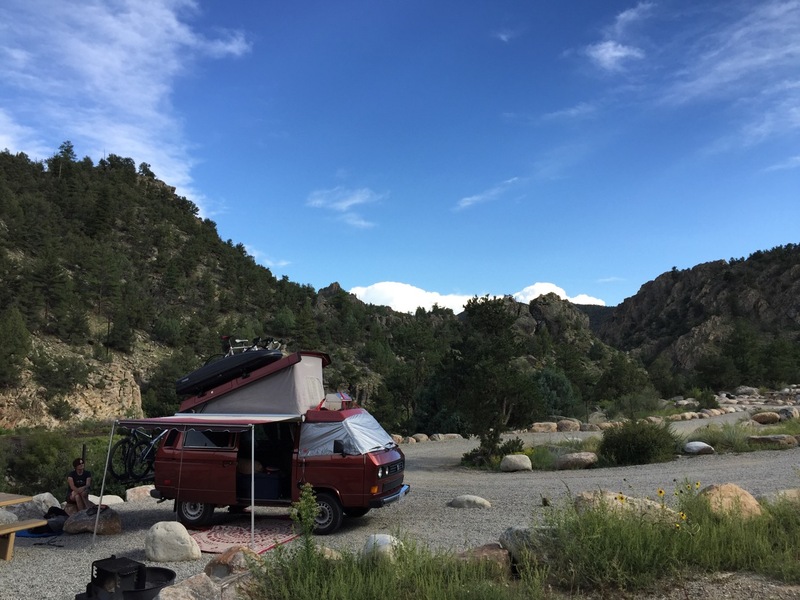 We arrived in Salida area and found a wonderful quiet camping spot on the Arkansas River at Brown’s Canyon. The landscape in this area was very different from the Leadville or Breckenridge area, almost desert like. In fact, we found our first cacti of the trip here. It was a beautiful sunny day, in fact it was scorching hot. If our vehicle was modern, I could tell you what the temperature was, but the only digital numerical display Clifford has is his clock. Let’s just say it seems desert scorching hot. At least until the late afternoon thunderstorms brought hail and rain upon us. The next morning we drove into Salida, a quaint town that appeared to have lots of character without the touristyness of many Colorado towns. 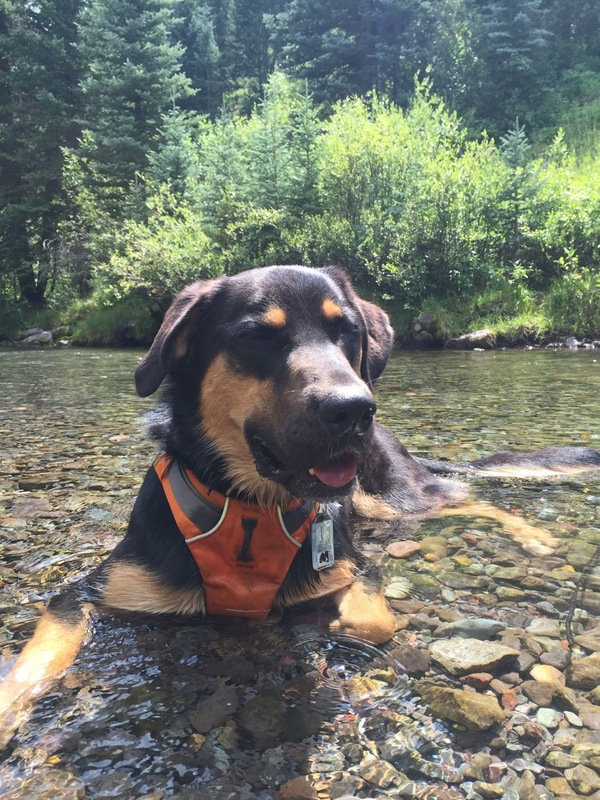 Here we found Bruno a Ruffwear Front Range Harness, our current last hope of reducing his tendency to pull when on leash without resorting to a halti harness. Bruno was possibly less excited than we were about our purchase, but Robin and I were both optimistic within minutes of putting it into use. 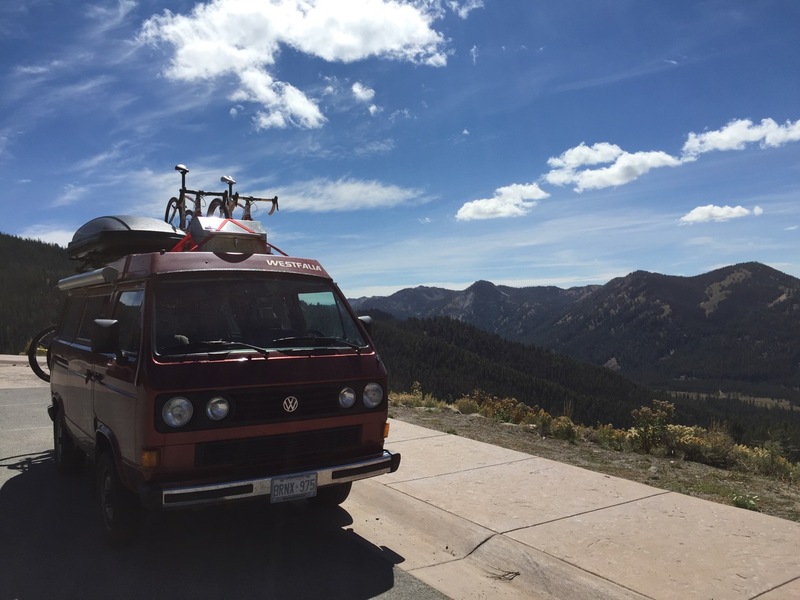 After our stop in Salida, we pointed Clifford toward Gunnison, Crested Butte and Gothic Road. 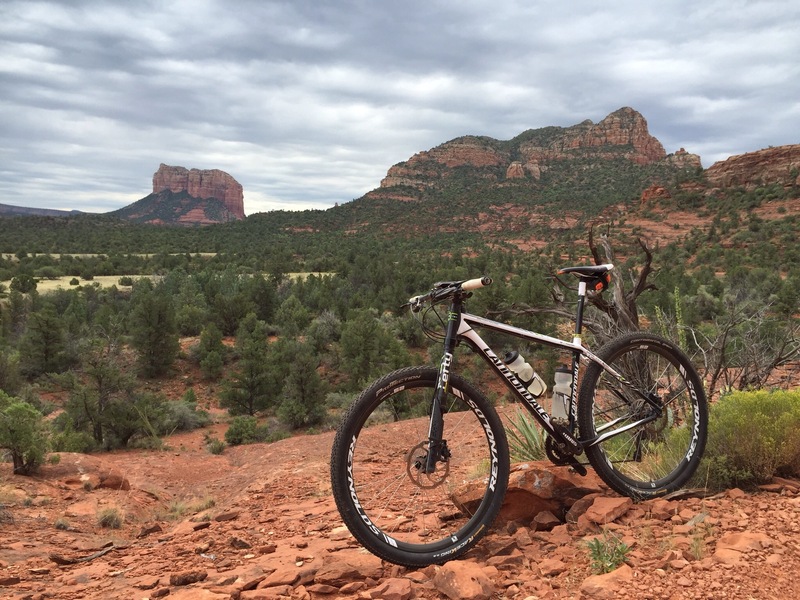 We had high hopes of the scenery and the trails our next destination would provide. Again, the drive provided scenery that ranged from beautiful to really stunning. 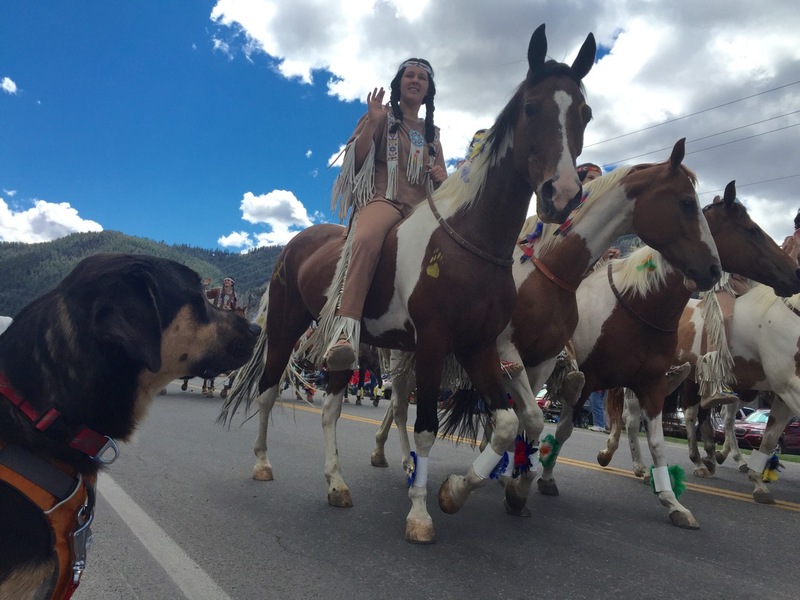 The high plains around Gunnison had me looking for John Wayne and his men, riding their horses in search of the villains. Crested Butte looked nice, but we pressed through toward our destination. The road climbed into Crested Butte Mountain, the resort centre built just north of the old town. Once we had passed the resorts, the perfectly smooth paved road turned to gravel. Clifford seems more in his element on the gravel back road than the four star resort road. As we got further and further on Gothic Rod, the surface became more and more challenging. The potholes and general unevenness meant that we crawled along in first gear, for the tall load on Clifford require for us to be extra careful. Here we also encountered our first climb that required a second effort before we made it to the top. 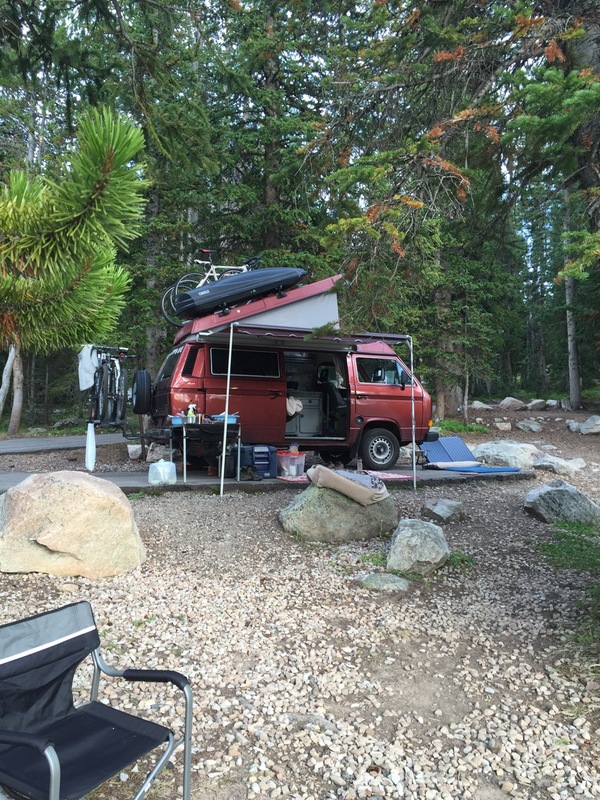 Once we arrived in our planned camping area, we found the four official camp sites occupied. 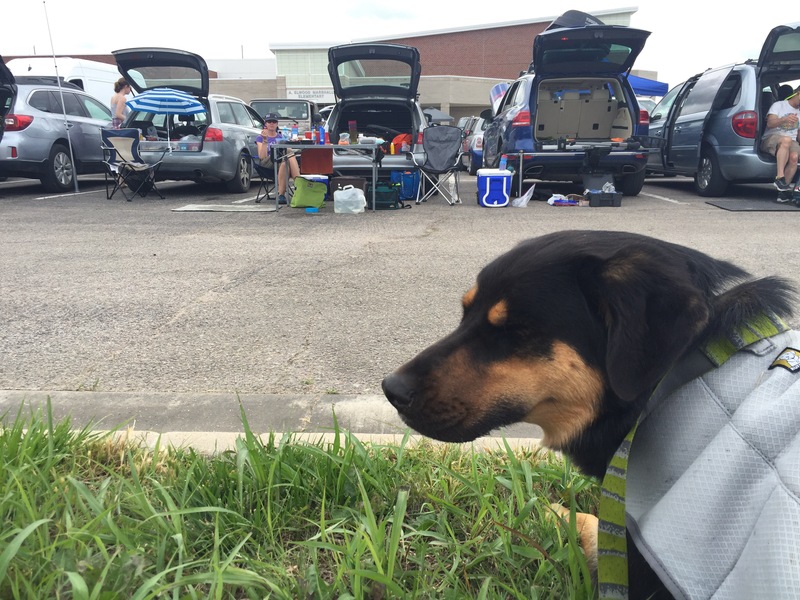 This was not a crisis, for dispersed camping with Clifford can be quite pleasant. 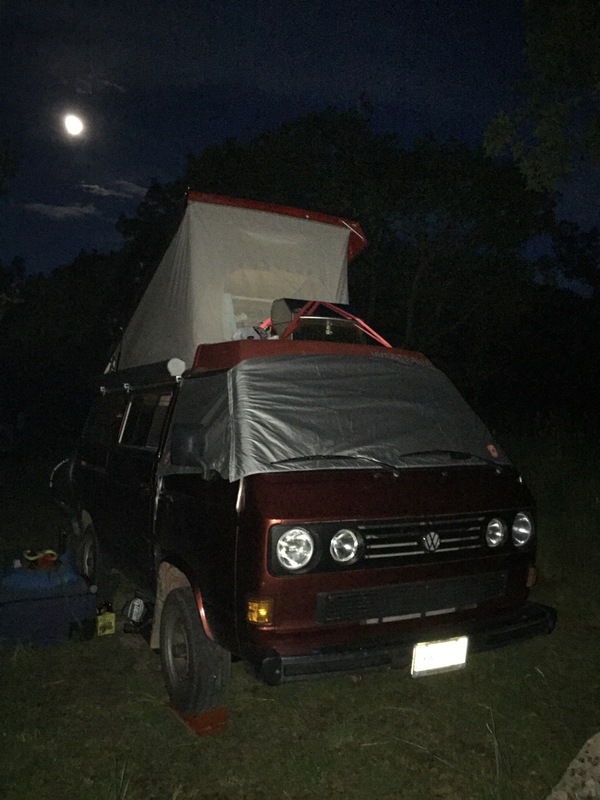 We drive a short distance from the “campsite” down the rod and pulled in at a trailhead parking area, assessed it quickly and decided to make it our home for the next couple of days. The beautiful warm sunny weather had followed us all day, but as we were setting up, the weather once again turned nasty. This thunderstorm was more intense than any we had experienced previously. The lighting and the thunder were intense enough that even Clifford was trembling. Once again, we encountered hail, this time in conjunction with high winds. We bundled up inside Clifford and waited it out as evening turned into night the next morning would likely bring blue skies and sunshine. It is Colorado, after all. 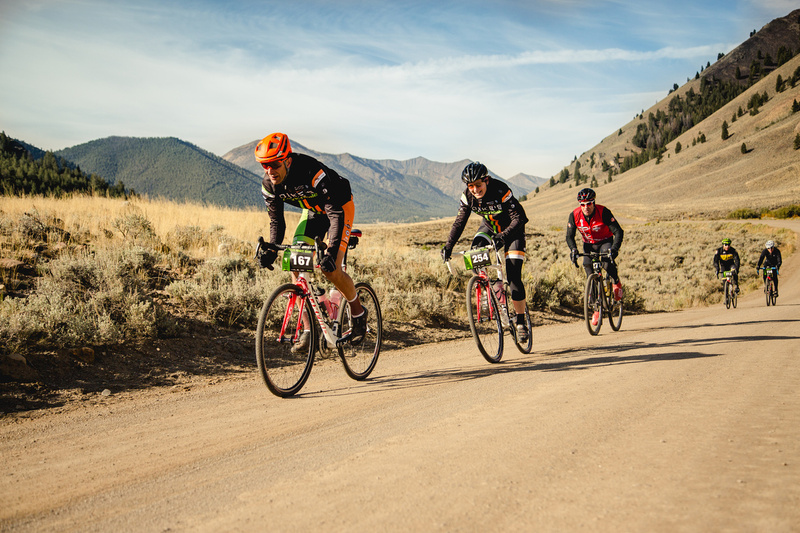 Yeah, we raced our bikes last weekend at the LT100, and I’m just now getting around to writing about it. It’s one of those things where you leave everything out there and once the next day rolls around you don’t really want to relive all the moments over again. 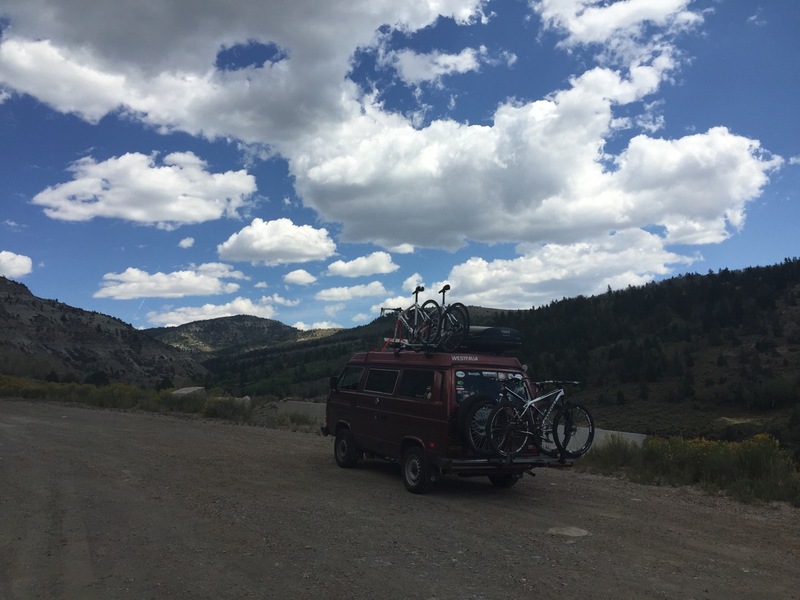 After camping at Turquoise Lake for four days, we had rented a house in Leadville for three nights for the race to provide us with some good sleep, washing and laundry facilities. 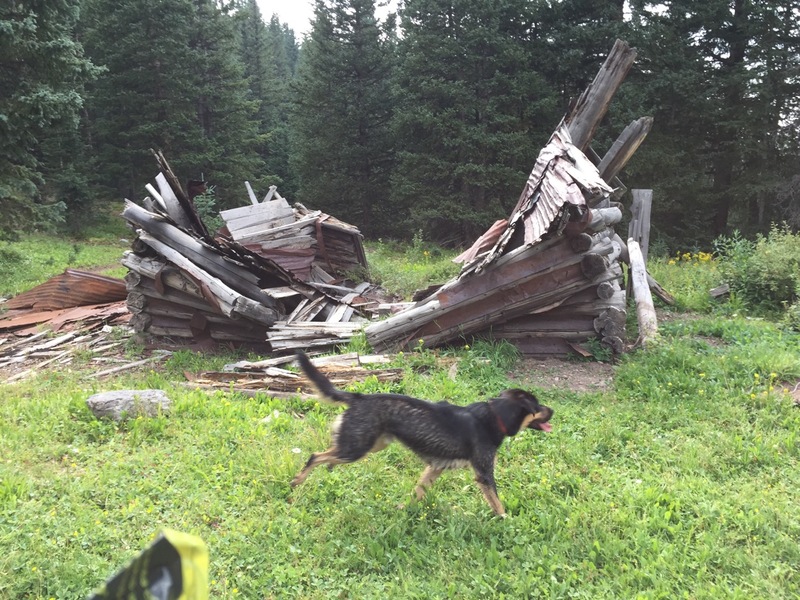 We had set up a play camp for Bruno in Breckenridge for the time we had the house, so we dropped him off after we departed Turquoise Lake and before going to the Leadville house. What’s a few more mountain passes for Clifford anyhow, he’s quickly becoming a veteran of the mountains. 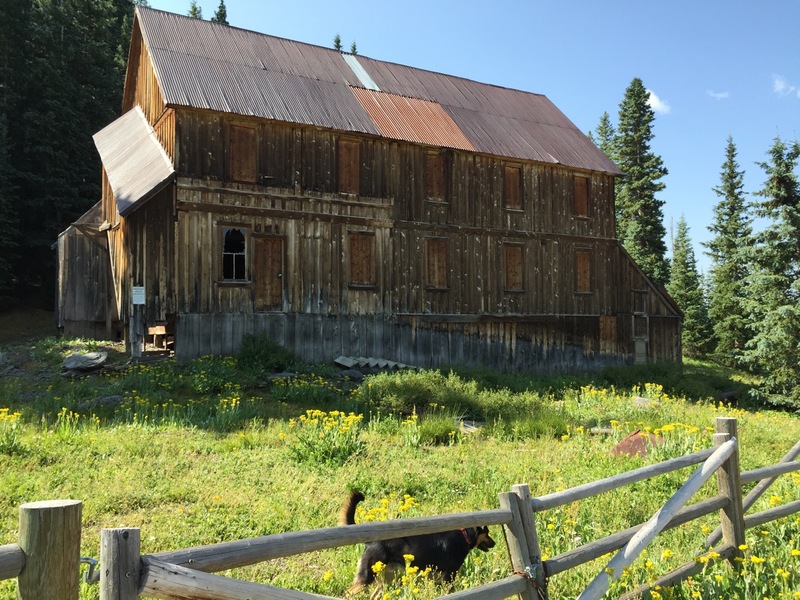 We set up at the house on Thursday afternoon rather painlessly, for it was the same house as we had rented two years ago in our first Leadville Trail 100 adventure. After we had unpacked the necessities from Clifford to the non-mobile house, we settled down for some television. After nearly two weeks without any TV, it didn’t seem like it was any better than I remembered. Friday afternoons afternoons we delivered the box with our bottles and other nutrition to our support crew who were staying at Sugarloafing campground. I recall there were ten bottles of Roctane and close to twenty Roctane gel packs in the box. 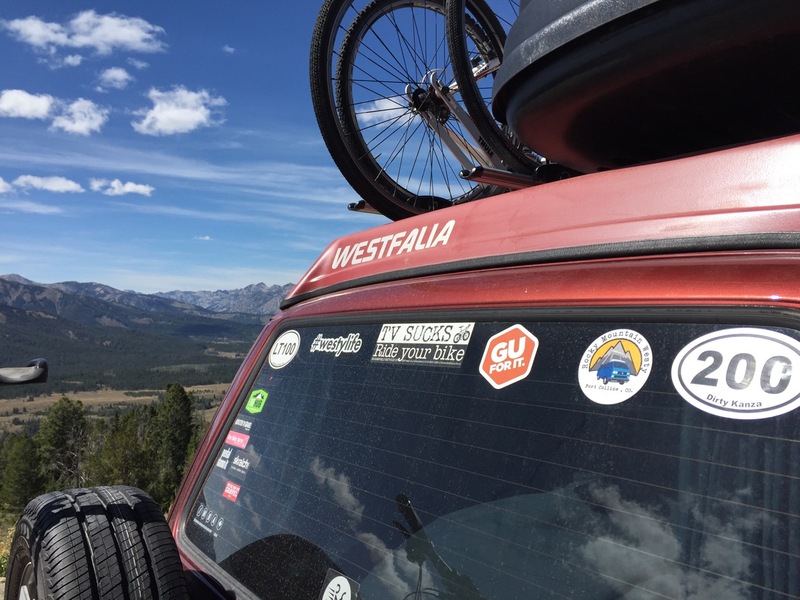 Our most wonderful crew members were going to be there for us at the Twin Lakes area on our way towards Columbine Mine and again on our return from Columbine Mine towards the return to Leadville. The evening before the race was pretty relaxed, Robin prepared some chicken, rice and some veggies for us to fill our bellies, we also shared a bottle of red wine. Why change habits that have worked for you? Race day, Saturday, alarm went off at 4:30am. We had some scrambled eggs, rice and salsa for breakfast. I had a lot of breakfast. This is my thing before long races and that works for me. After eating, we packed up our bikes, got dressed up in our chosen kits for the days and headed out. Two years ago, we had ridden to the start from the house, but it was dark and cold. It also took twenty minutes. This year, we had chosen to drive downtown, park (one of our team mates had offered us parking at his rental house) and ride two minutes to the start corral. Fantastic. Except…half way to downtown, Robin realized we had forgotten our start bottles at home! We turn Clifford around, go get the bottles and get to the start area a little later than we had envisioned. Robin and I scrambled a bit to get to our respective start corrals and settled in, waiting for the shot gun that would set us off on the course. The gun went off. We raced. We finished. It was a tough day as expected, and even tougher for Robin as she suffered some completely unusual challenges with nutrition. Her finish time certainly did not reflect the “dig deep” effort she put forth, for I think most of us would have called it quits after visiting the medical tent midway through the race. 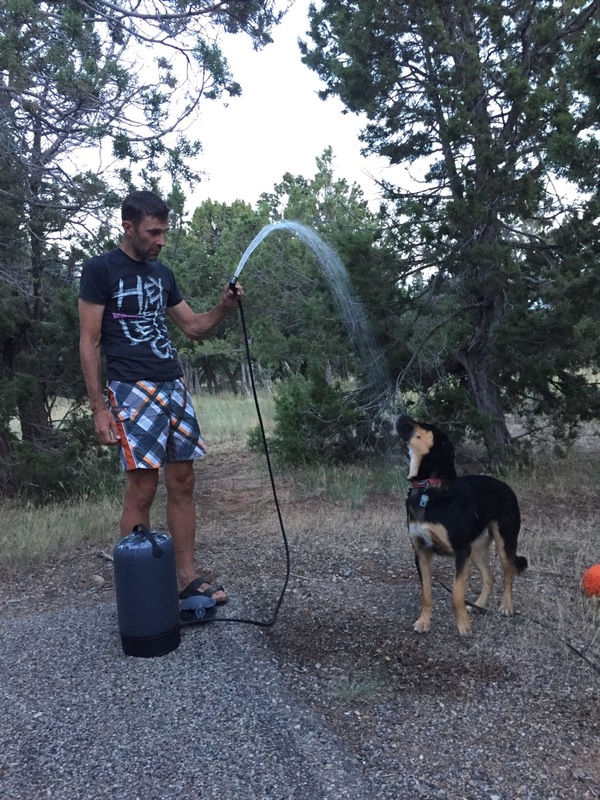 For me, looking back, had I trained as I planned since the Dirty Kanza, the time result may have been different. However, I left every bit of energy on the course and finished in 9h39 and something. A long way from my sub nine hour goal that I had set for myself last year. But somehow, after DK200, training and the LT100 race itself seems somewhat anticlimactic and the result shows it. After the race, we had very little to no energy left for any post race celebrations. It was off to bed early after a little food and one beer. Now we are going to enjoy a little non cycling holiday. 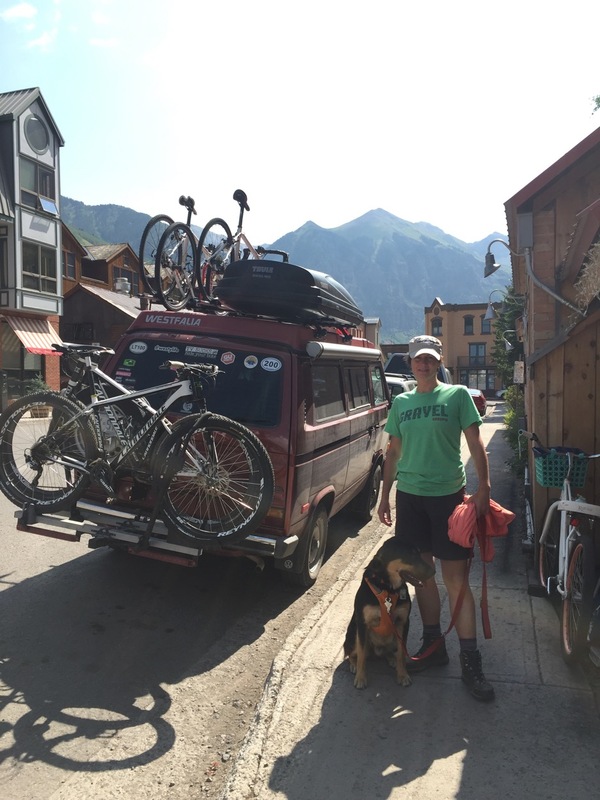 Our plan is to head towards Crested Butte for a few days of hiking and relaxing. We’ll see how that goes next time….